my OPS bro & his friend caught 29 fishes in 7hrs at the pond recently. 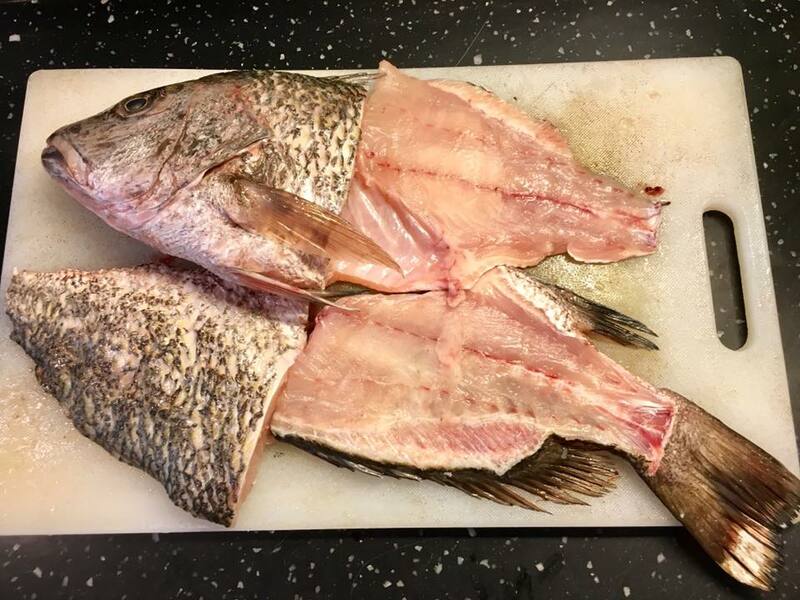 he gave me 2 huge fishes=>2kg garoupa & >1.5kg golden snapper..
Poached garoupa in superior broth (chicken+fishbone)-this one nothing to do. we had 7pax this evening = my wife & i, 2 OPS bros & their wives, and another OPS bro. 4 of us (these 3 OPS bros & I) had the most wonderful trip together to hong kong recently in feb2017 = hong kong eat & hike 20-24feb2017. 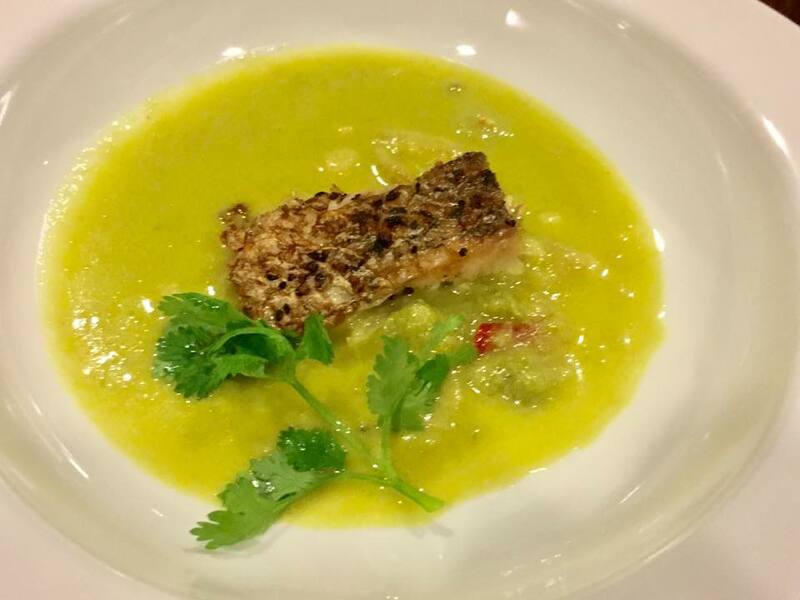 my first course was a panroasted snapper fillet in green jalapeno chilli veloute. very good i thought. 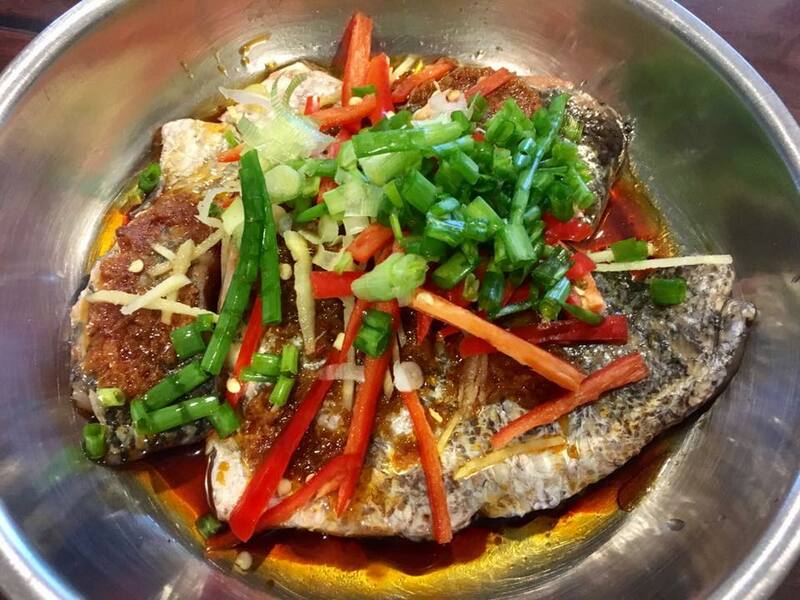 snapper was flavourful & the sauce had body & was just the right texture not too viscous, and just spicy enough. 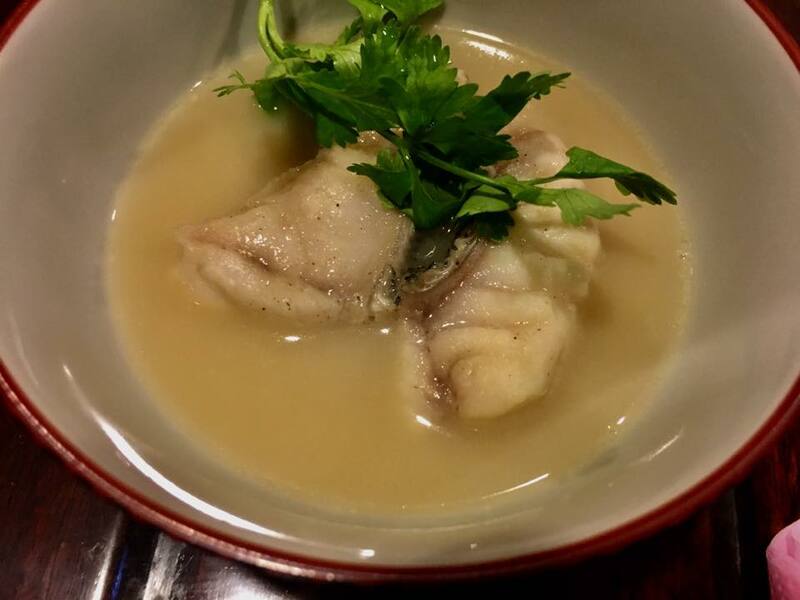 second course was poached garoupa in superior chicken & fish broth. the garoupa fillet was excellent=so fresh, perfect texture & sweet. for me it was very good. the soup was tasty, intense goodness. 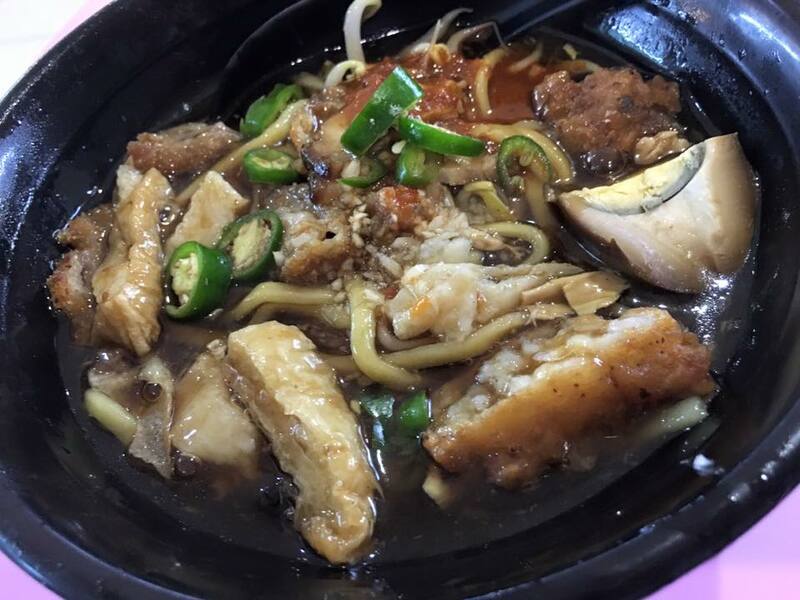 similar to the fish head thick beehoon soup variety. for wife it was a bit fishy, i had forgotten to add ginger. usually i cook chicken stock so do not add ginger. since i added fish bones this time, should really have added. my friend commented that the soup would have been perfect with ginger & whole pepper. i thought so too. for me the soup was very good & smooth (albeit fishy for wife) but of course would have been better with ginger & whole pepper. i will do that next time. 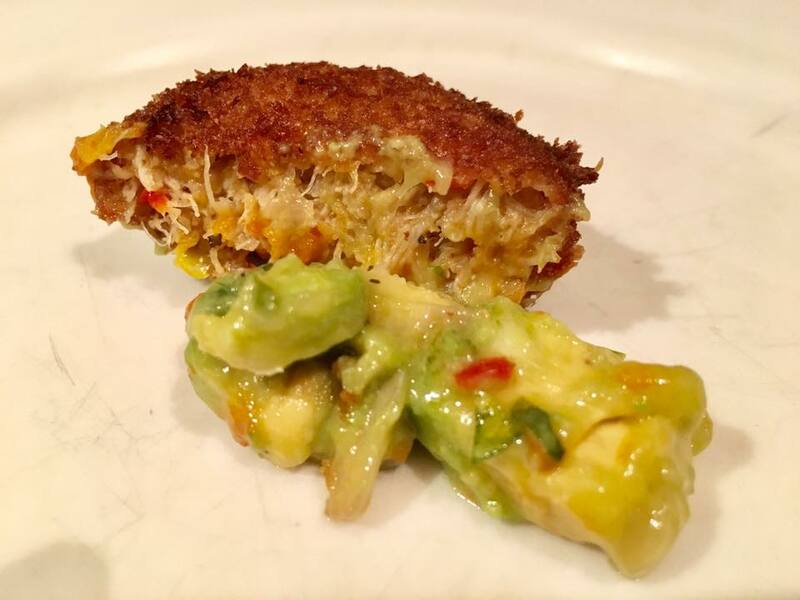 the first 2 courses i served in individual portion. the planned dining logistic was to reuse the bowl & dish for the first 2 courses for the rice & the next 3 dishes served together. 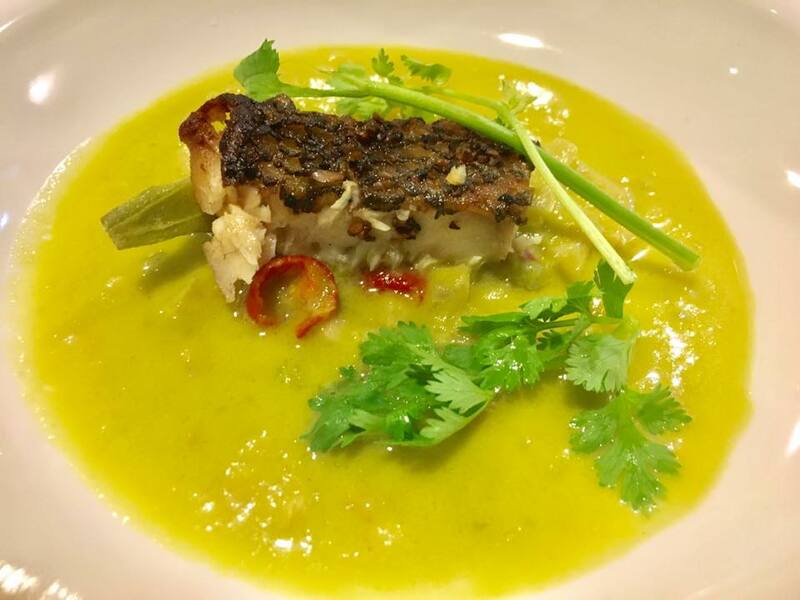 3rd dish was nonya steamed snapper fillet. 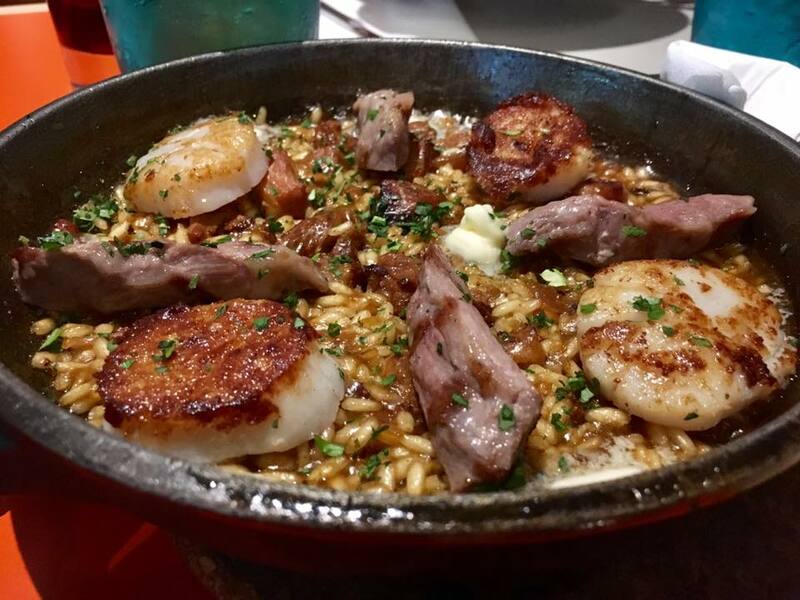 this dish everyone liked, including wife. 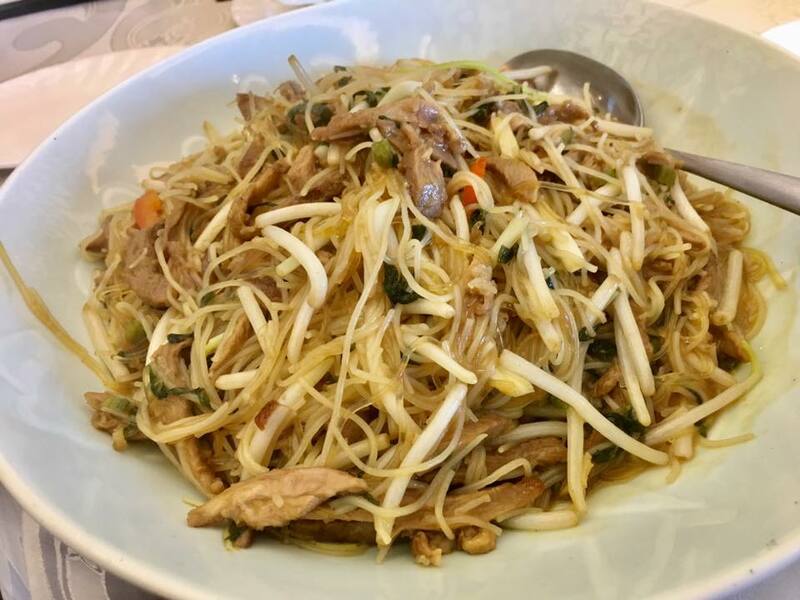 it was flavoured by the good quality light soy sauce, and with the tangy, slight sour taste of the nonya sauce, excellent combination. 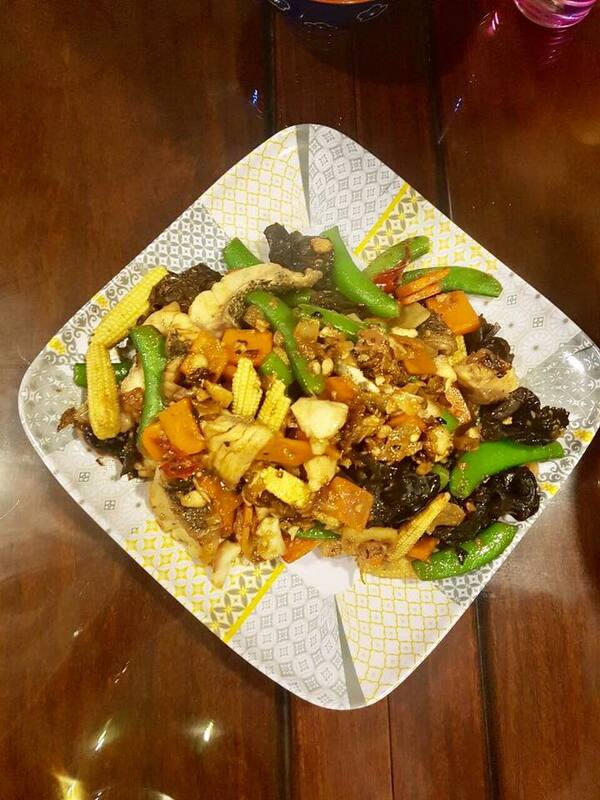 the 4th dish was garoupa fillet fried with sweet peas, baby corn, carrot, onions & snow fungus. 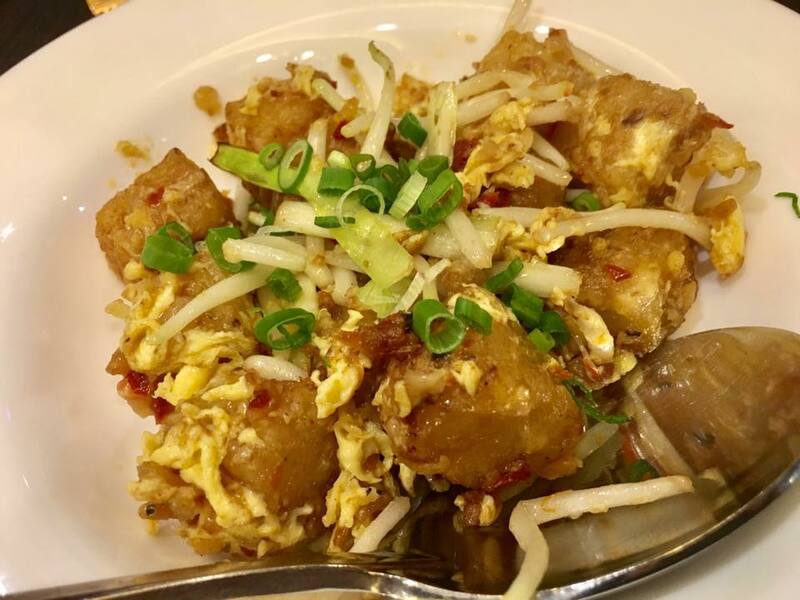 very tasty dish & good wok hae. i kept the wokpan quite dry, just adding little bit water as required. 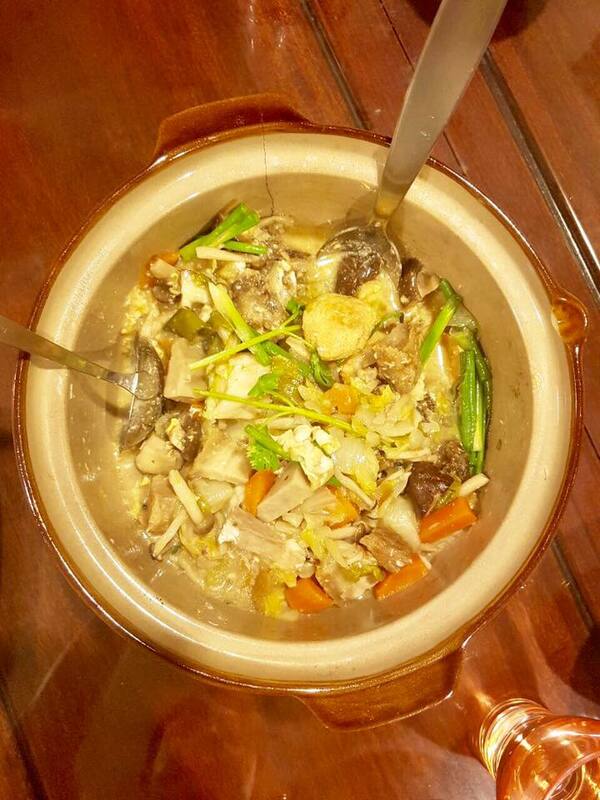 the claypot fish head was my first attempt. for me it was very good! 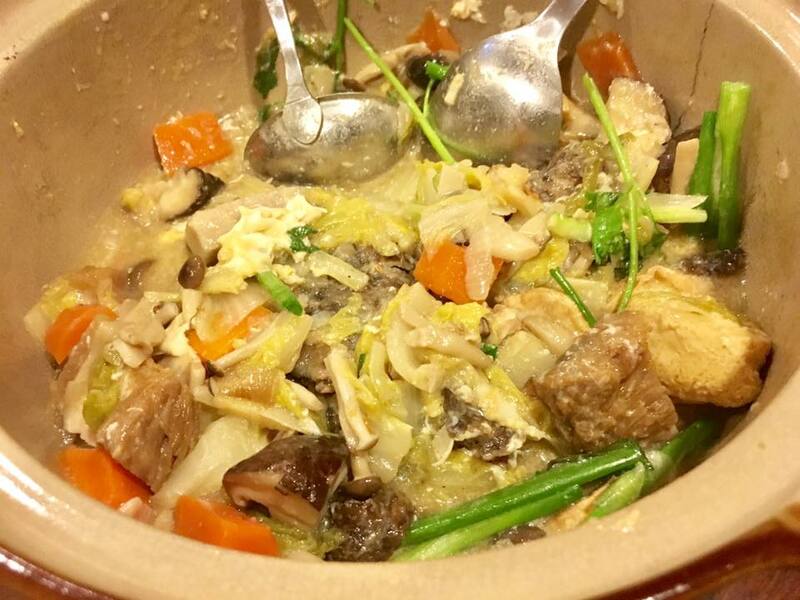 the vegetables (onions, chinese cabbage, carrots, shitake & shimeji mushrooms) made the base very naturally sweet. & i had deepfried egg tofu, yam, sio bak (roast pork) & of course the deepfried garoupa fish head which was itself very “pang” = flavourful. the dish was very tasty even standalone w/o adding the fish head la! i was most happy how it turned out but it was quite a lot of work, especially as this was the first time, so the steps, planning etc were more uncertain & hesitant…still it was fun & the results were rewarding. 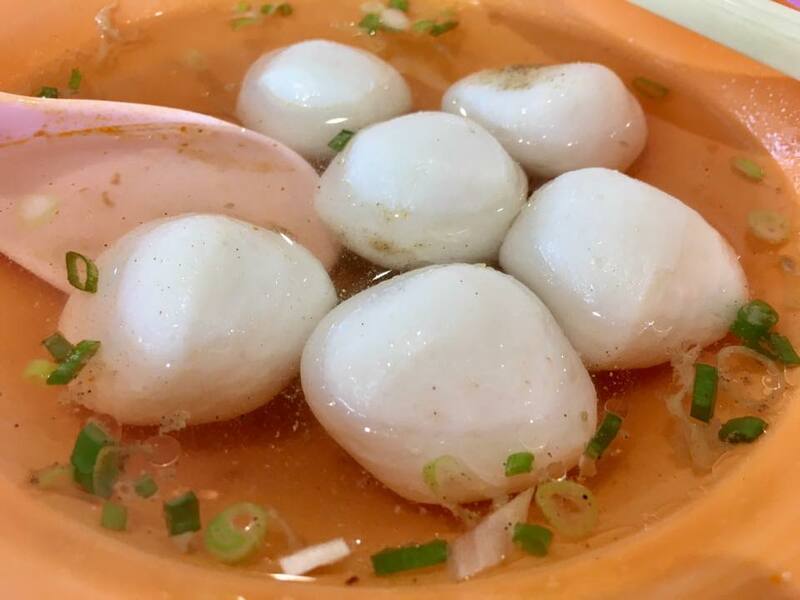 my friends brought a soju (烧酒)-a pretty good one; a cake of puer tea (普洱茶)=must take the tea next time we gather, and my fish supplier friend brought very nice small seed lychee (糯米荔枝)which were very very sweet. 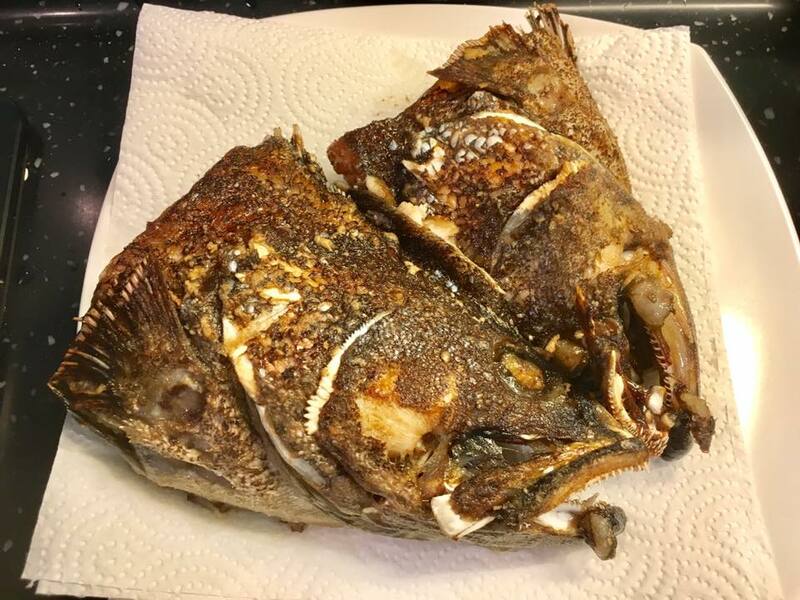 as for the preparations & planning, i was able to take out a sizable garoupa fish head. 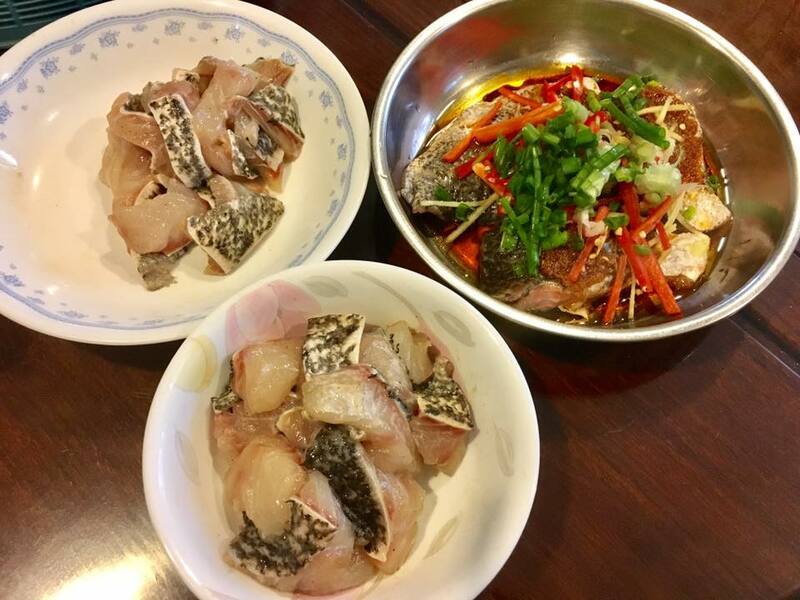 for claypot fish head, i looked up recipes for claypot fish head & decided on the ingredients & method. 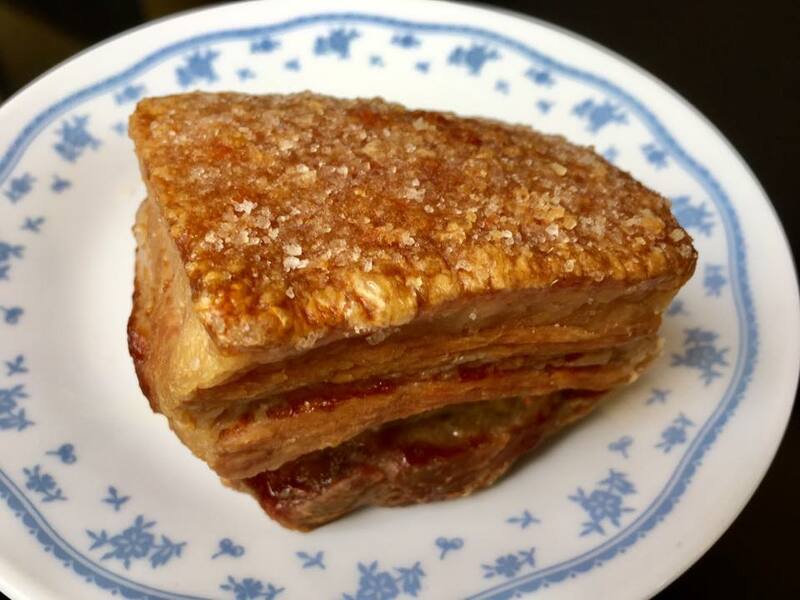 one ingredient i needed was sio bak = roast pork. 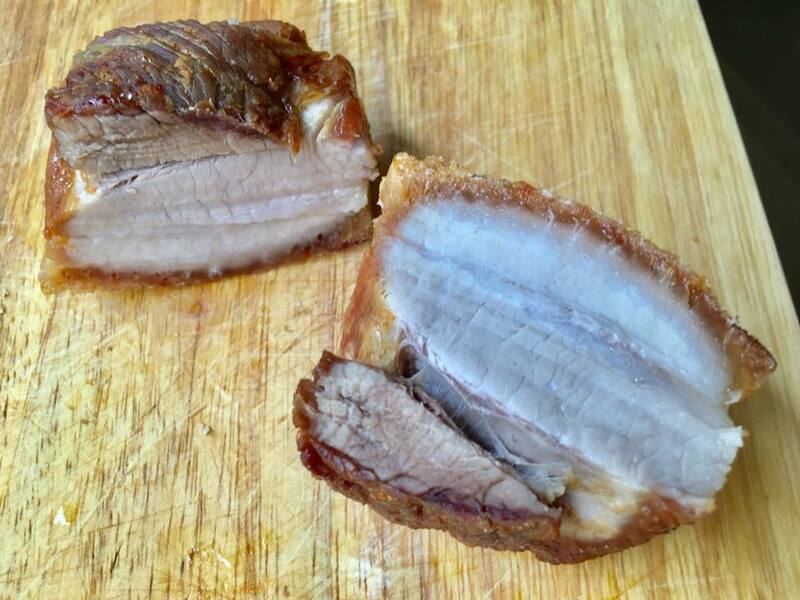 this time my sio bak was pretty good, moist, tender & the skin was crackling(still can improve la…). after scalding & cleaning, i steamed about 300g belly pork for 10mins. this made it easy to stab the skin furiously with a fork. i rubbed the bottom & side with 1 tbsp shaoxing wine. then i covered skin with a layer of salt & left in the fridge overnight. this is to draw out water from the skin so it canbecome crackling! next morning i put in the airfryer 180degC for 25mins. scrapped away the salt, then 200degC for 20mins. voila! 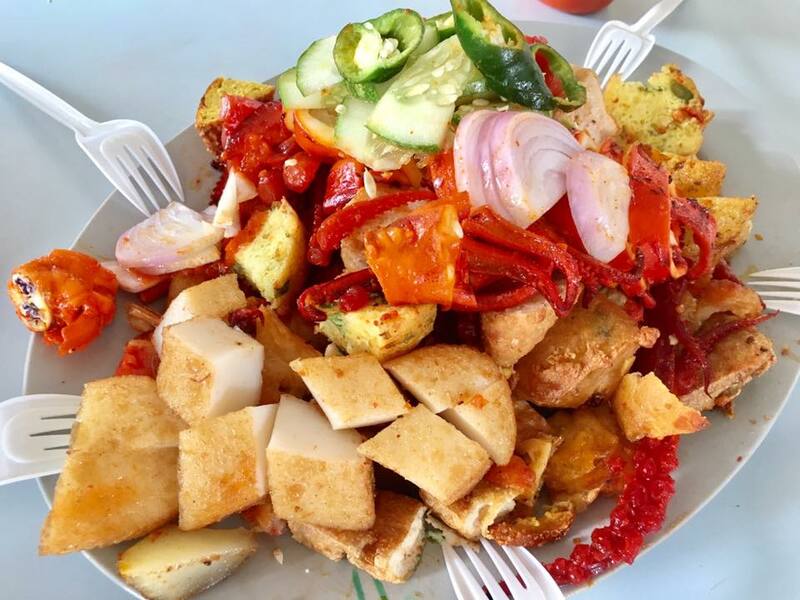 i also needed to deepfry the egg tofu, yam & fish head. this the bothersome part, unhealthy (deepfry), and wastage (what with do with the fishy oil??). 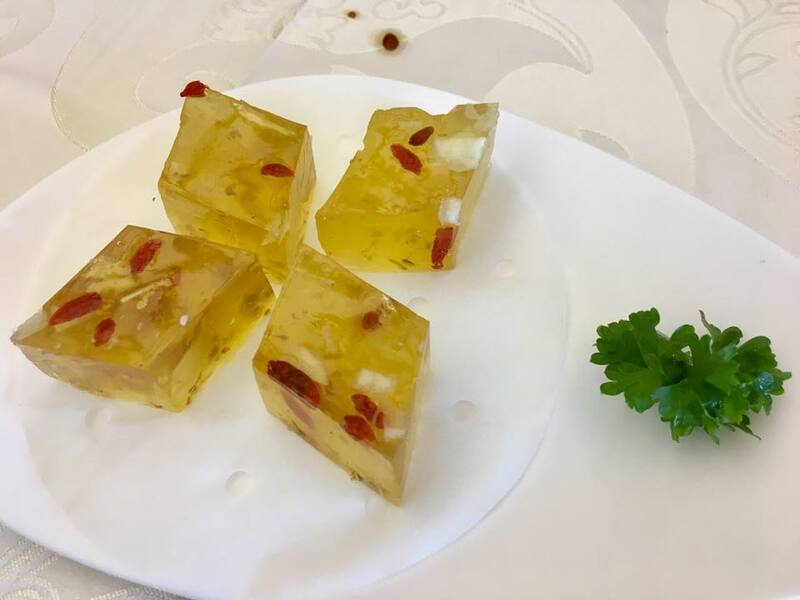 anyhow i cut 2 egg tofu into 14 pieces (2each for 7pax). tofu quite easy to deepfry. next i did for the yam. & lastly for the fish head. 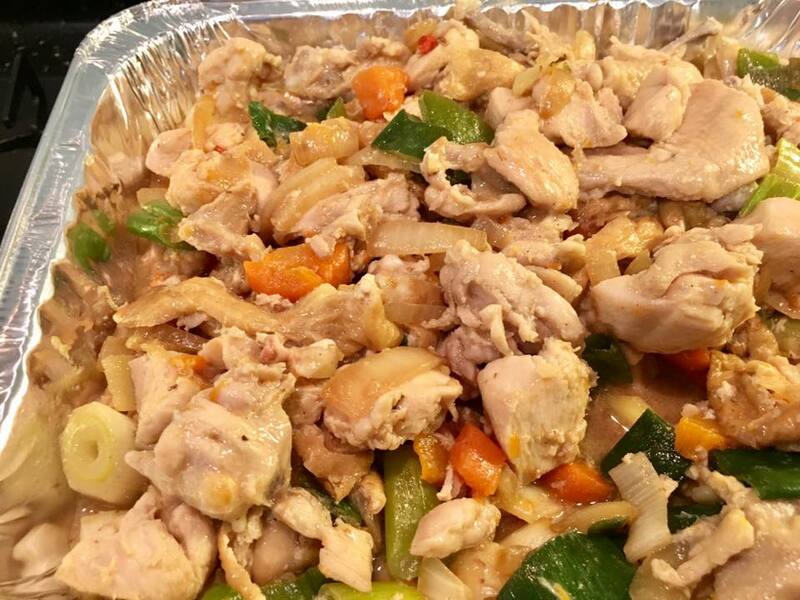 i seasoned with ginger sauce, 1tbsp shaoxing wine & 2tsp light soy sauce, about 2 tsp flour. after that, it’s frying onion, chilli padi, ginger, then chinese cabbage, carrots, flat beans, covered & boiled for 15mins, then shitake & shimeji mushrooms & lasty sio bak. i added some corn starch to thicken the sauce a bit, & light soy sauce to taste (1 tbsp should be ok). & my! the sauce was really delicious = naturally sweet & very tasty! 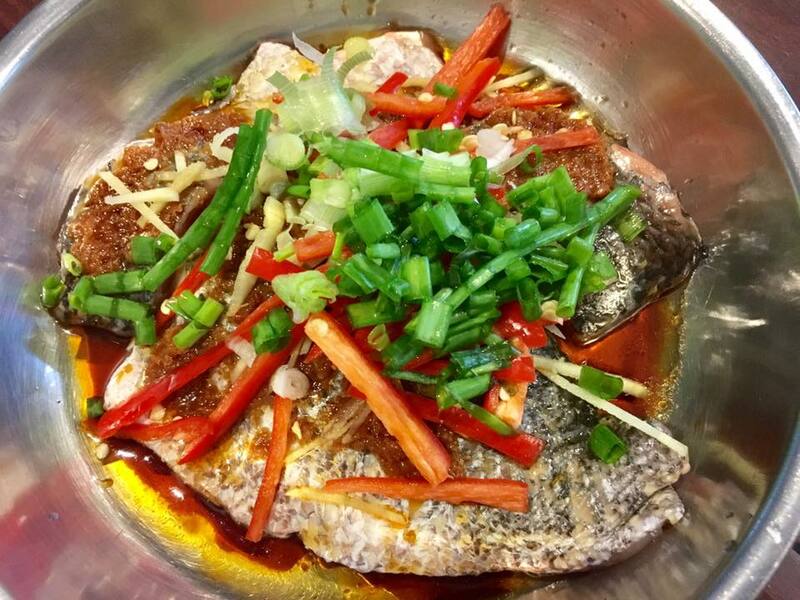 then i placed the deepfried fish head in a claypot, and covered it with the sauce & ingredients. when serving, i cracked 2 eggs, added 2tbsp shaoxing wine, smoothed over. then garnished with cut scallions & coriander. the dish was quite pretty. but alas i did not manage to take a photo of the nicely presented dish as i was preparing the other dishes. 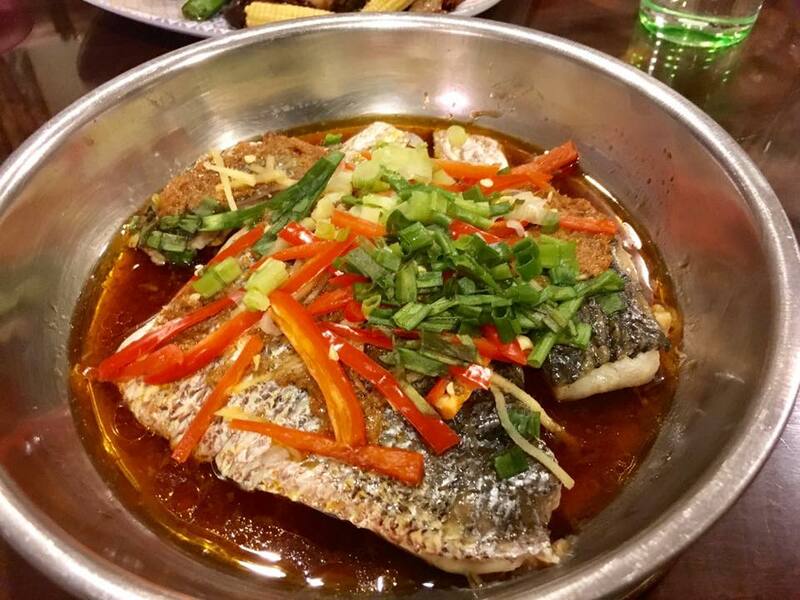 the other dishes were quite easy to do by comparison with claypot fish head. 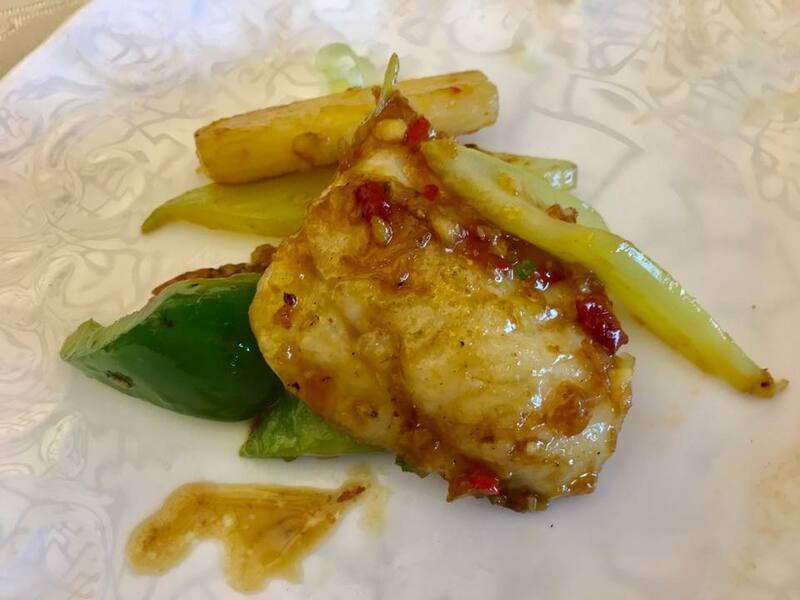 for the golden snapper, i made 2 preparations – both fillet dishes. 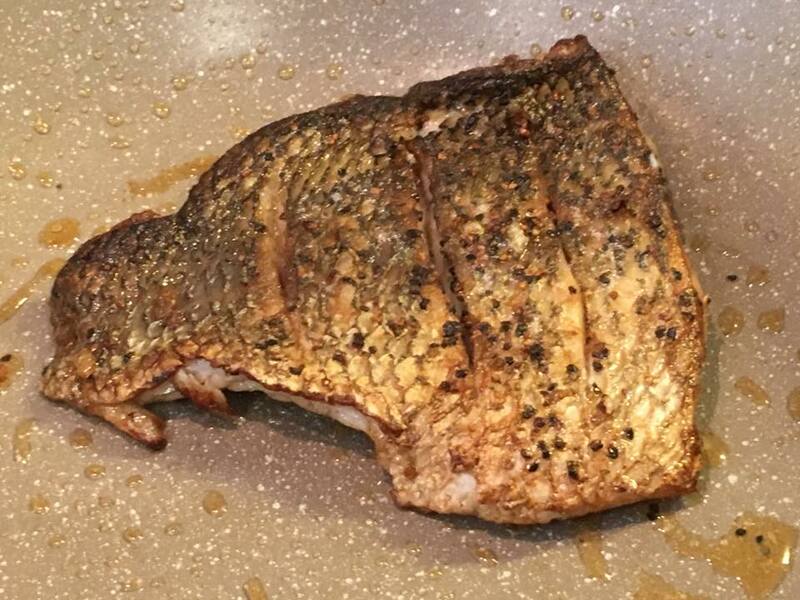 the panroasted snapper fillet was simply seasoned with sea salt & coarse black pepper just before frying skin down in butter in high heat non stick wok to get the crispy skin. 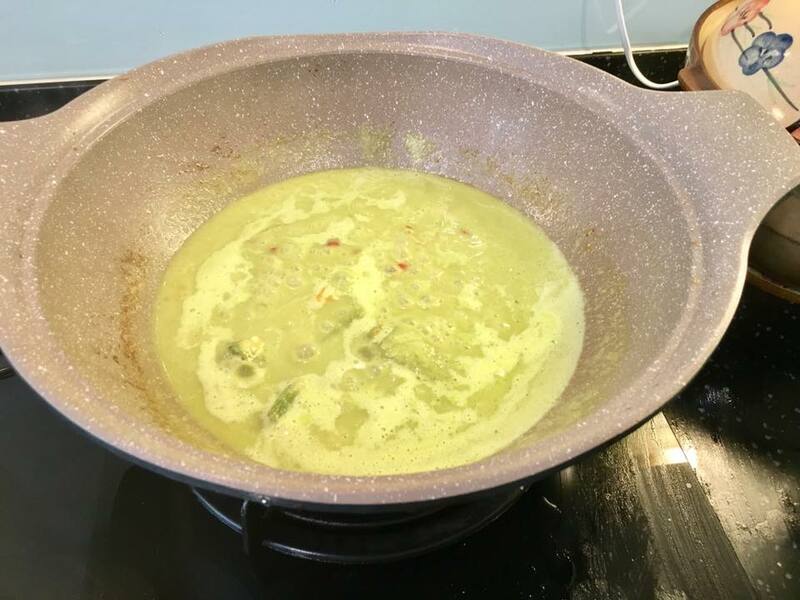 the veloute was done by frying the onions, jalapeno chilli & green pepper(capsicum), adding intense chicken/fish stock, then blending 1/2 of it with 2 tbsp olive oil & 1tbsp light soy sauce & 1tbsp mirin. i had done this previously with spinach. jalapeno chilli is much better. taste was sweet, spicy & natural. 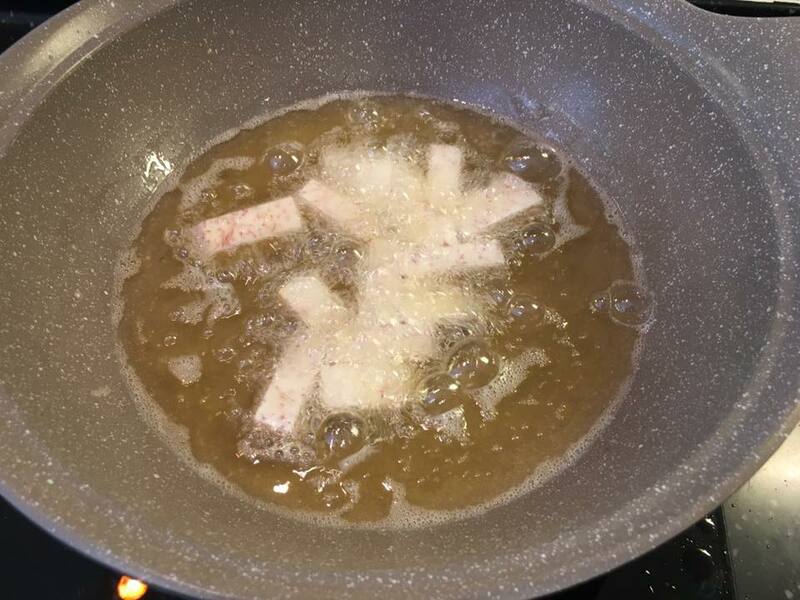 a key step is frying before blending, otherwise it can be “siap” or astringent. it was very easy to do, just the usual hong kong steamed 港蒸 ie light soy sauce plus olive oil (or veg oil). as i am adding the gimson nonya sauce, i reduced light soy sauce from 2.5tbsp to 1tbsp+1tsp and steamed in the steam oven for 11mins..
the combination was just perfect. 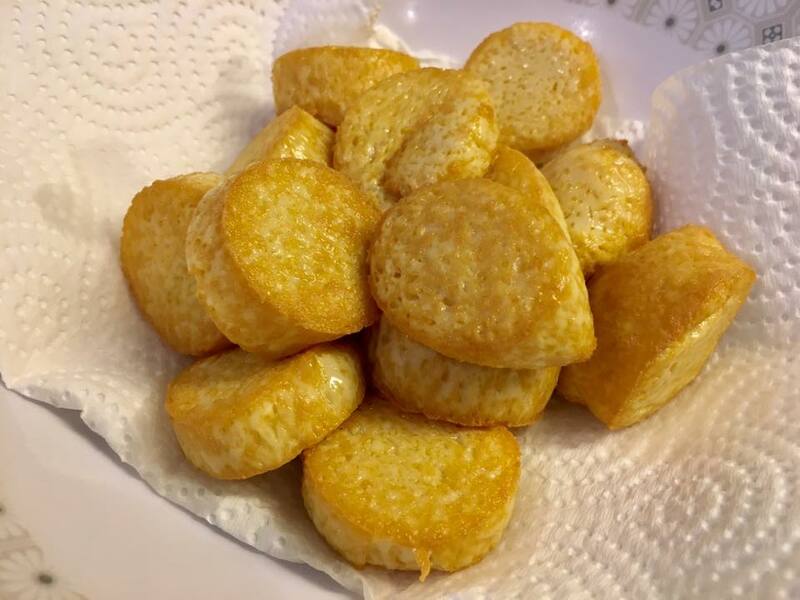 very easy to do, and so delicious! we had a really fun enjoyable evening, good friends spending an evening together sharing delicious food, soju, lychees (& some puer tea to be taken next time). my son loves selara rasa nasi lemak at adam road. 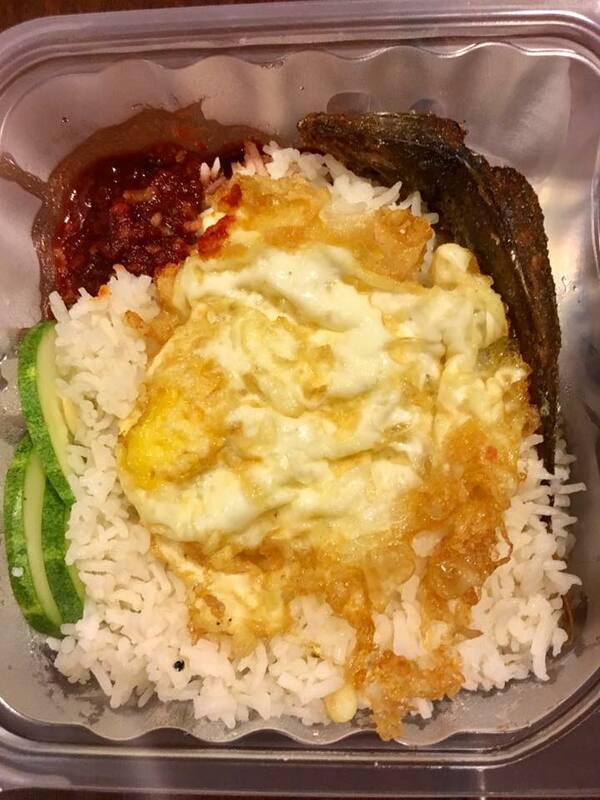 everytime he is home, he will take this nasi lemak, for a period almost everyday. this evening i actually already had my dinner. 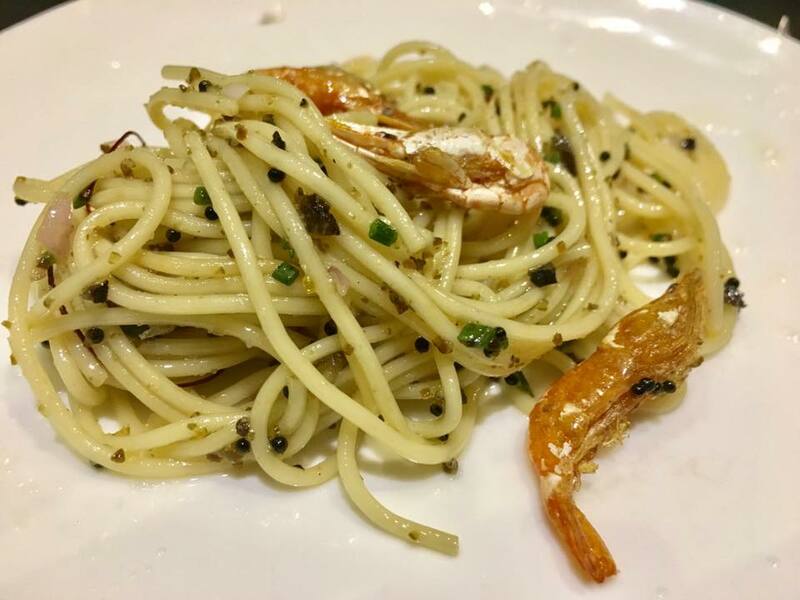 it was a tiny poron of experimental sauces pasta i was testing – this time with frozen shelled prawns, tiny shrimps at S$10/kg from QBfoods. daughted called me. she was with son at Tanjong Pagar Centre. they asked if i like to tapao (take-out) crave nasi lemak..
this the adam road nasi lemak.couple years back i read in the papers that the mechanical engineer graduate from NTU gave up a possivle pilot career to rally his 22-member family to grow & run the business. you don’t refuse what your children ask to do for you, where possible. anyhow i like adam road selara rasa nasi lemak, just not crazy about it. i like kuning fish so asked daighter to add kuning fish. 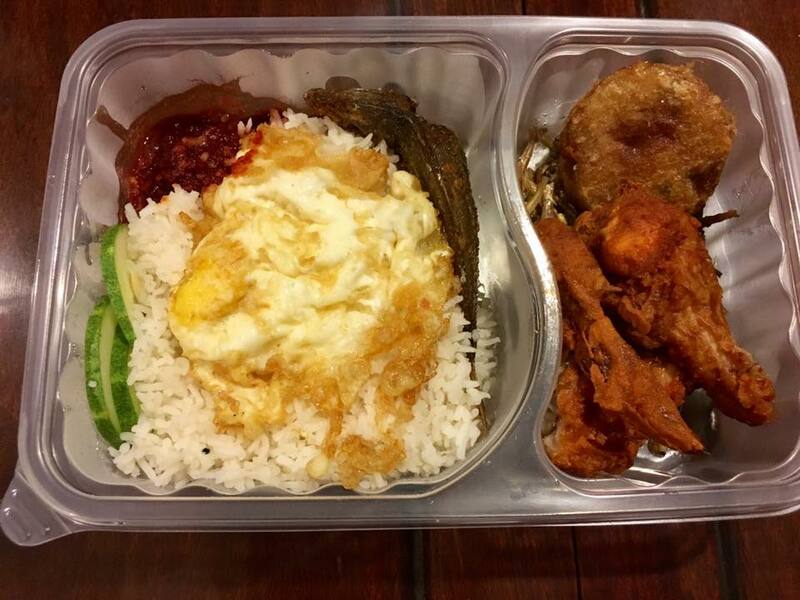 the packet S$6.90, with 1 chicken wing, 1 ikan kuning, 1 egg, the usual ikan bilis, rice & chilli, was rather ex i thought. daughter bouga S$9.90 deepfried whole squid for JH. this was i guess their innovation! using the deepfried chicken better to do a squid. & i think it was excellent. i would not mind having that for a change sometime, but overall i would have my staple nasi lemak, the usual fare la! 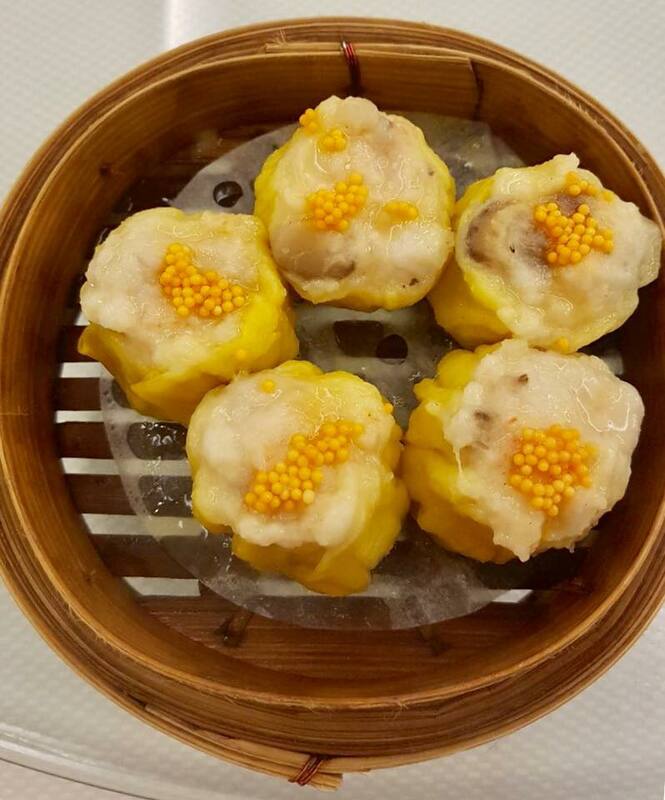 my friend also ordered some dimsum to start. there was a 30% discount on dimsum. 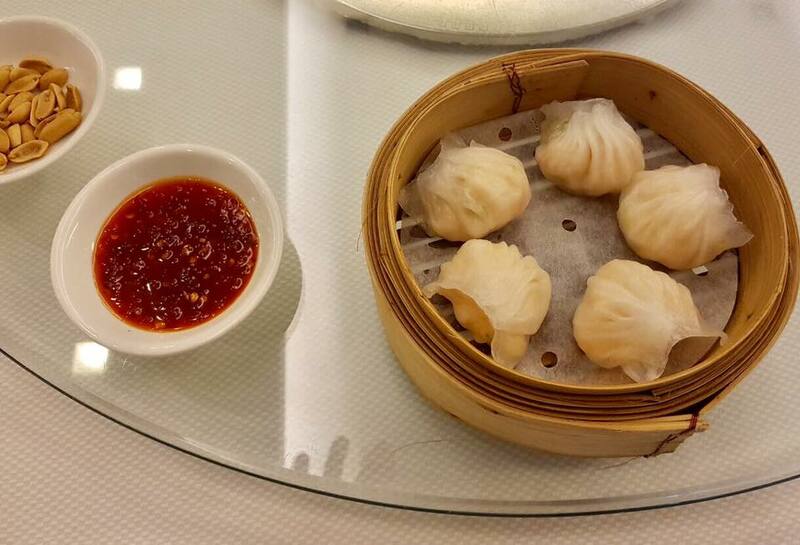 & i was pleasantly surprised that the dimsum were very good. the har gao was better than what i had at canton paradise on 23.5.2017.
siew mai were good too. 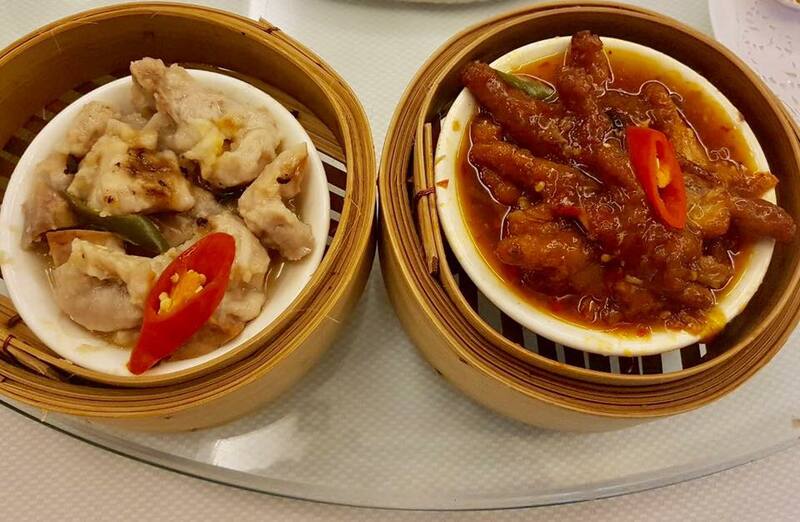 so were the steamed pork ribs & steamed chicken feet. first time i had dimsum in ah yat. the dimsum here were really good standard. 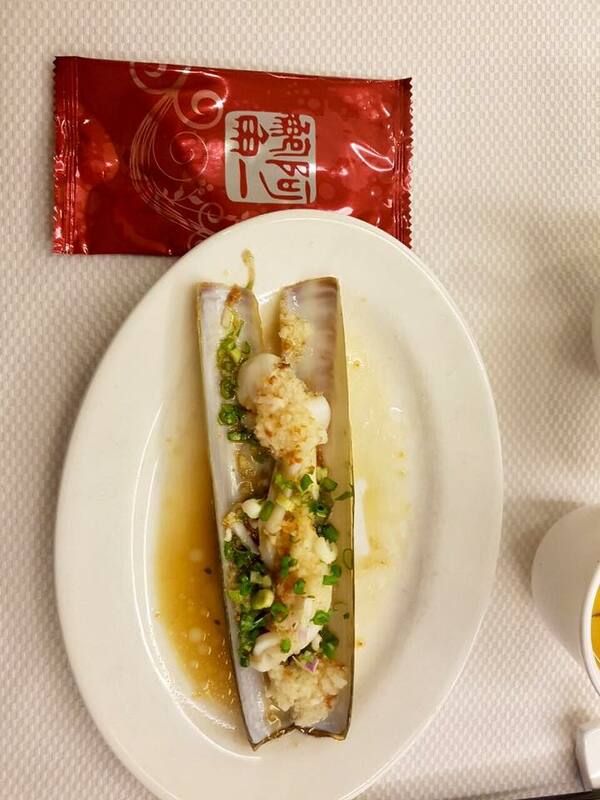 our first seafood promo order was the garlic steamed razor clams蒜蓉蒸竹蚌. it was good as any other good seafood restaurant. they don’t do tanhoon here. the clams & the flavourful garlic & light soy sauce were excellent. they were very good! 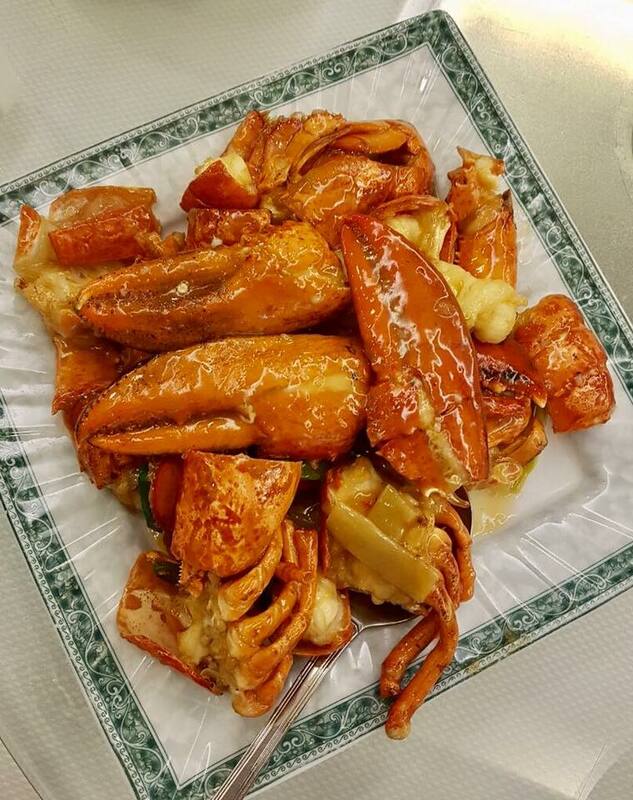 very fresh, sweet lobster & excellent superior stock龙虾上汤焗. 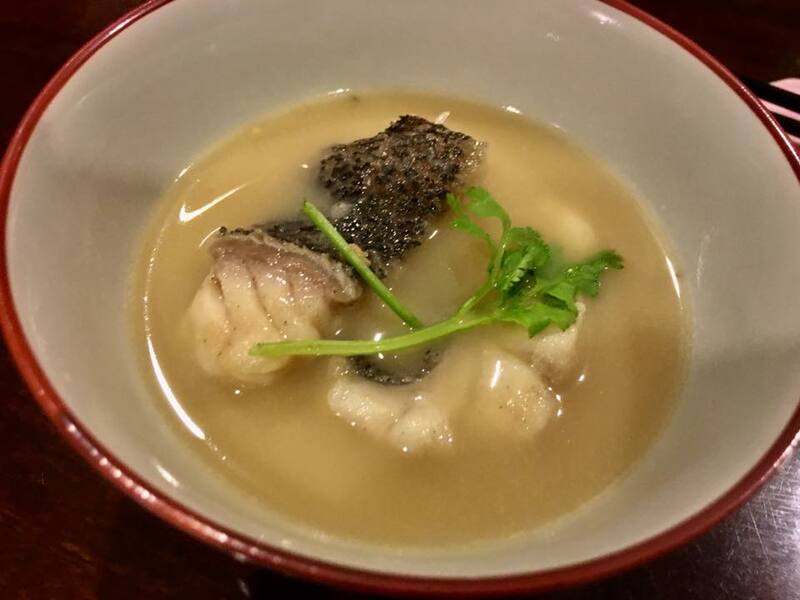 garoupa is a bit common, and tiger garoupa is a bit “chao chie”, mud taste. 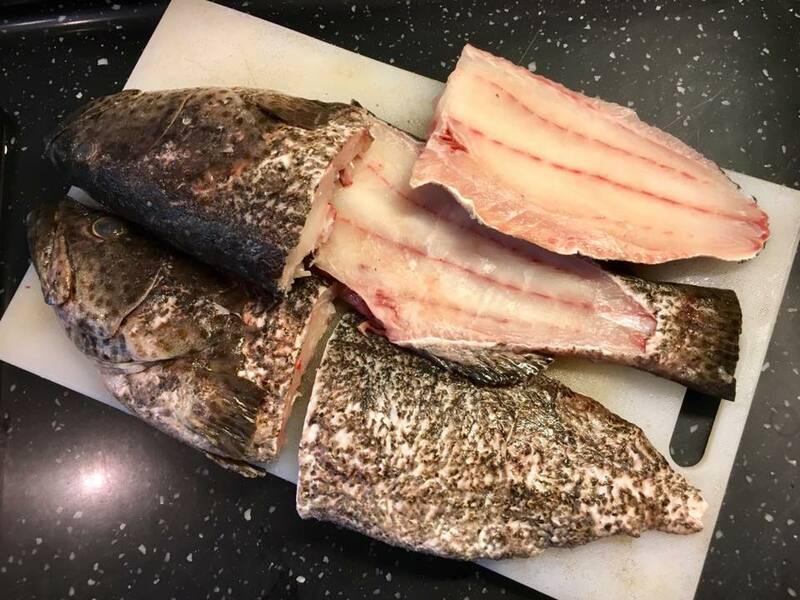 anyway my friends said i was going to cook the >2kg garoupa he fished & gave me on monday 29.5.2017, so might as well get the turbot. it was very good, the meat is more “yao”幼, much more fine than tiger garoupa. i asked. they don’t do teochew style here. 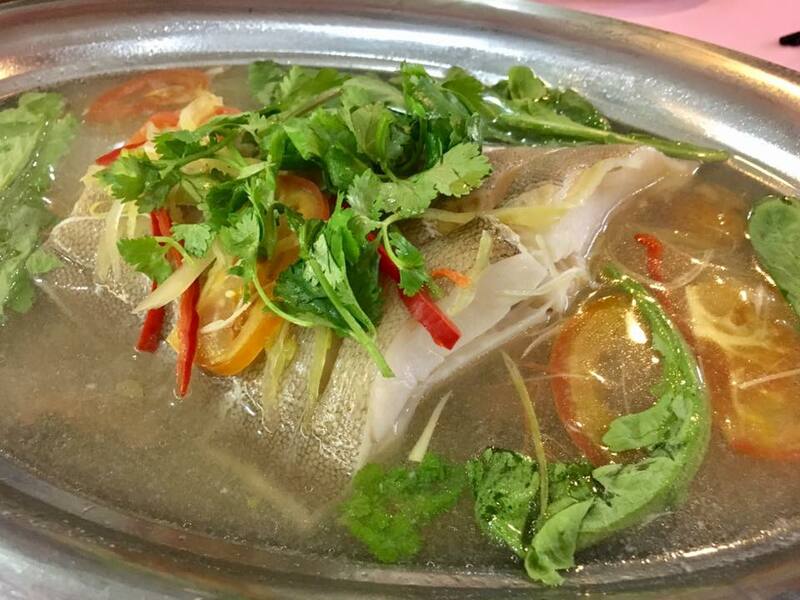 by comparison, the steamed halibut at fragrant garden was still much better than this. seems that fragrant garden misnamed their fish. halibut is a large ocean fish. apparently the largest pacific halibut caught off the waters of Norway in July 2013 was a 515-pound 8.6 foot fish. 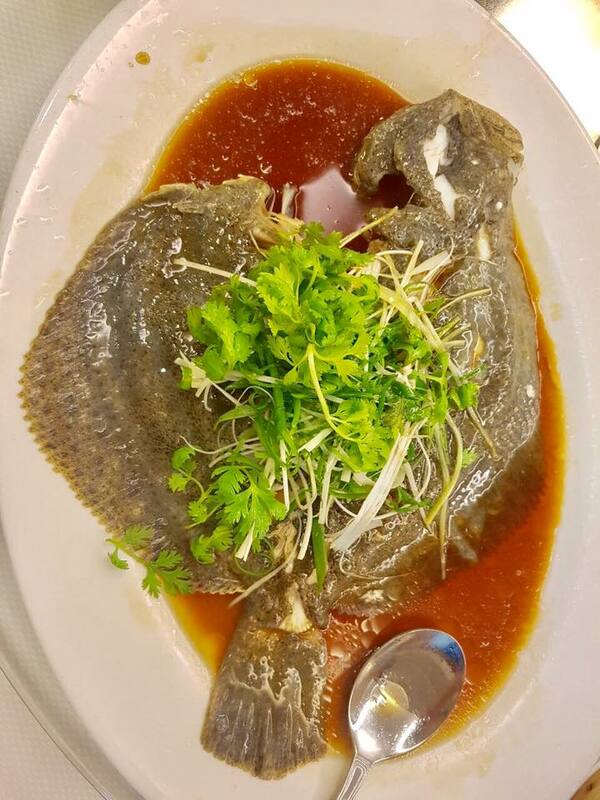 so fragrant garden dish should also be a turbot 多宝鱼! 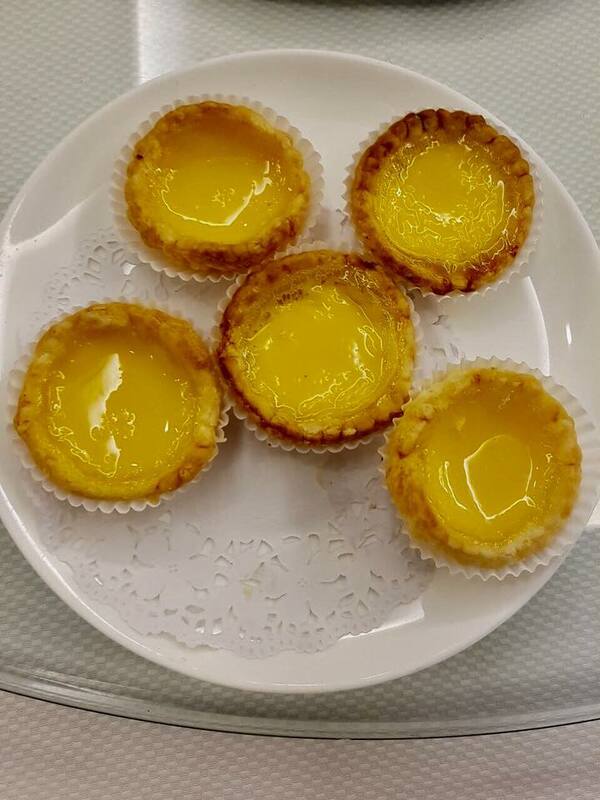 we had the mini egg tarts. i did not try. but they looked ok & all the dimsums we ordered were good. 5pax lunch was S$221 nett, a super lunch for the dishes we had. last time i came here was with wife on 2.1.2017.
the place has high ceiling & really nice ambience. we were there at 8pm on a wednesday. not many tables were taken up. 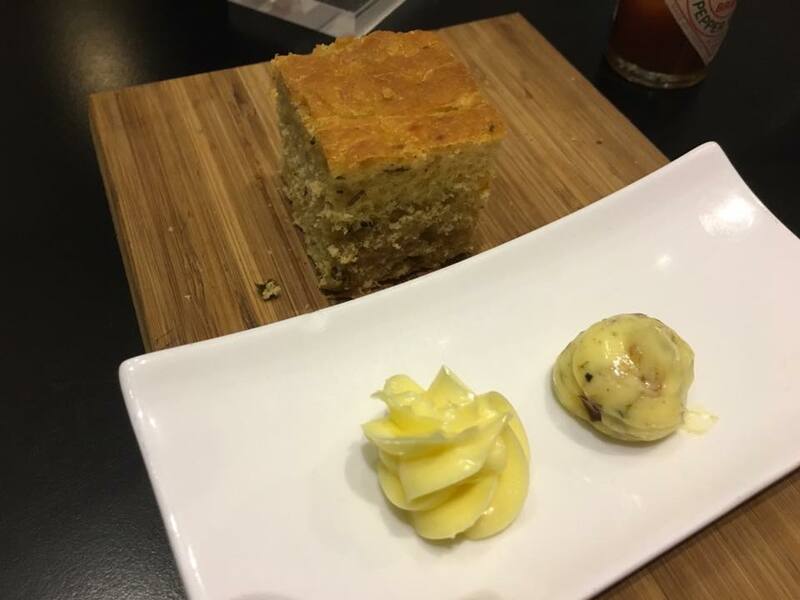 we were served some focaccia & butter. we asked server for extra virgin olive oil & balsamic. they never came. 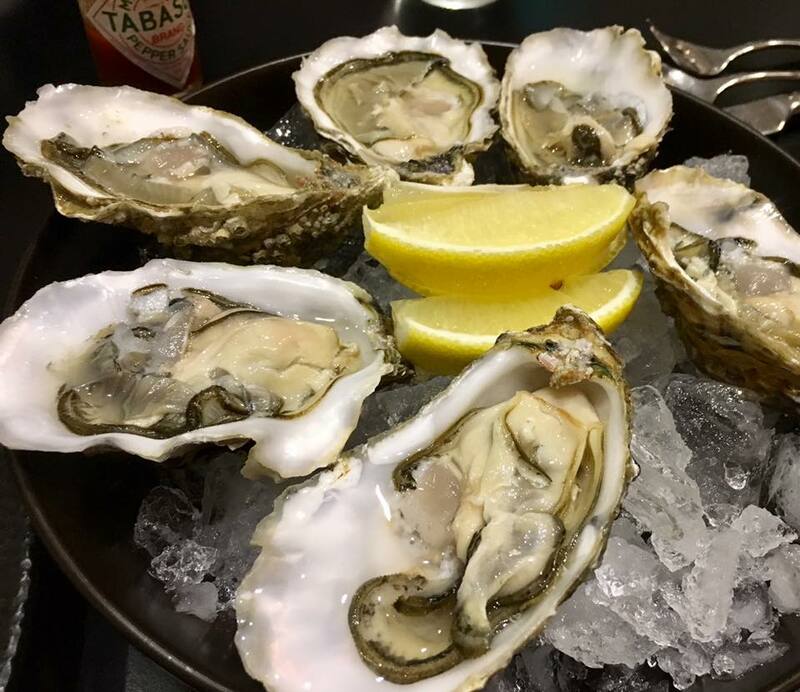 we asked the server if oysters were included in amex lovedining privilege at 50% discounts for 2pax. 1st server on query said yes. second server actually taking order said know. then she went to check, and came back to say actually NO discounts??? but they will honour it just for this time only. 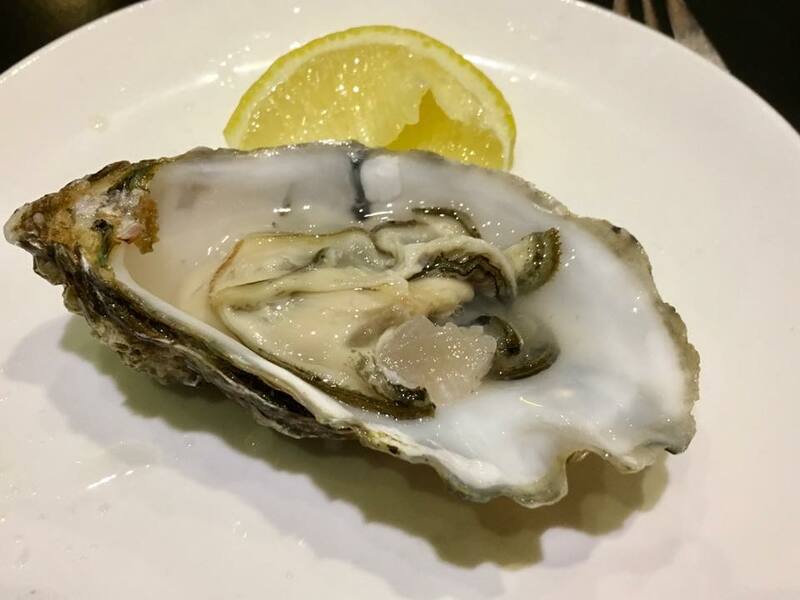 plump, sweet, tasty, juicy, no overly strong sea taste nor metallic after taste. the chilled truffle angelhair is one of their signature. & it was really very good, the best i had so far. 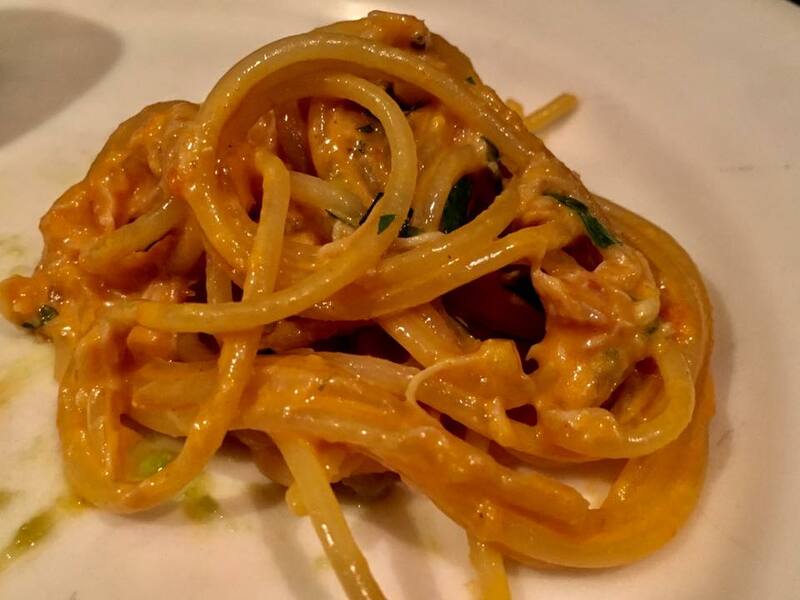 very flavourful, pasta totally al dente. the texture & flavours combined well. 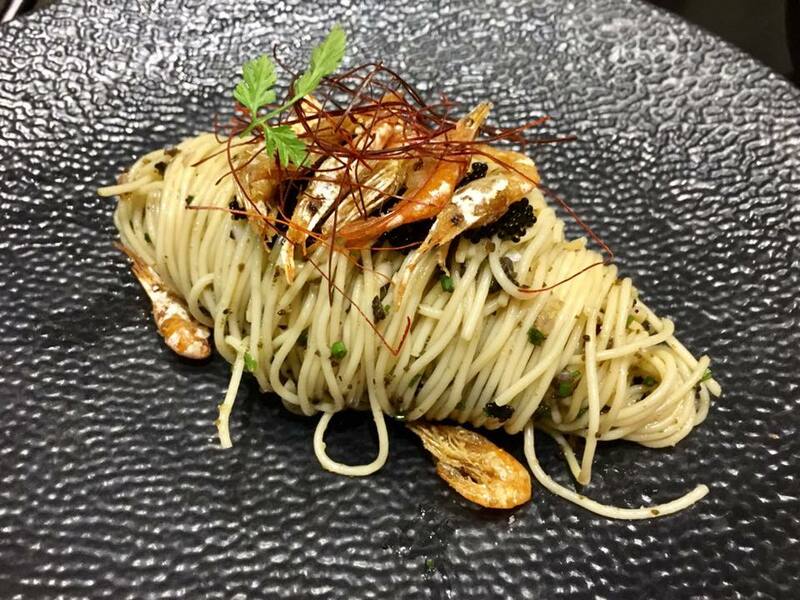 it was served with kawa prawns, caviar & nobu extract. very nice indeed. 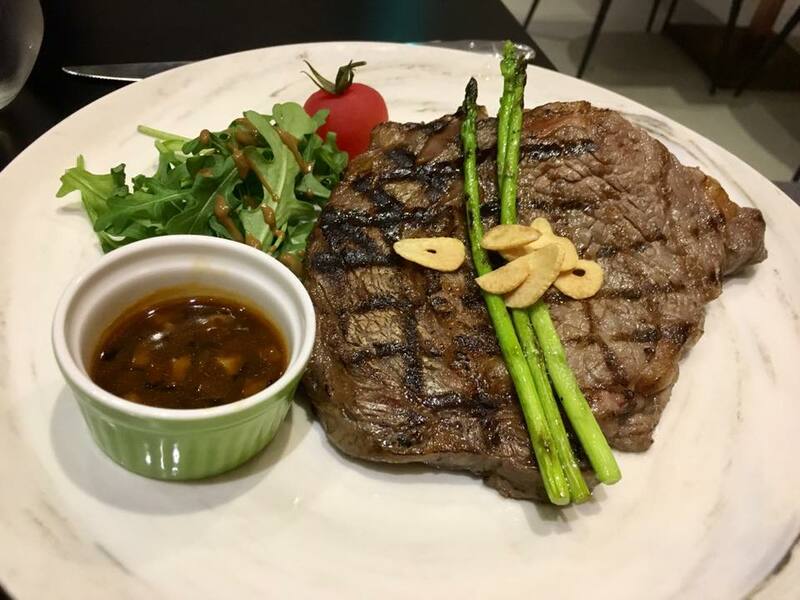 there is no 50% discounts for the japanese wagyu. i took the USDA ribeye last time it was very good, and the sirloin ok but not so good. 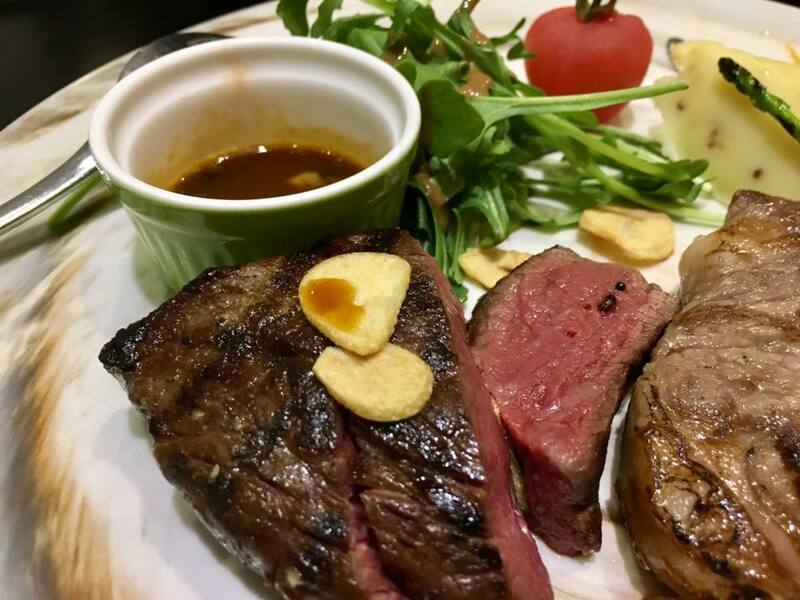 this time the server recommended to try the wagyu rump. and the USDA aurora ribeye was as good as ever! 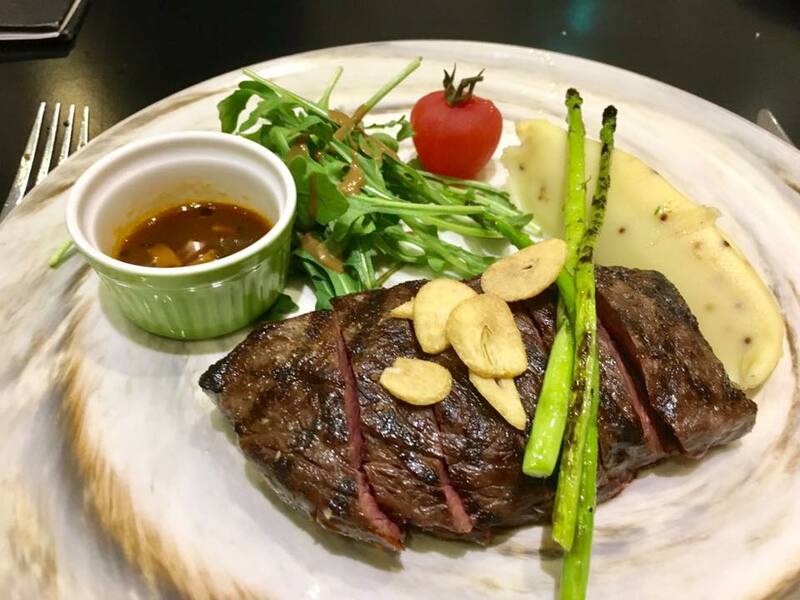 very tender sweet, by comparison the wagyu rump flavour has its attraction. my son said he grew to like it. i didn’t mind too, but given a choice i guess i would still do the ribeye. a mildly eventful day today. did my usual weekly run with my RI buddy at faber heights ulu pandan jogging track, and was caught in a heavy downpour. was in 2 minds whether to stop & take shelter under toad bridge. as i knew the rain was not going to go away. we took shelter about 15mins, when the rain was momentarily lighter we decided to run back to my friend’s house which was another 1+km. needless to say we were totally drenched. but everything was per normal. we had our 100plus, then coffee chat. after that i drove back. another RI friend VJ came by about 12pm. it was still drizzling. 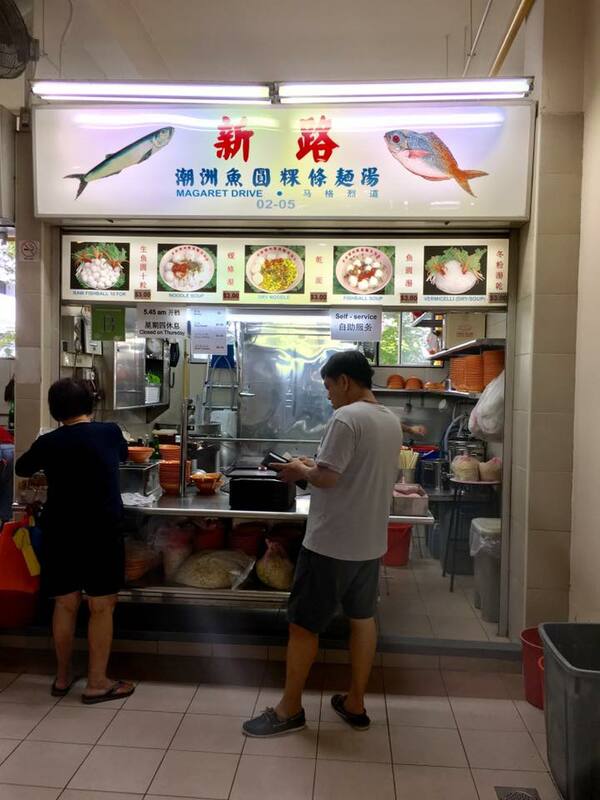 we decided to go commonwealth crescent food centre to take jian kang wanton mee. something happened which inconvenient me & took up my entire afternoon. 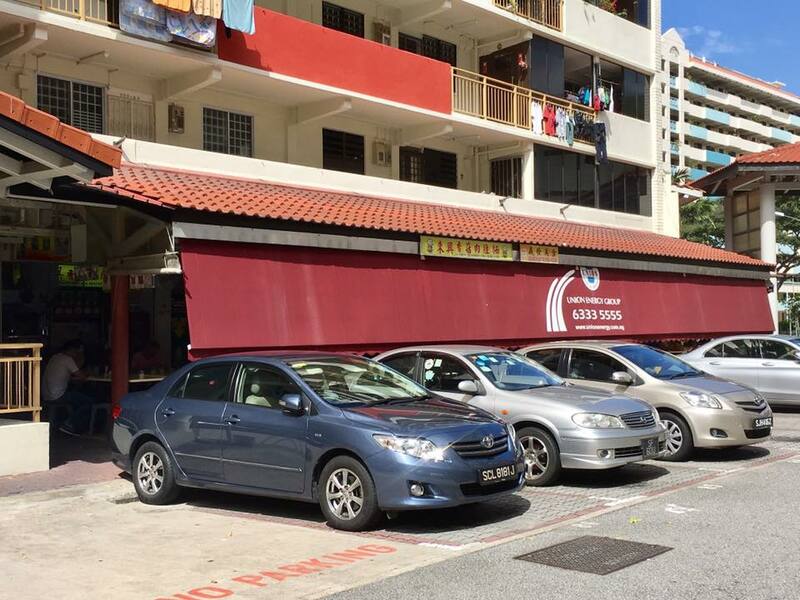 anyhow we got to commonwealth crescent FC but jian kang want mee was closed. so we decided to just have braised duck rice 牛车水阿婆卤鸭. opposite jian kang noodles. i had this with my OPS buddy on 5.9.2016.. and another time with my sis & bil. both times it was quite good. 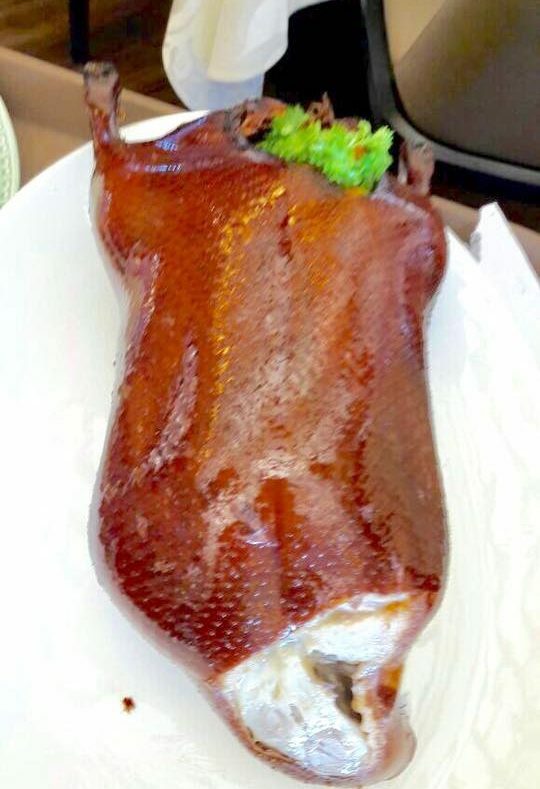 i ordered 2 duck drumstick rice. for my friend in added duck liver (he jokingly said nearest thing to foie gras) and braised egg. 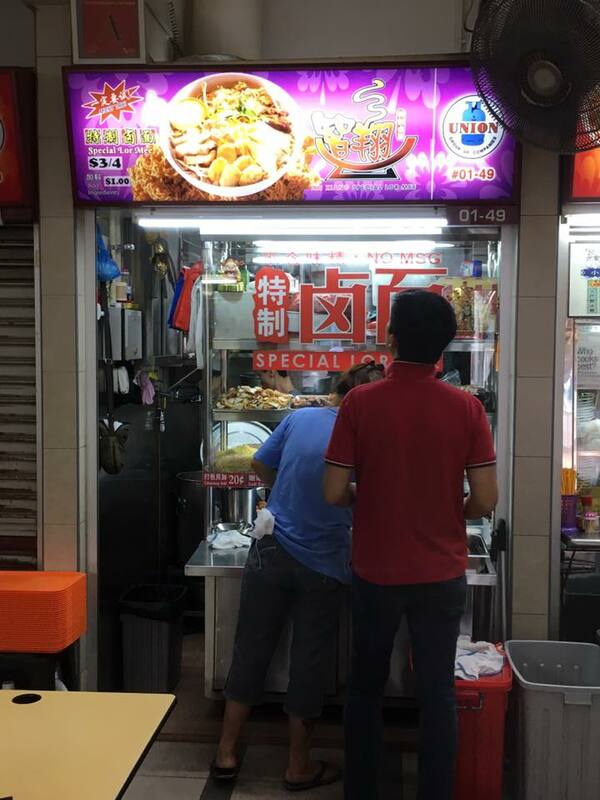 total was S$13.50=maybe S$6 for drumstick rice, $1 for liver, $0.50 for egg? not cheap not ex i guess. daughter & son wanted to go dinner nearby. they decided to go canton paradise at starvista on 23.5.2017.
no queue we got our 4pax table immediately. har gao my daughter’s favourite. and it’s always good here. & son liked the xo carrot cakes. my youngest daughter like that too, she’s not with us for dinner this evening. 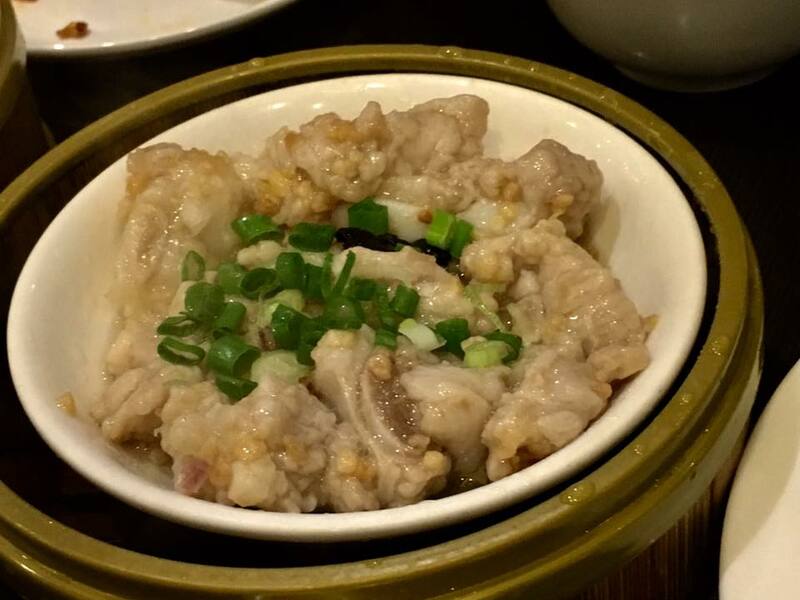 the steamed pork rib also always quite good. the roast duck this evening was a let down this evening. still competent i guess. maybe it is just a matter of comparison.used to like the roast duck here. 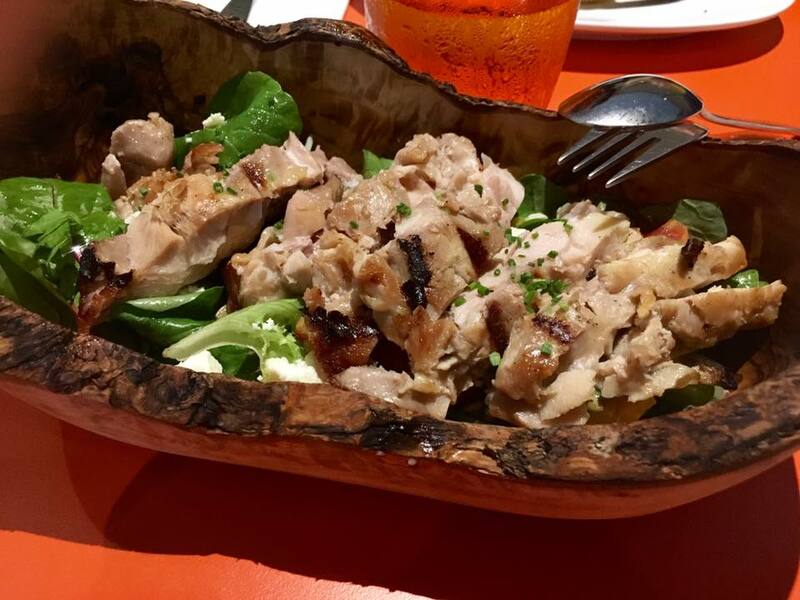 the recent roast duck i had in goldmines at bayswater london recently was a lot more tasty & flavourful than this. 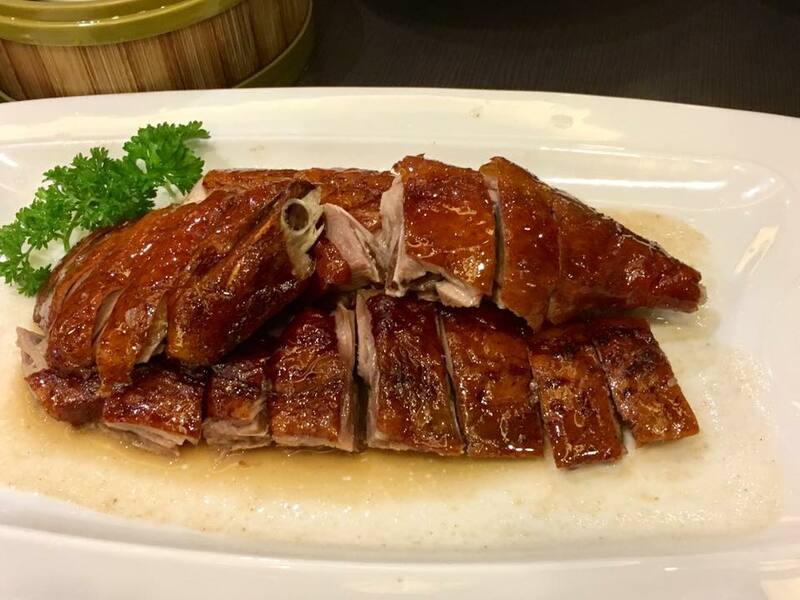 & the ones i had not long ago at (1)xin cuisine & at (2)royal london duck were both better. 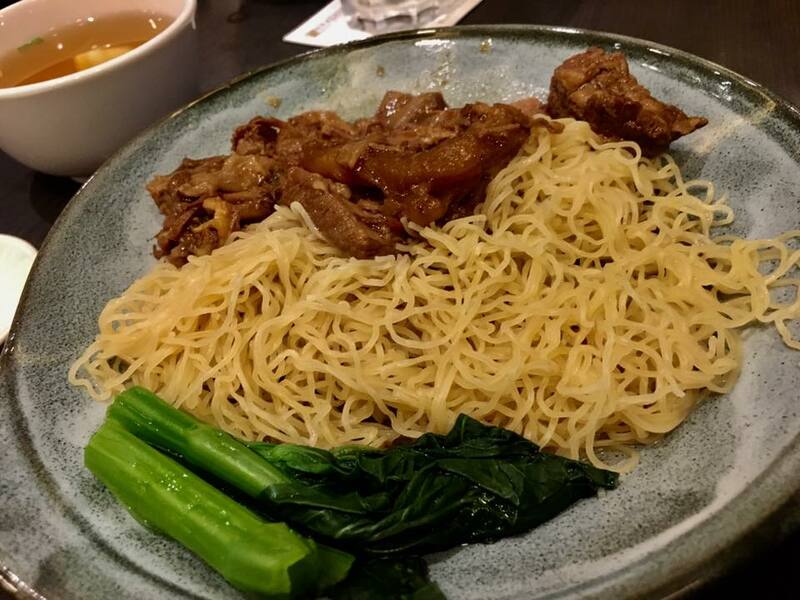 son ordered the beef brisket noodles. and JH ordered the dumpling noodle soup. dinner came to about $100 for 4pax. on the expensive side i thought for the limited dishes we had. it’s always a good & as a matter of fact necessary dining habit to stop when you feel full or almost full. it makes no sense at all to overeat, an action that makes you feel worse NOT better. nothing to gain everything to lose ya! and it does the food no justice. better to leave a slight/almost full stomach & great memories & future cravings for the food. we were game & decided to go to lor 8 for the GCT (goh chok tong) aka four seasons cendol at lor 8.
this stall is, for me, handsdown the best cendol anywhere. 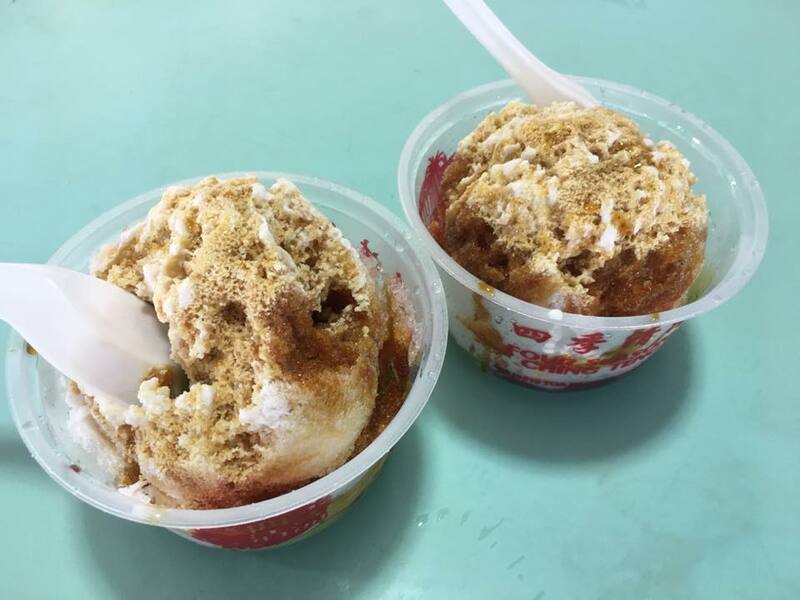 so we had a $2 cendol each, savouring the wonderful cendol, coconut milk & gula melaka. 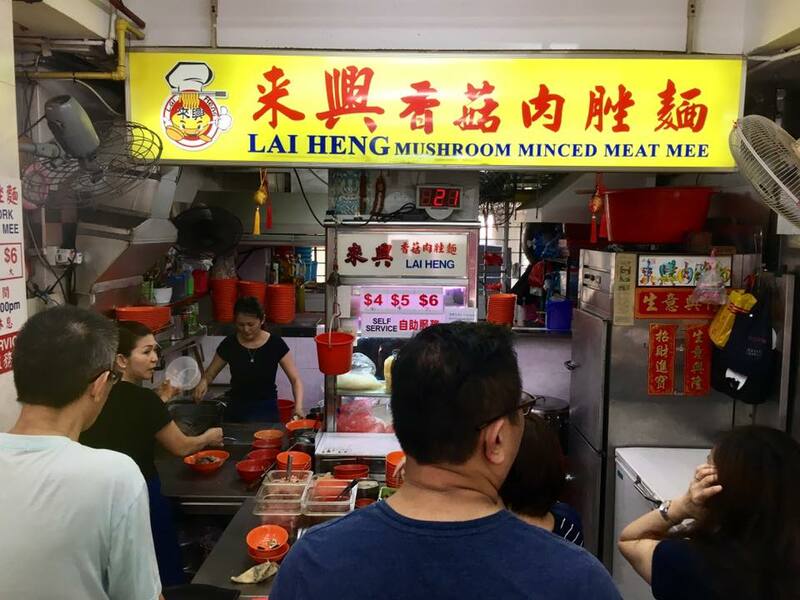 lai heng is the same stall at changi T3 B2 that my wife & i like to go with our son & family when we were sending our son to airport. these days i occasionally go to 6th avenue jalan tua kong for meepok tar. 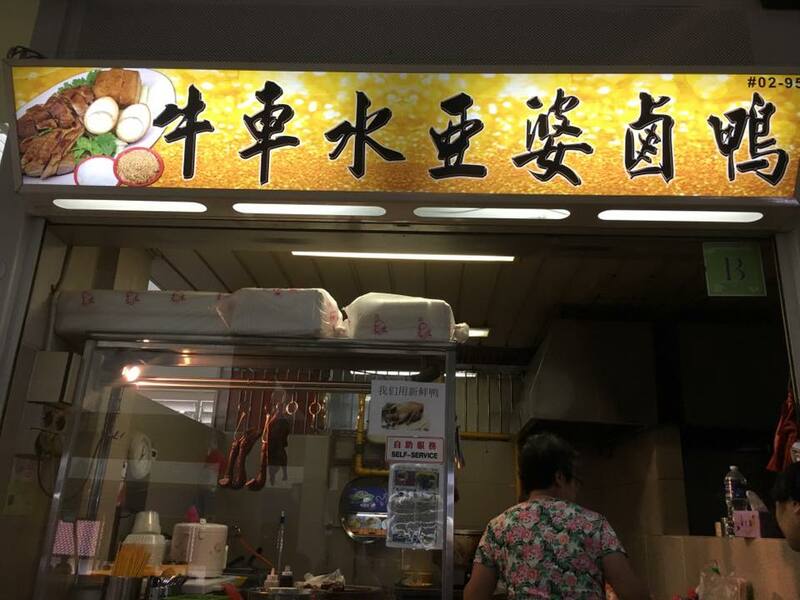 I have not found much occasion nor motivation to queue at tai hwa at crawford lane; nor to specifically search for a good bakchormee stall. 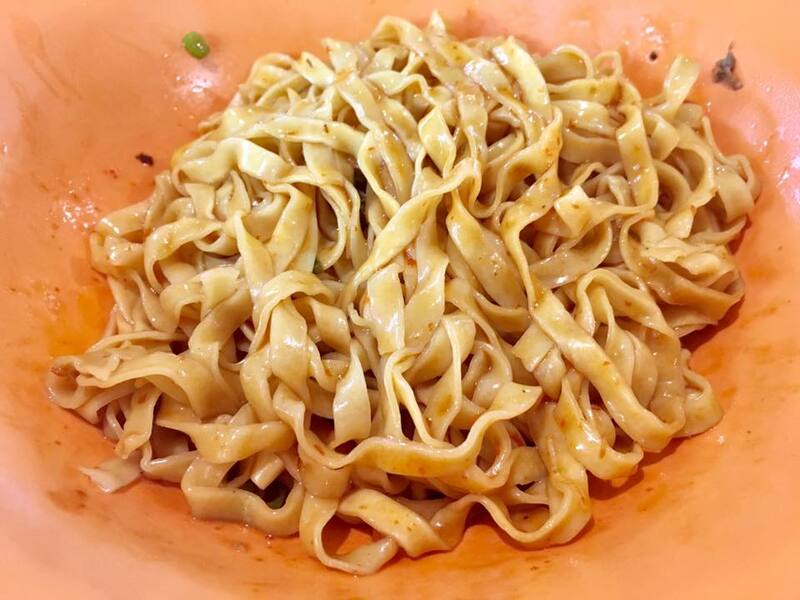 and if i go to hong lim i will end up taking ah heng curry chicken noodles instead of tai hwa. there were just couple folks at the stall. however their system is to pick a number upon arrival, then go pick up the noodles when the digital board next to the TV calls your number. our no. was 30. there were 3 before us. we awaited maybe 10+mins. the sauce & chilli were very good, very tasty with the noodles. especially with just enough vinegar, not overwhelming. these days, every stall makes qq noodles, almost la..
& the ingredients for the small S$4, quite good la..not a lot just enough i think. i enjoyed this noodles. will definitely come back again. 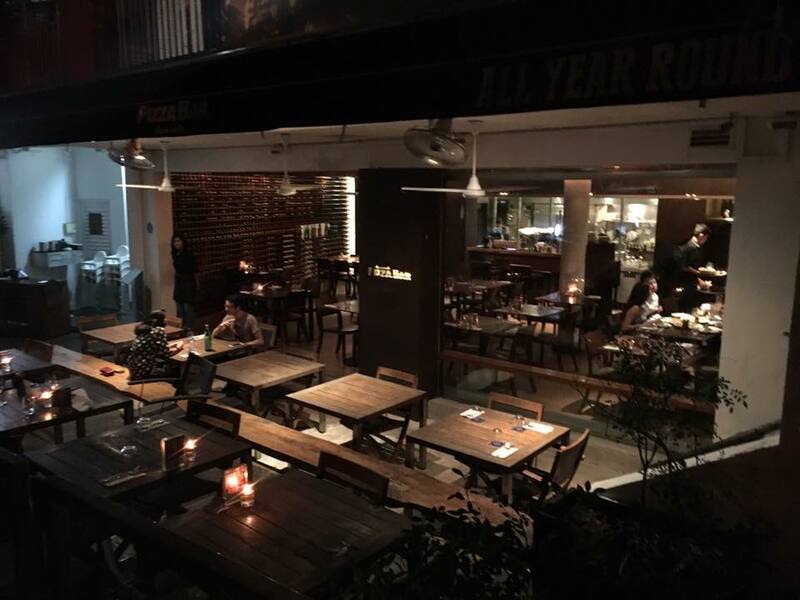 it is different from 6th avenue jalan tua kong, and i like both styles & both stalls. 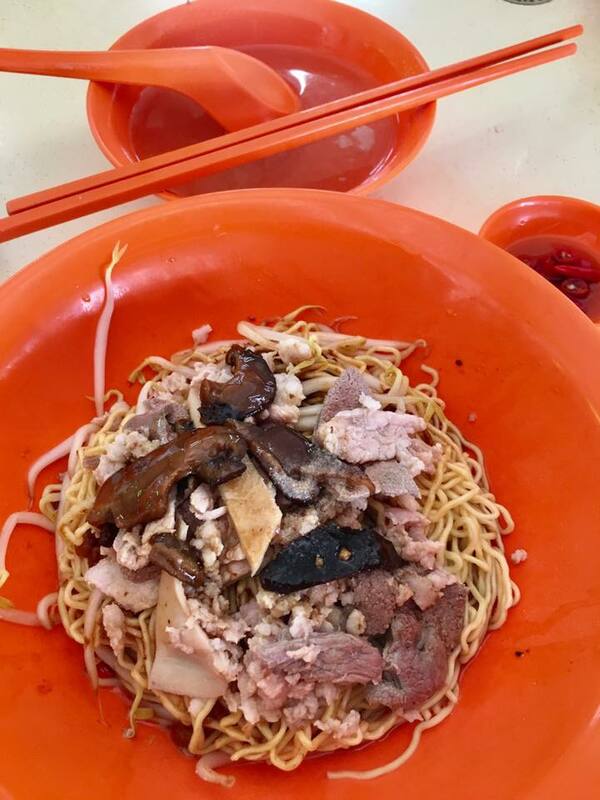 for me this was better, much more shiok than ah hoe bakchormee, and about as good as tai hwa. 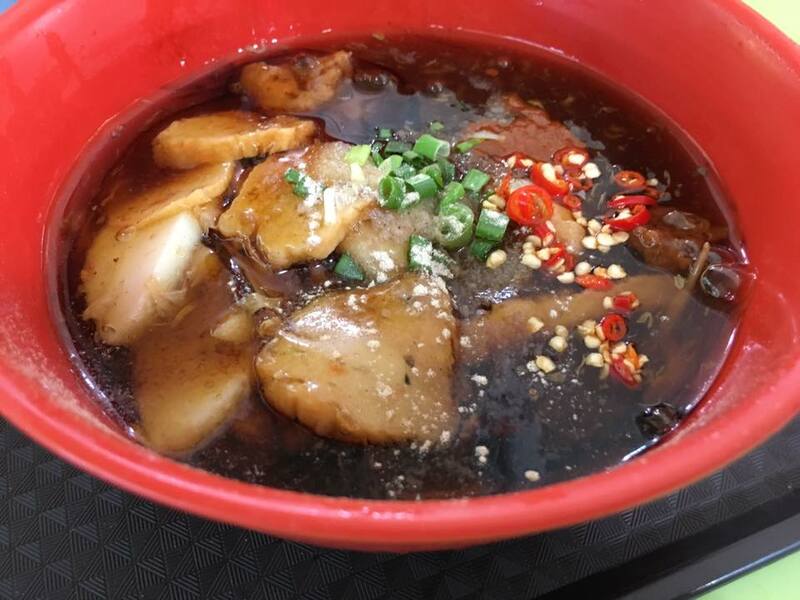 we are thinking of various places like hong lim food centre, adam road food centre, & decided on trying out toa payoh. i googled while my friend drove. 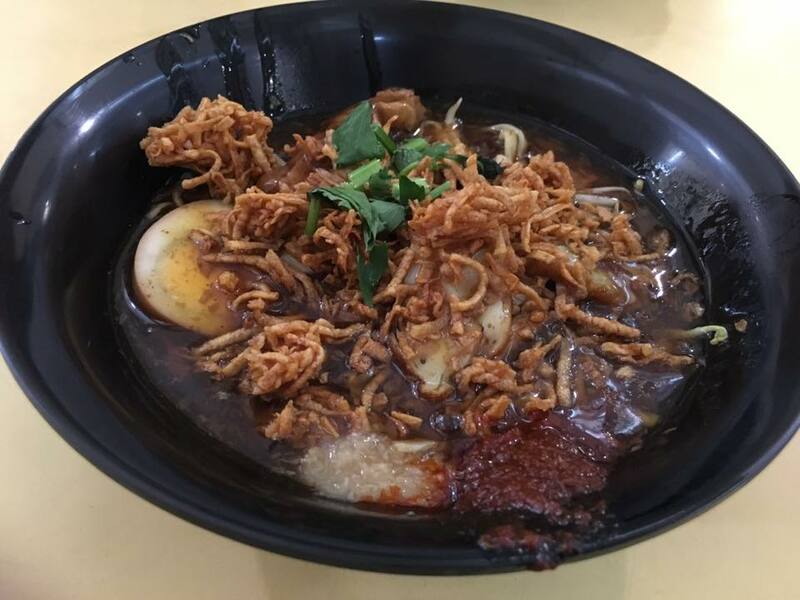 we decided to start with hokkien noodles at toa payoh lor 4, then bakchormee at lor 6, then beef noodles at lor 7.
after parking, we realised that kim keat hokkien mee at lor 4 opens at 11.30am. 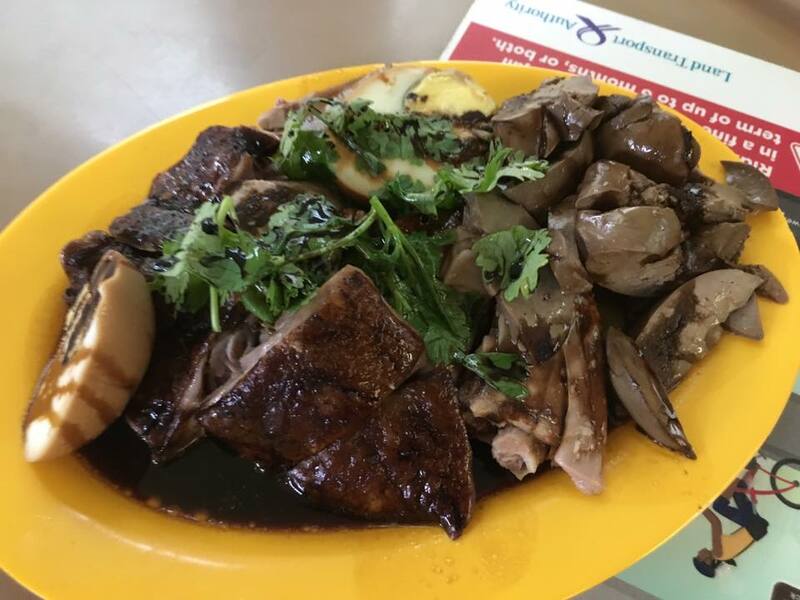 we were early, so decided to explore blk 93 food centre. 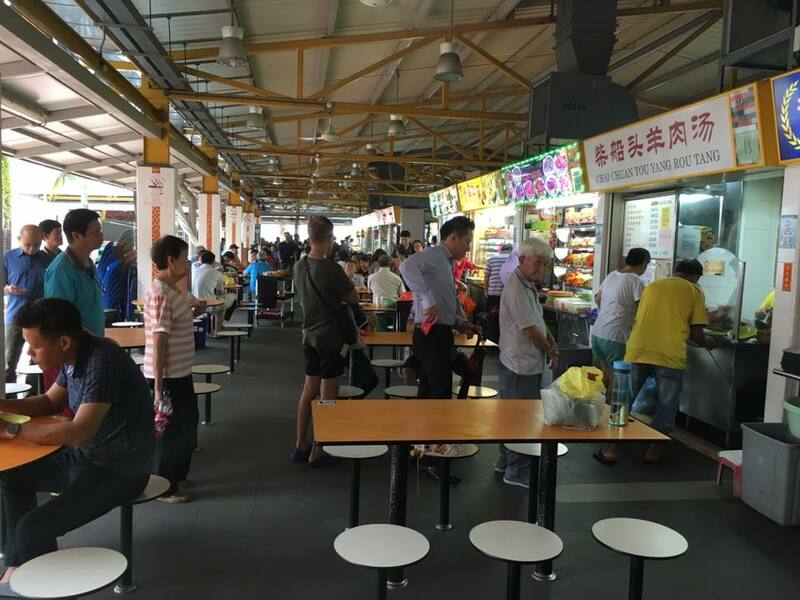 this really a tiny place & combines both the wet market & hawker centre. 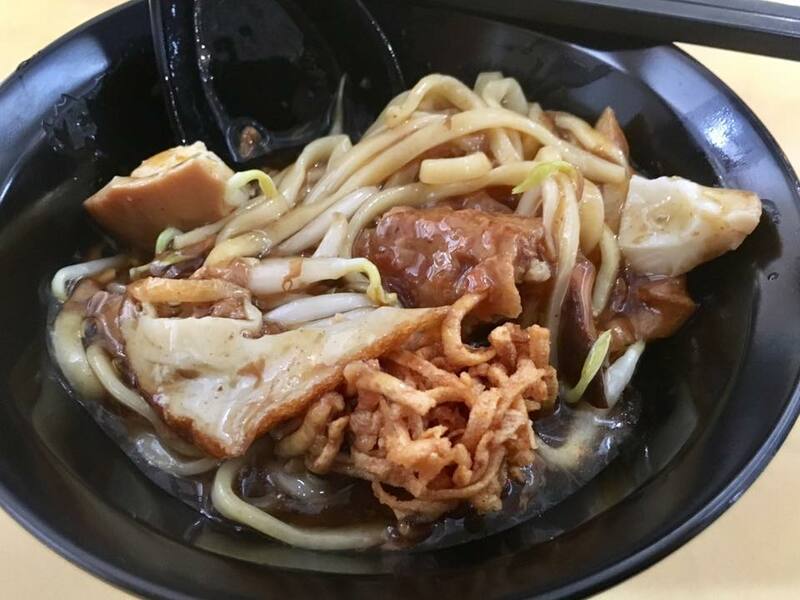 we decided to try the lor mee, and bought a S$3 bowl to share. surprisingly, it was quite good really. 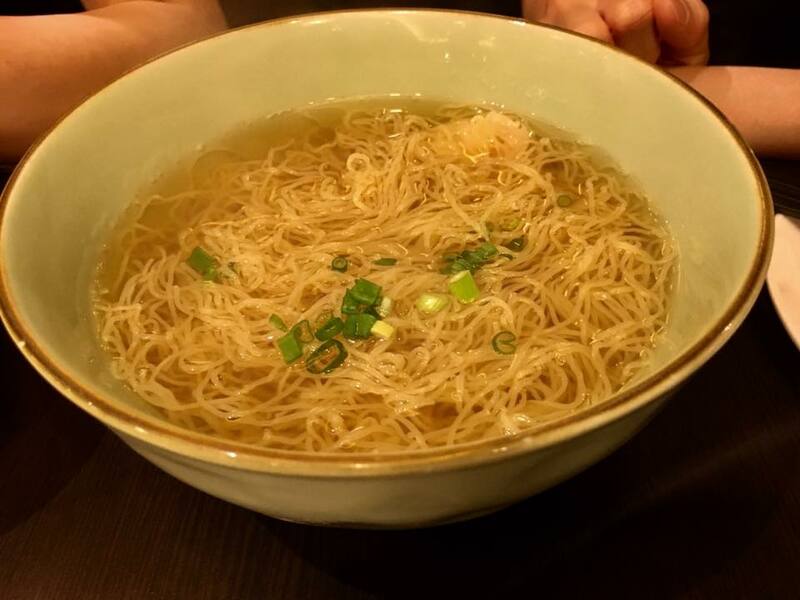 the noodles & broth was tasty. 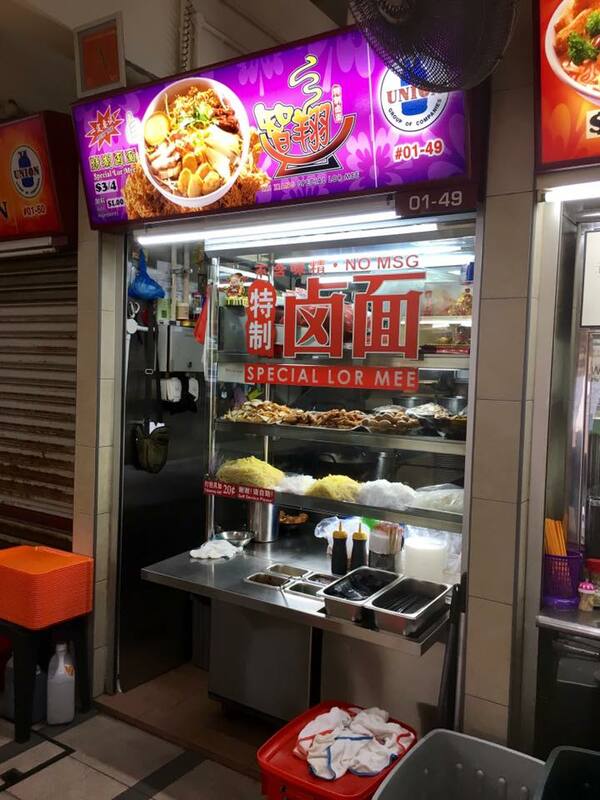 not quite the standard of soon heng lor mee at beo crescent. 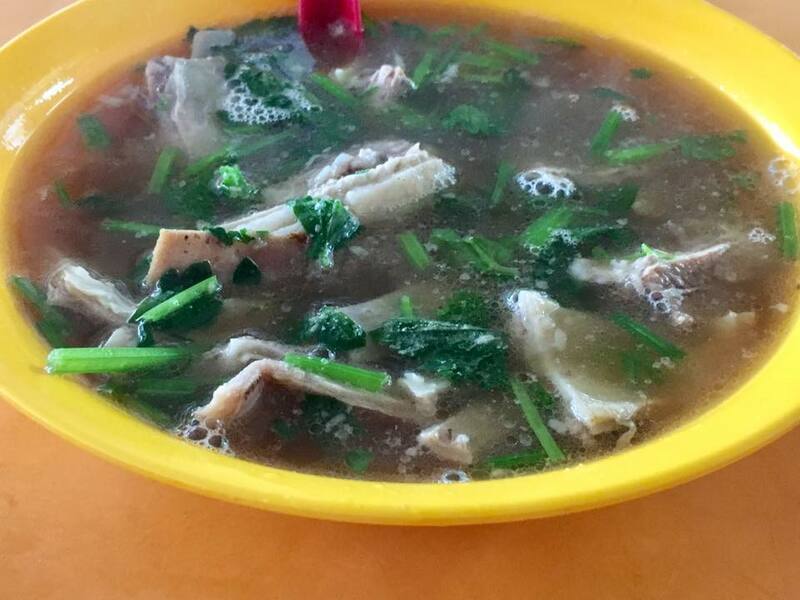 nor the equally good S$2.50 hai tang lor mee at mei ling food centre. anyhow, still a good, competent lor mee. lor mee not my favourite, so i unlikely to try this here again. the stall opened at 5.30am & closed after lunch soon after 2pm! both of us ordered less noodles 面少, so we got an extra 6th fishballs. fishballs were bouncy & sweet as always. & the noodles were qq (al dente), not lumpy & mushy, and most important the chilli was great with noodles. always enjoy the noodles here. 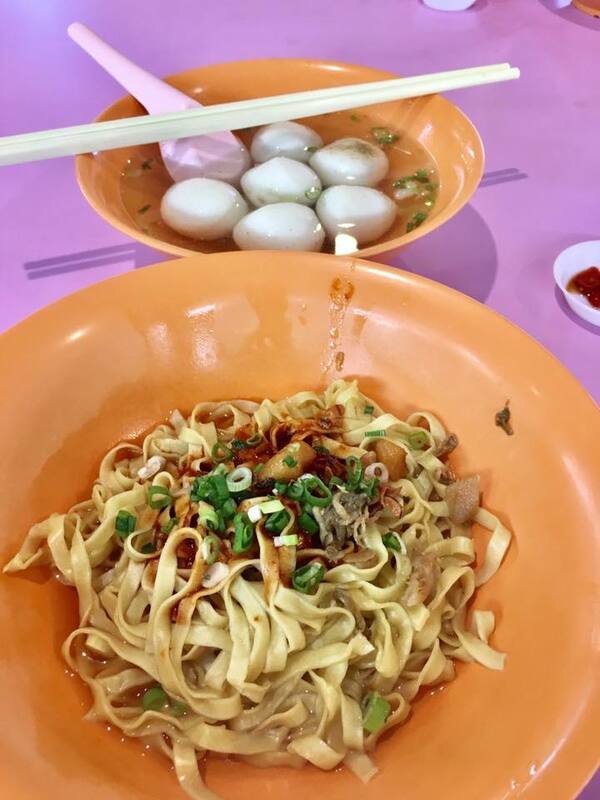 today though unlike say ah heng curry chicken noodles at hong lim food centre, i would not purposely drive to have this fishball noodles. it’s just S$3, so overall quite satisfying eating it. another OPS buddy joined us. he ordered a mee siam. afterwards, we walked over to the dessert stall.. i had soursop jelly & my 2 friends had cold cheng teng. had a great time chit chatting with good friends. this my 34th friday breakfast community meal at teban gardens community service centre. i had done wine chicken for teban gardens community breakfast previously on 9.12.2016. today’s was similar but instead of celery i had taupol, onions & leek sides. 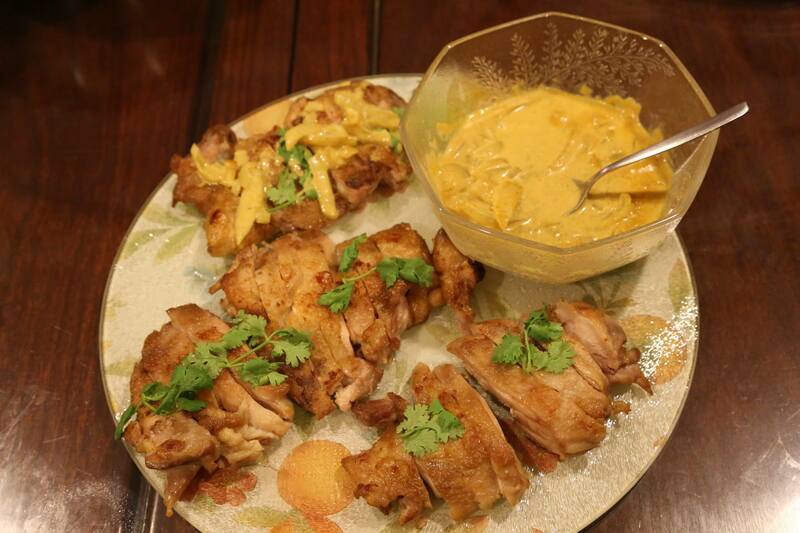 basically i used my chinese wine braised chicken 黄焖鸡 recipe here. 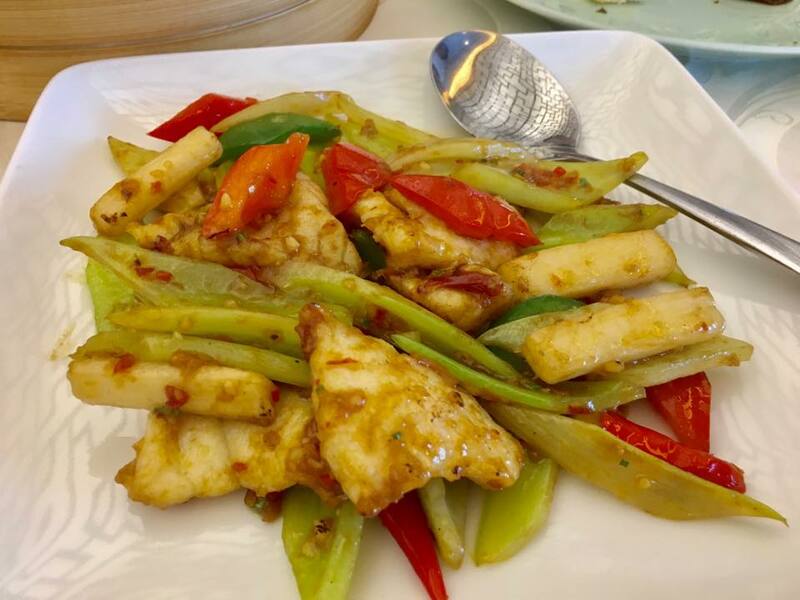 then very hot wok, fry sliced ginger (3cm), 2 cut chilli padi, then add 1 tbsp chopped garlic in 1tbsp oil. additionally i made intense chicken stock the evening before. 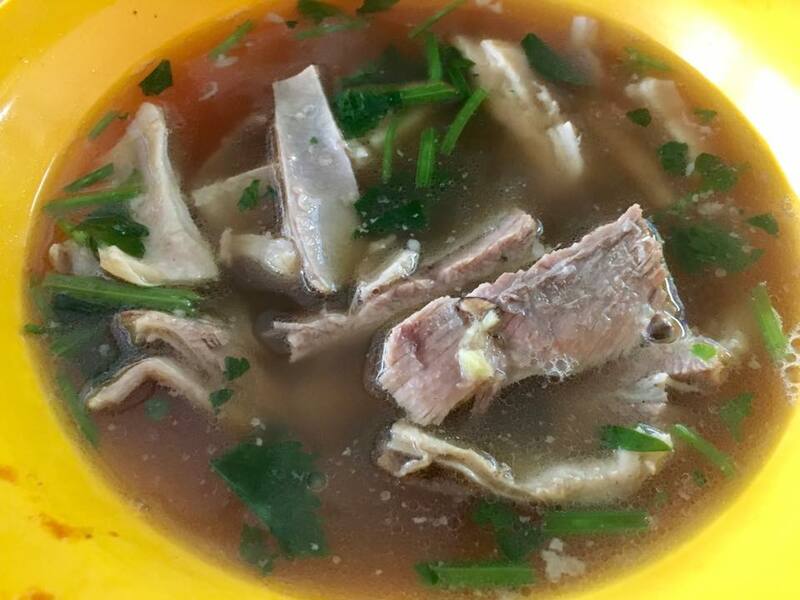 cut a packet of 12x taupok to 4 slices each, then boil in stock for 1.2hr to infuse the stock flavours to the taupok. 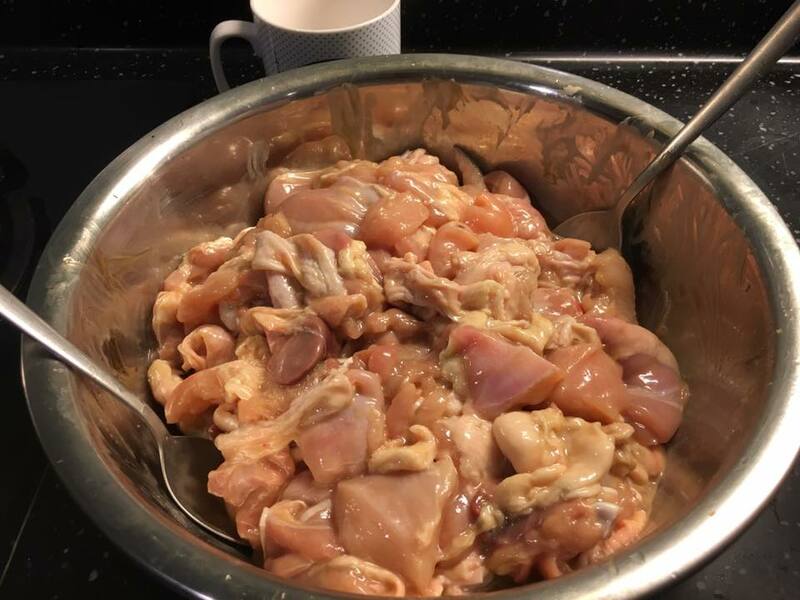 in a separate wok, fry chicken (high heat), remove chicken & add wings first to the taupok (wings took a bit longer to cook). 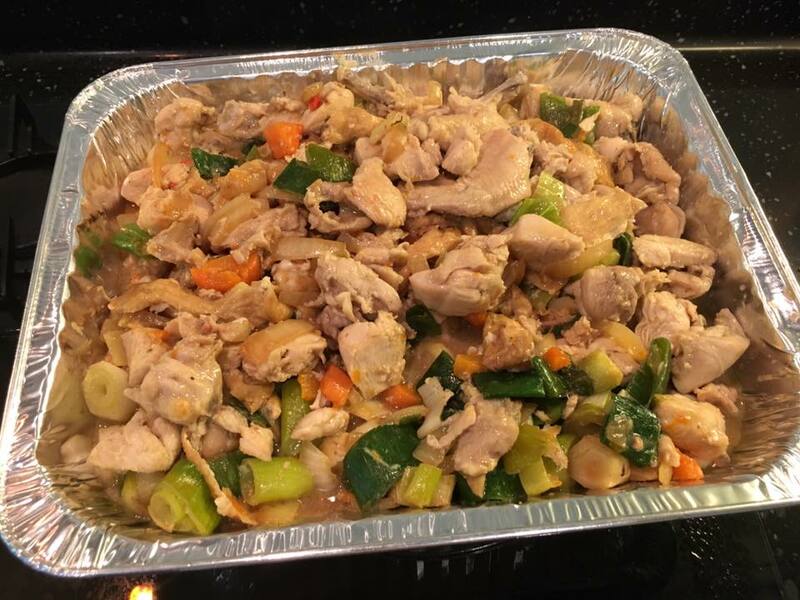 add another 4 tbsp shaoxing wine & cover (low heat) to cook the chicken.need about 8-10mins..
in the separate wok, fry the onions to soften then the leek. 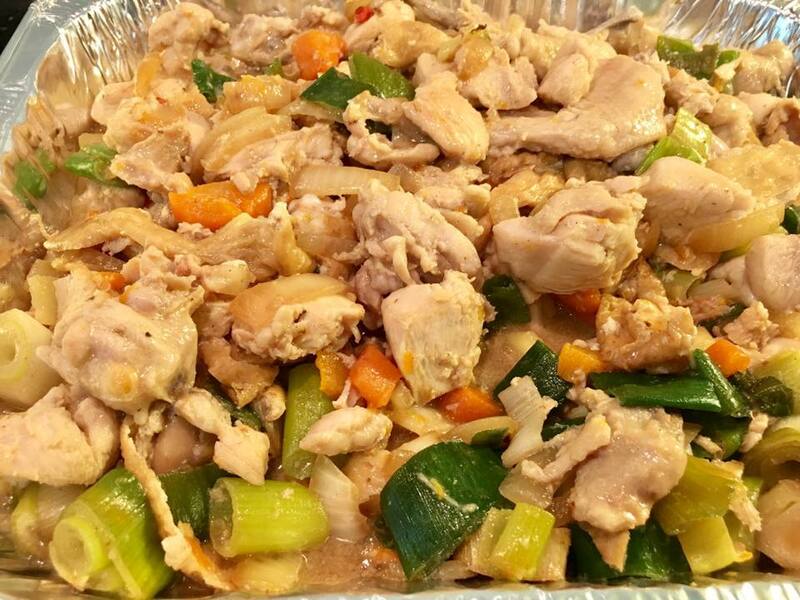 when leek is cooked just right (about 5mins) add to the chicken & taupok. the completed dish looked quite appealing. and the chicken tasted tender & sweet. 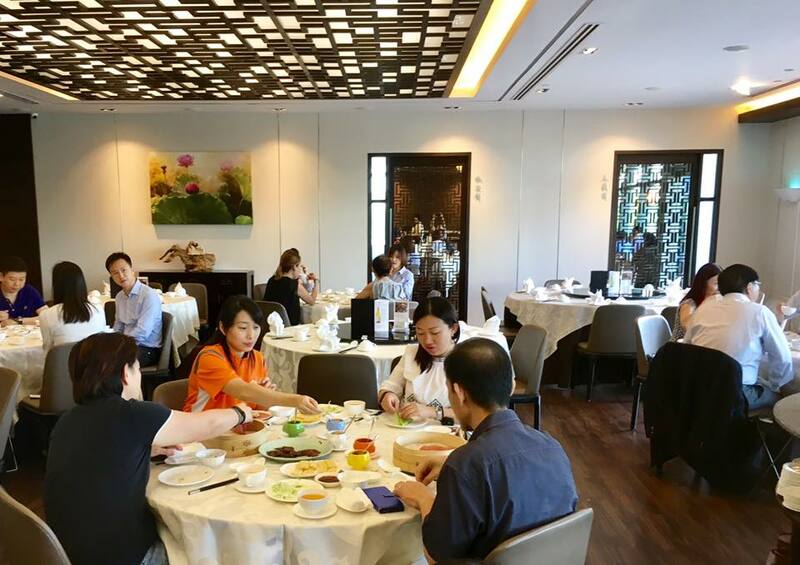 recently the residents attending the breakfast had increased, now it’s above 120.teban gardens catered a good breakfast of beehoon, porridge & you tiao, another resident cooked a dish of fried egg omelette so including my dish, there was quite enough food for everyone. they decided to car-pool & drop by my place at 10am. so we had a round of brewed coffee & good chat at my place. 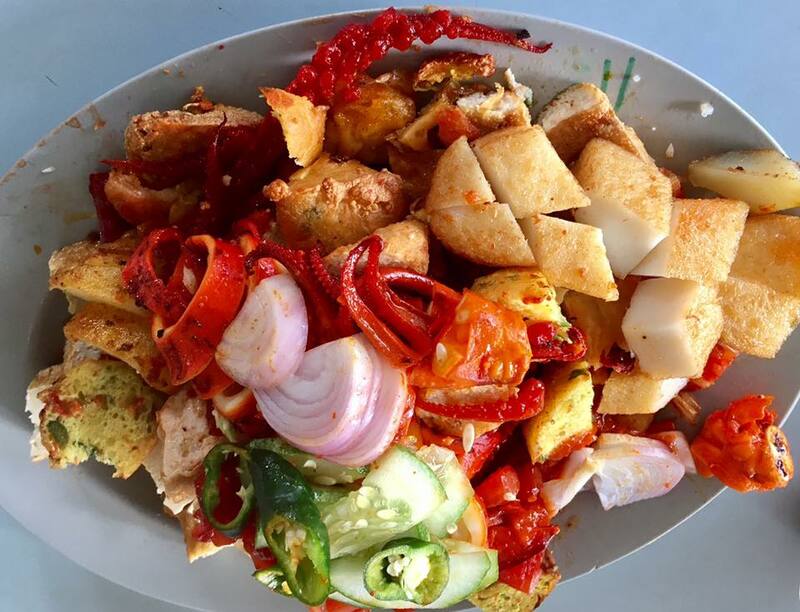 we left in one car, 5pax (a good green practice) by 11am & was at the indian rojak stalls by 11.15am. 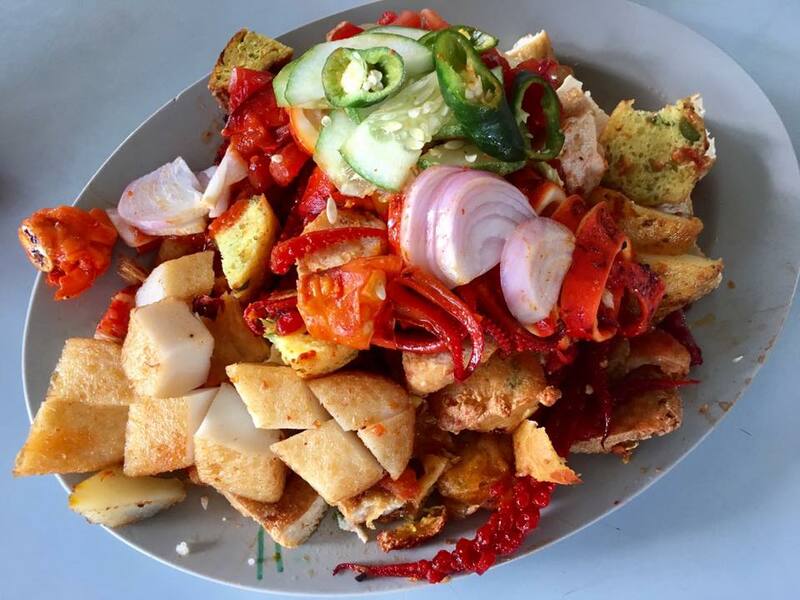 rojak was not open yet. a few men looked like preparing to open the stall. 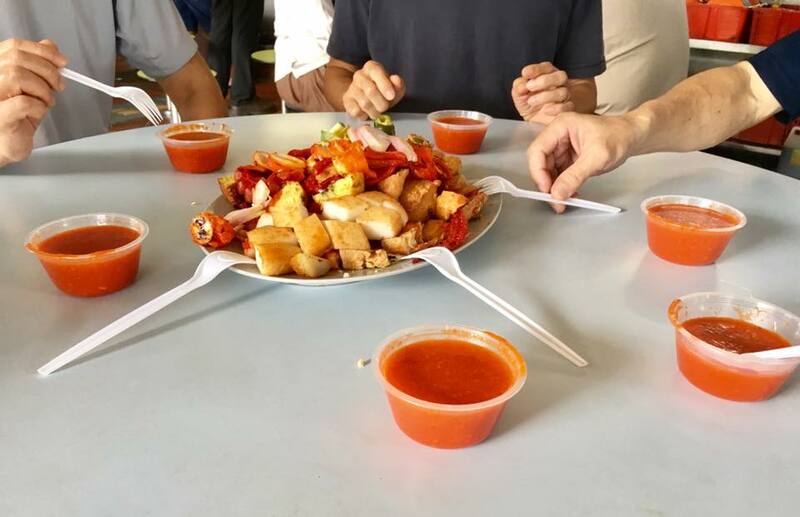 from the last makan we had here on 25.2.2016, we thought that salam rojak stall 73 offered a better deal. the stall said it would be ready in 20mins. we ended up waiting for about 50mins & it didn’t look like any progress. i finally asked them whether they were opening the stall at all. it was then that they told me the stall was closed last 2 weeks & they were just returning today (could have told us earlier). 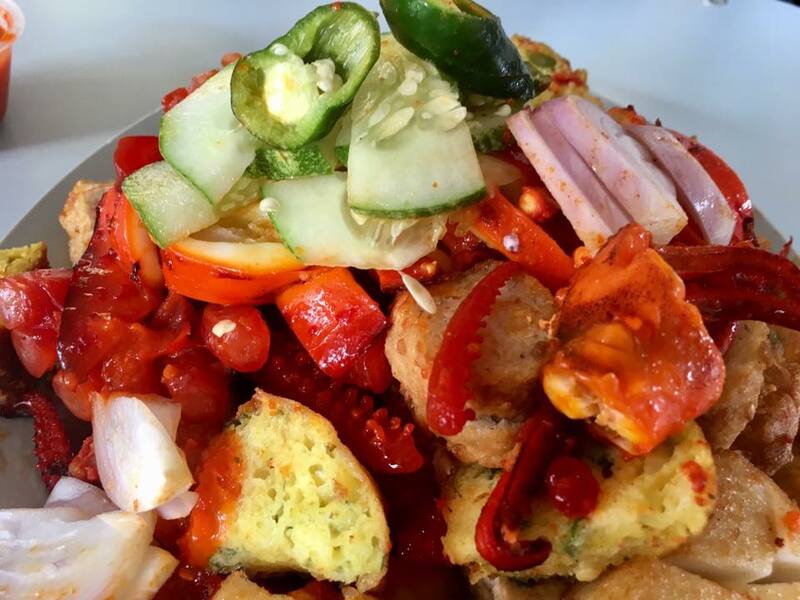 so we decided to go with habib’s rojak at stall 68 instead. we ordered almost all the items! not quite la..just the main ones, and included both the squid & the cuttlefish. 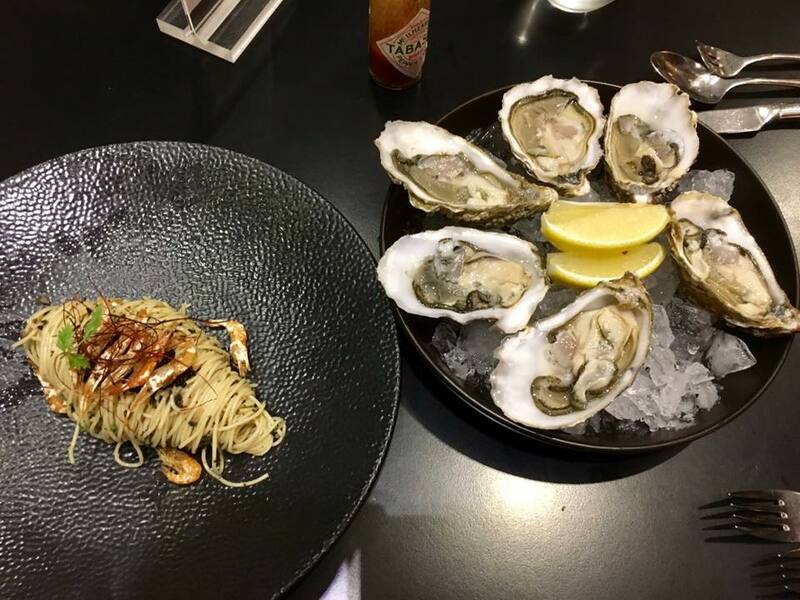 it was rather a large plate, and the cost was S$29. it looked like 2x the size of what we ordered previously which was the about S$23. last time i came here was on 15.4.2017..
one of the famous dishes and a very pretty looking one is the five colour peking duck 五彩缤纷鸭. it comes with 5 colour wraps & 5 sauces, not that i can remember them all. 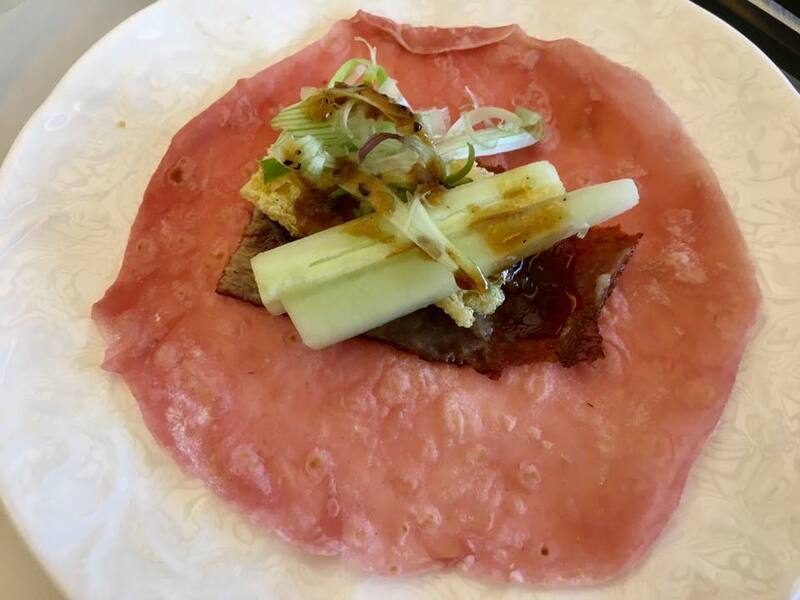 normally the peking duck cost S$88++, and that does not include the second eat, which they charged S$28 to make a duck beehoon! 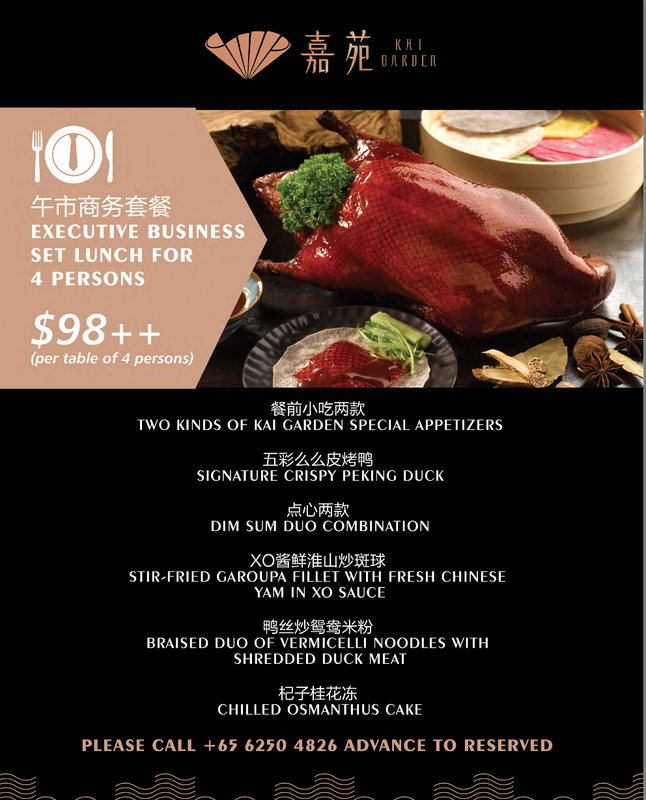 so basically kai garden is expensive, or very expensive! 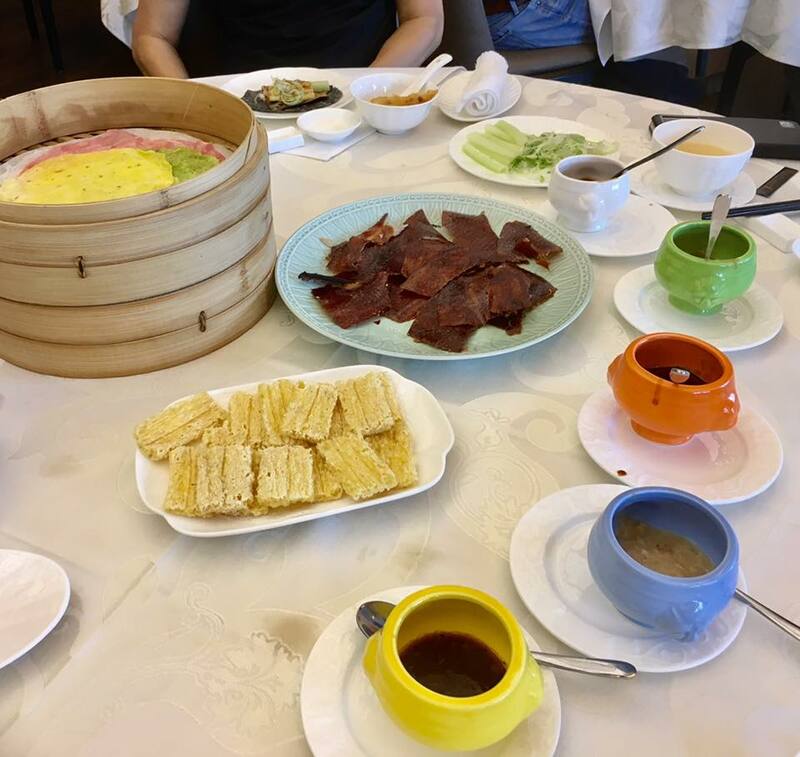 for this lunch set, they offer the peking duck + the second eat beehoon, and also appetizers, dimsums, garoupa fillet & dessert – all for S$98 for 4pax! it is quite big place & the tables were quite well taken up. 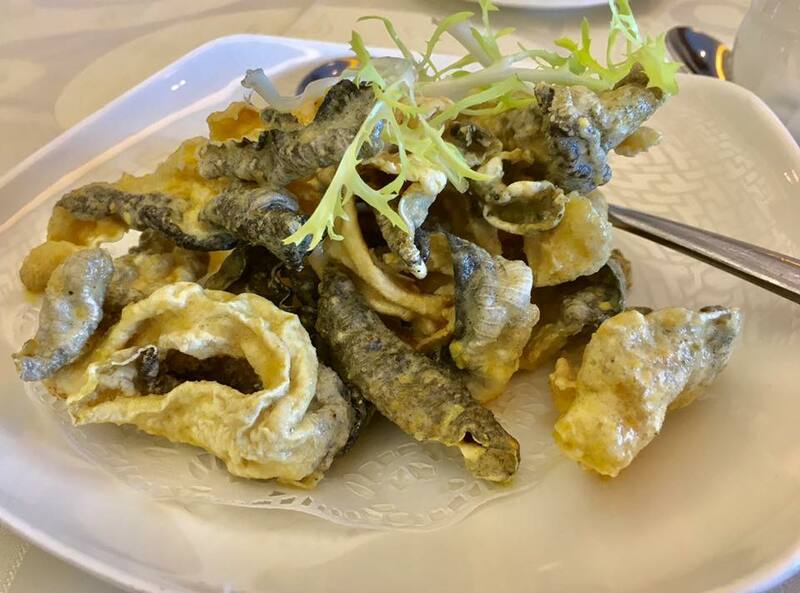 the2 small eats – appetizers were e marinated cloud fungus. this was very good. 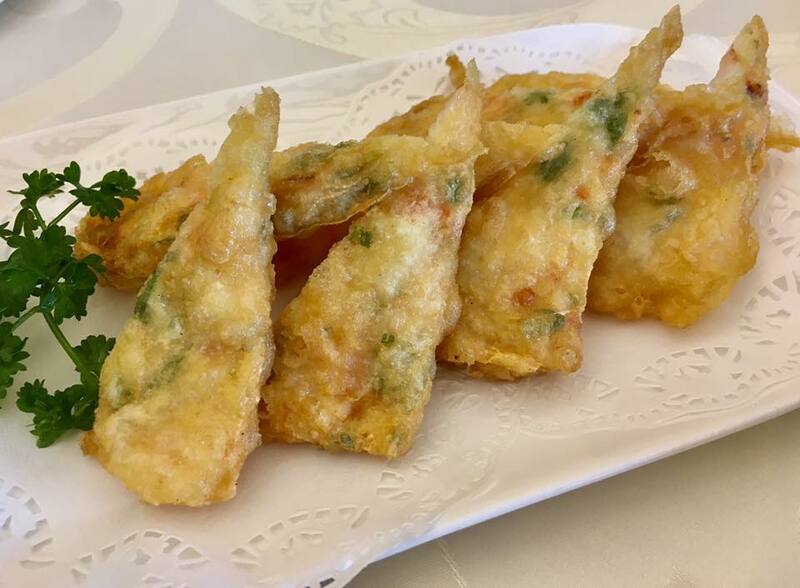 & deep-fried fish skin also very good. the 2 dimsums were the xiaolongbao (i forgot to take photo) and the fried prawn dumplings. 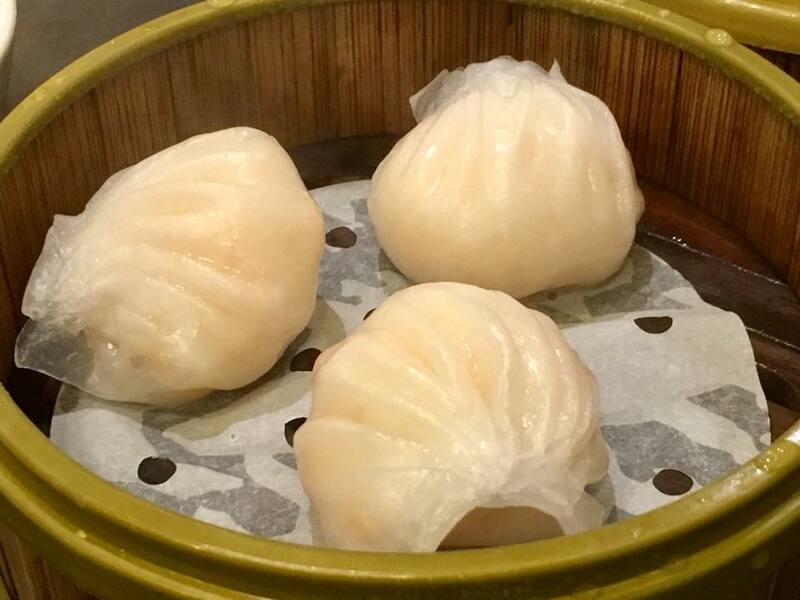 prawn dumplings very good…xiaolongbao good standard no better than other places like crystal jade & imperial treasure. 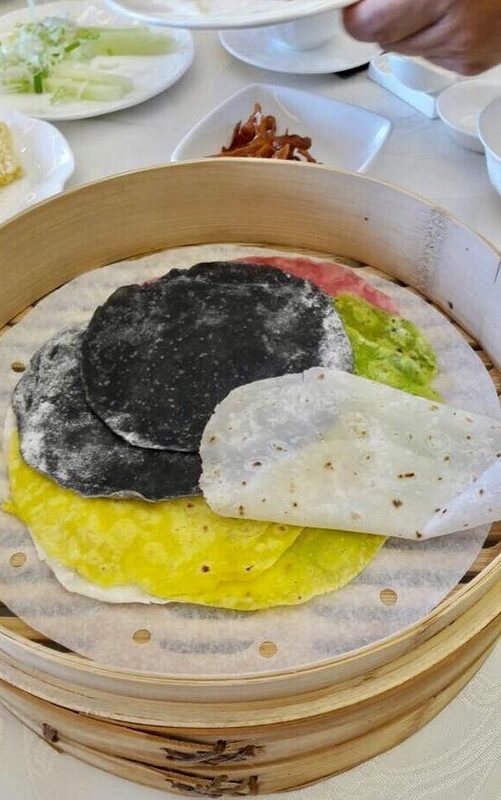 what is special about this peking duck is the 5 colour wraps – original, spinach, pumpkin, beetroot & squidink. 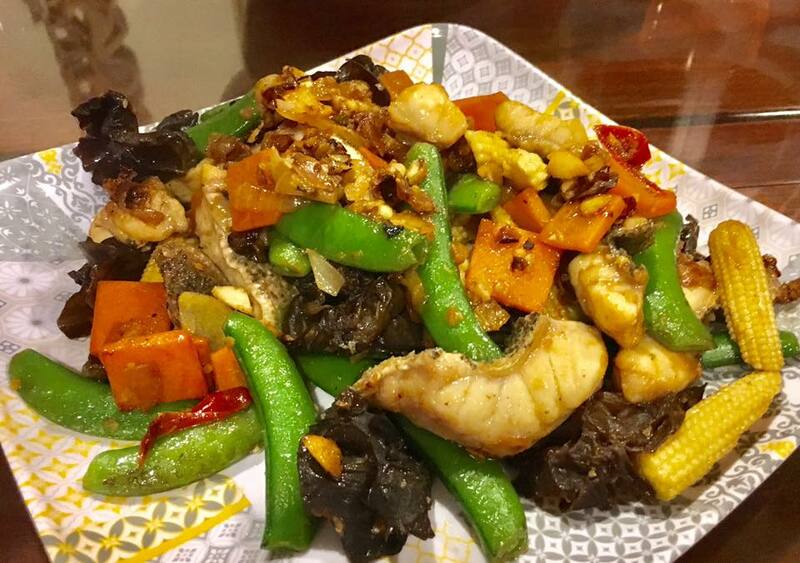 & the 5 colour sauce – original, chef sweet sauce, sesame, pepper, seafood. 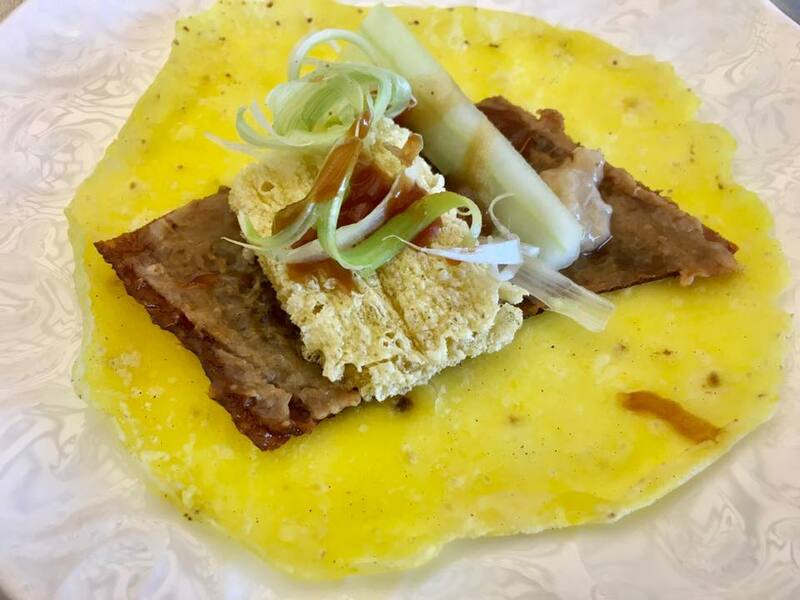 another special item is the corn crisp. 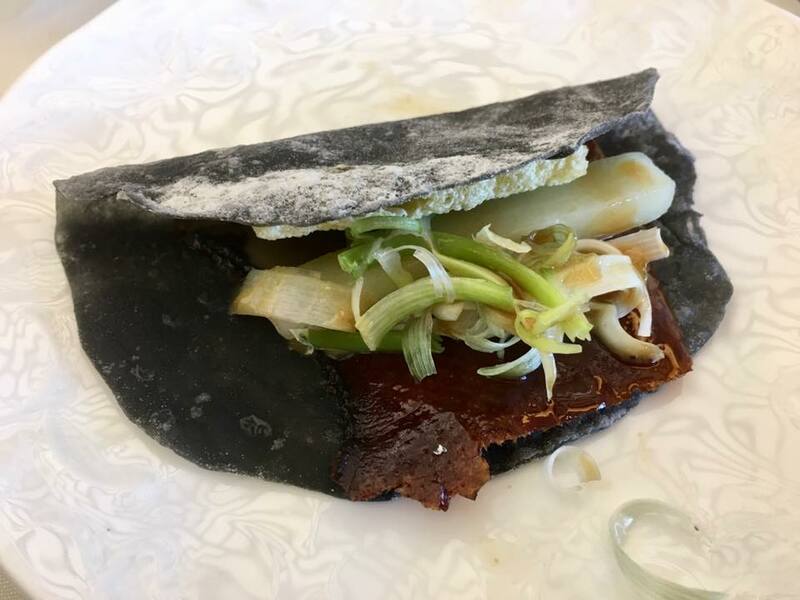 it added a special texture & bite to the whole wrap. 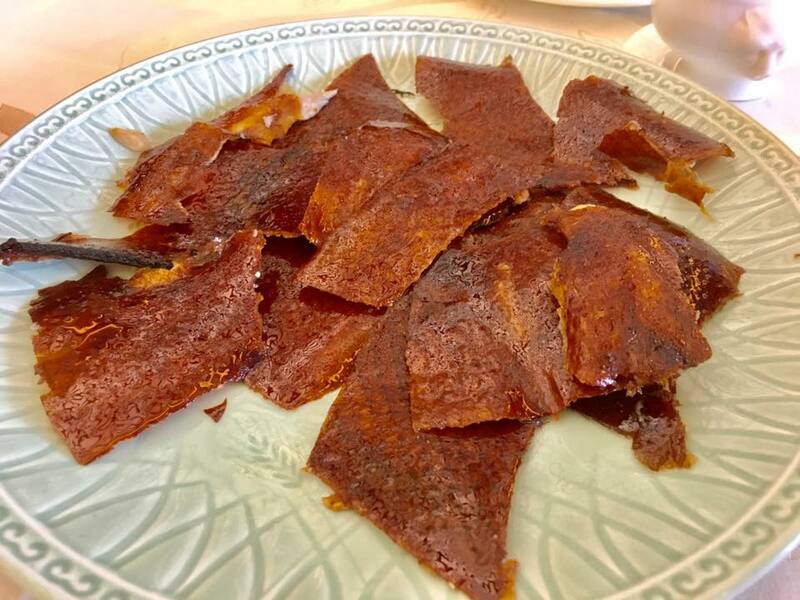 duck skin was sliced very well, very thin & large pieces. of the sauces, my preference still the original & the chef sauces which were the sweeter ones. the seafood more savoury, and the sesame & pepper were both good. 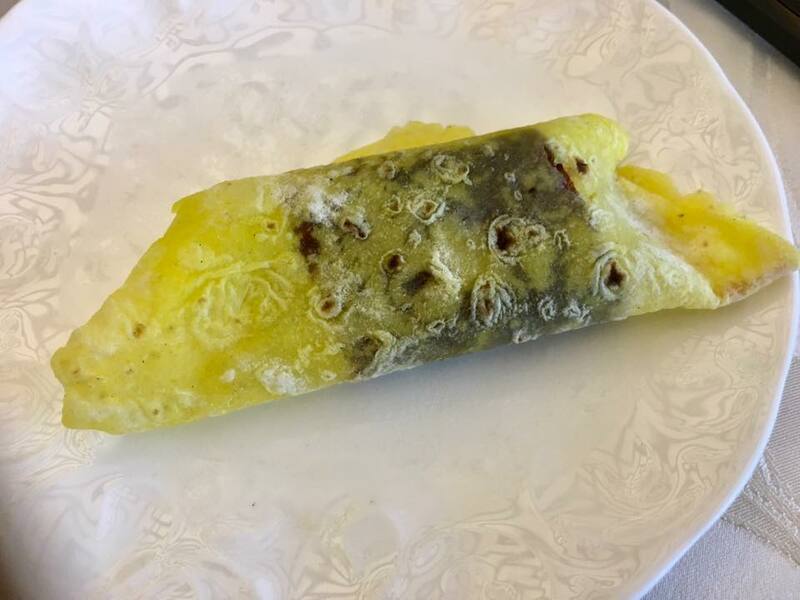 the wraps, i couldn’t distinguish the taste of one from the others. 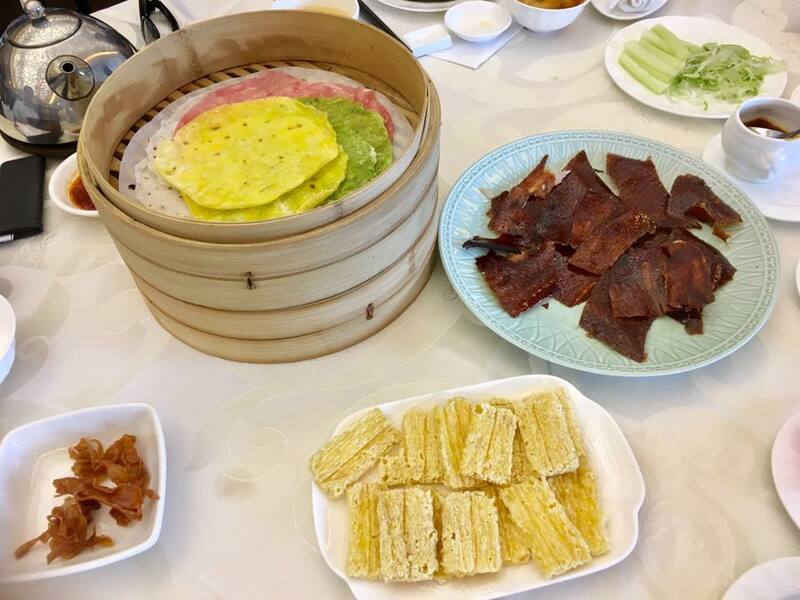 anyway the overall dining experience, taking this peking duck – very good la! whichever wrap we tried, all were nice. & there was about 4 or 5 pieces for each of us, and with duck skin to spare. the garoupa fillet was more of the ordinary stuff. the duck beehoon was very good! 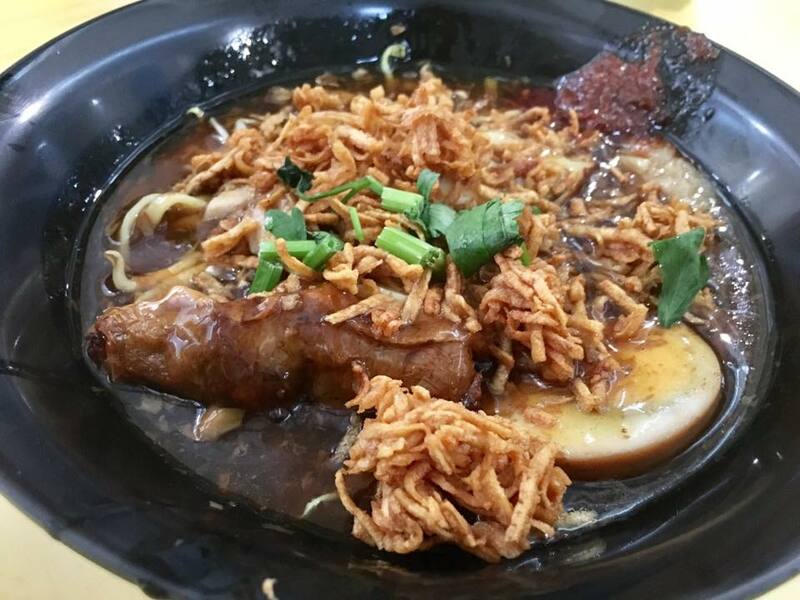 this the 炆 braised method-the best to produce a tasty beehoon. just have the right amount of reduced very tasty stock, add the beehoon & let the stock reduce further & the beehoon infused with the flavours. very easy to make. & such wonderful flavours. almost want to finish my whole bowl. i picked 黄金桂 for our tea. it was S$3.20pax. that is like a cover charge & included the starter appetizer. tea has a range of prices, so in this kind of places must be careful what order so we would’t be paying 1/2 the price of lunch for tea. anyhow, the restaurant forgot to charge tea=4xS$3.20++. i pointed out to the lady who brought the bill. she said nevermind she would waive it. 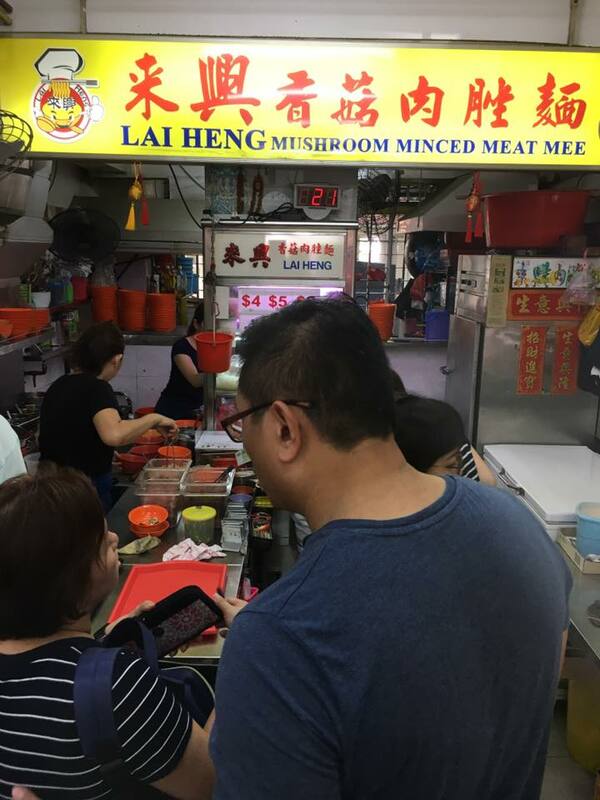 later we got her calling card & realised she was the GM…anyway i told her since she did not charge the tea i would give a tip & she said it’s ok just to put on the credit card, so i added about S$15 tip, for a total S$130nett. that’s lower than what we should have paid for tea anyway. very good lunch. all my OPS bros enjoyed it. 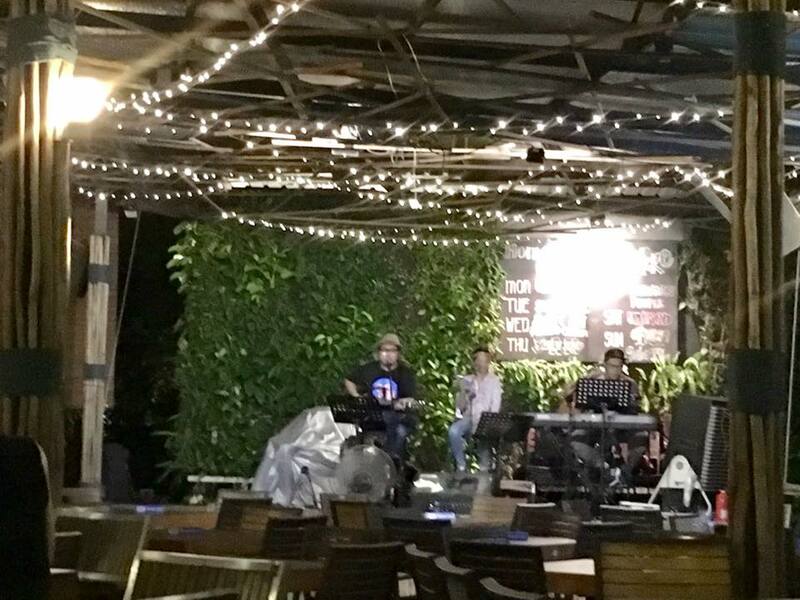 after the birthday dinner at da paolo pizza bar for aunty Bes, wife suggested we go to timbre @ gillman for some drinks & live music. 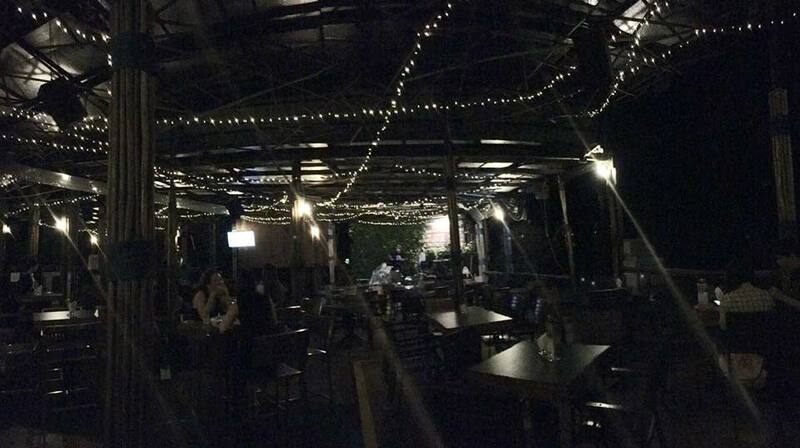 one daughter was busy, so wife, son, eldest daughter, aunty Bes & i – 5pax, went to timbre. 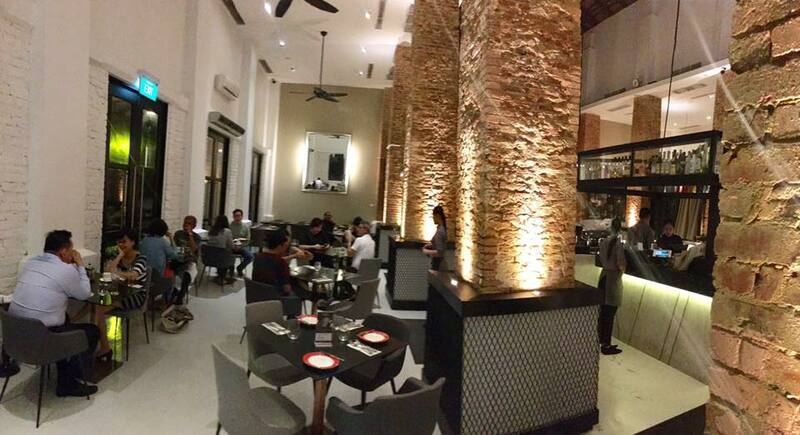 this was the little bali place i used to come around 2000-2002 i think when i was still doing some business. quite a nice place to chill PLUS live music. crowd was thin this evening. son said when he came with my wife, this supersonic?? music was very good. today though he said tonight it’s like 1/2 the band (3pax). somehow this evening no energy no vibes (unlike the live lounge in cardiff i went with my 2 traveling companion in my recent wales trip), but it also had to do with audience interactions. it’s like a mutually enhancing dynamics. the SMS music request NOT working so aunty Bes went to deliver her music request herself & they sang her couple birthday songs. aunty Bes was the most into the groove person in the whole place, standing up & singing & clapping. a very Happy Birthday to aunty Bes! after that we went home & cut cake, sing birthday song & take photos. today is our helper aunty Bes’ birthday. ambience quite good, with alfresco sitting also. 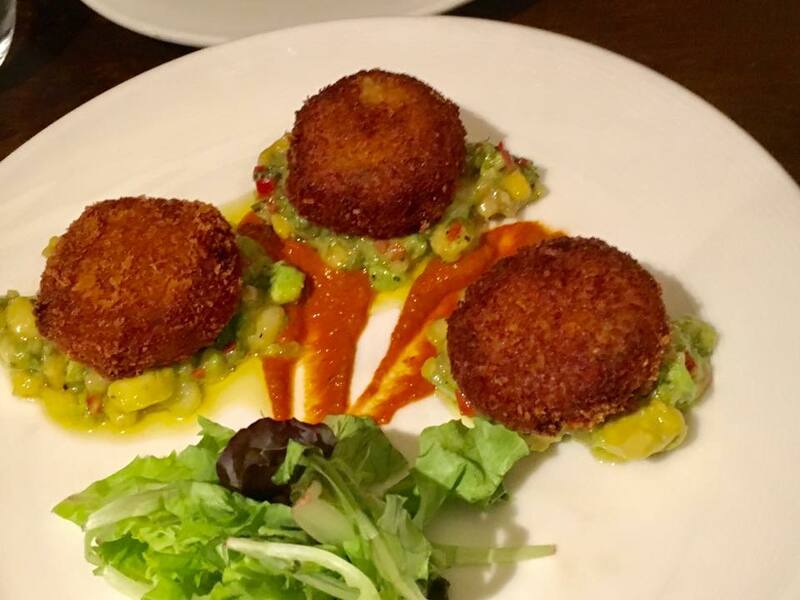 daughter ordered the food.the crab cake was good. very well done. i attempted this some years back. maybe can revisit this item. 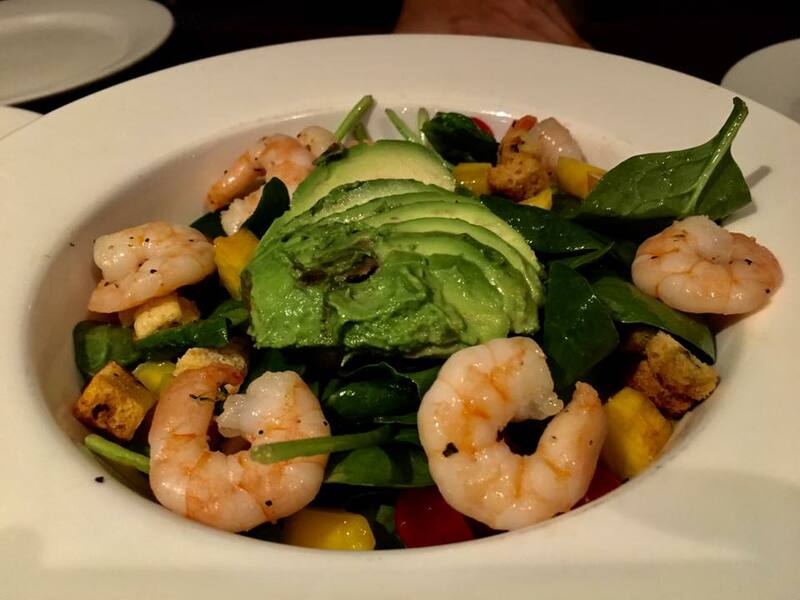 the prawn salad was good too, refreshing. 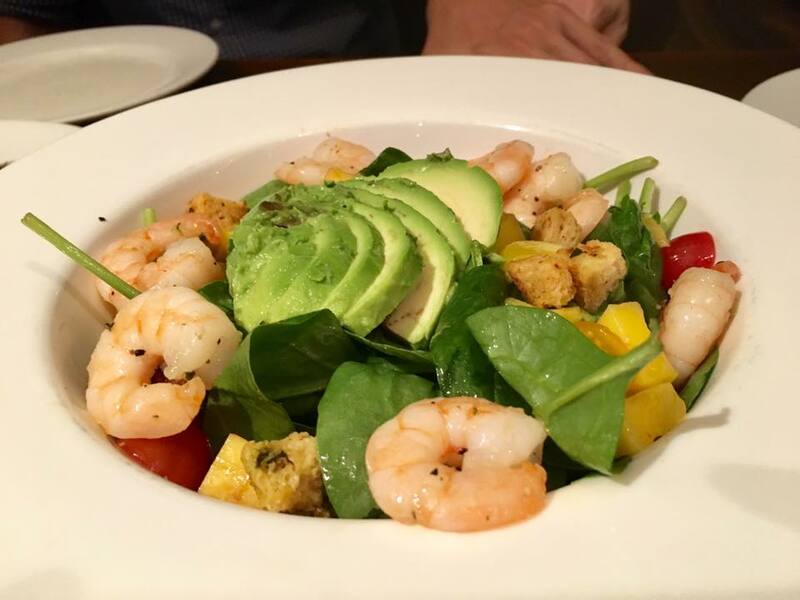 great prawn salad with avogado & croutons. good serving too. 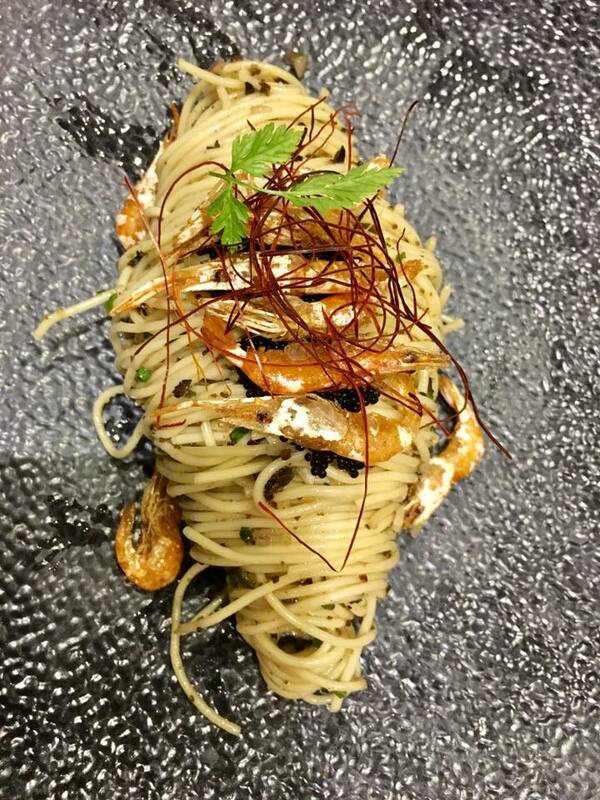 the crab spaghetti was very good restaurant standard, creamy, good amount of crab meat, great shell fish flavour & maybe some cognac. we ordered 2 portions for 6pax. 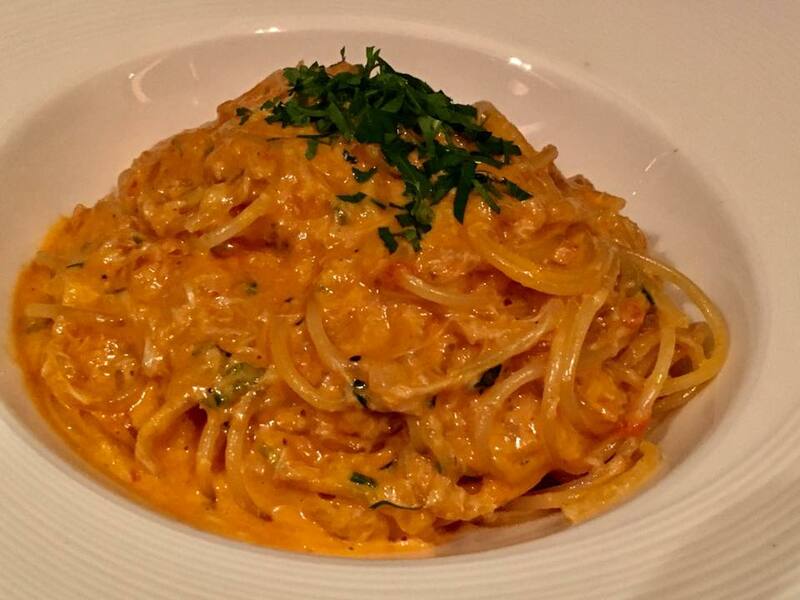 it’s similar to the pink sauce pasta at valentino. not quite the same as wife & my pink sauce pasta. i am thinking how i can recreate this dish. i will try fresh crab & cognac i think. 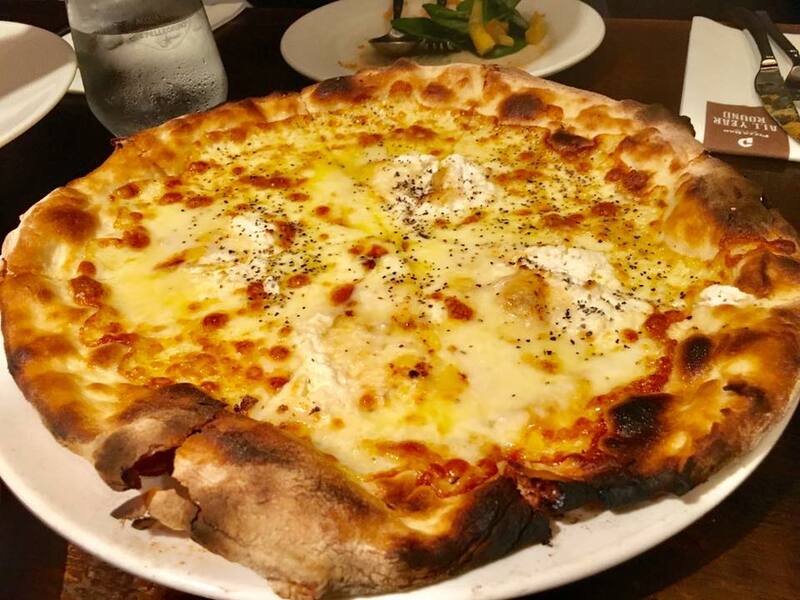 thequattro formaggi – 4 cheese pizza turned out to be the better one. everyone liked it. but oddly the pizza in this pizza bar wasn’t great at all. maybe it’s me, not a pizza person. anyway we all left most of the thicker outer crust. neither great texture for this part nor flavour in the dough itself. 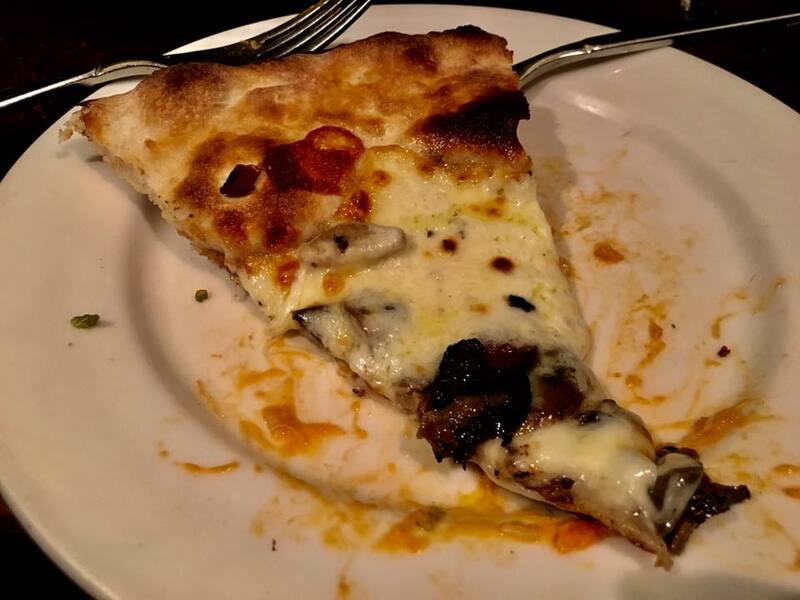 the truffle mushroom pizza was the poorer by comparison. 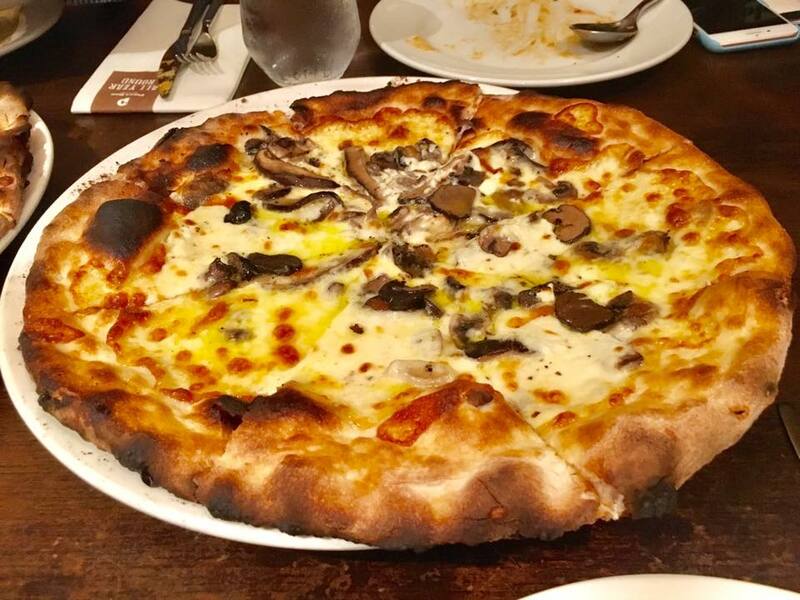 zero truffle taste basically, all overwhelmed by the mushroom..an ok mushroom pizza i guess. overall i think it was like S$200net for 6pax. we did not order that much food, but it was also enough. not particularly hot on this place myself, but it is doable to come once in a while. in fact this my first time here! my good RI bro came to fetch me to buy LED lights at a shop in hillview terrace on 15.5.2017.
after that i wanted to go lunch at tunglok signatures at orchard parade hotel. i already parked the car, and my friend suddenly remembered that tunglok had stopped amex lovedining privileges. i was away so did not get the grapevines. we returned to the car but there was no grace period for the carpark so kena charged S$5 for like 3 mins. what to do right? 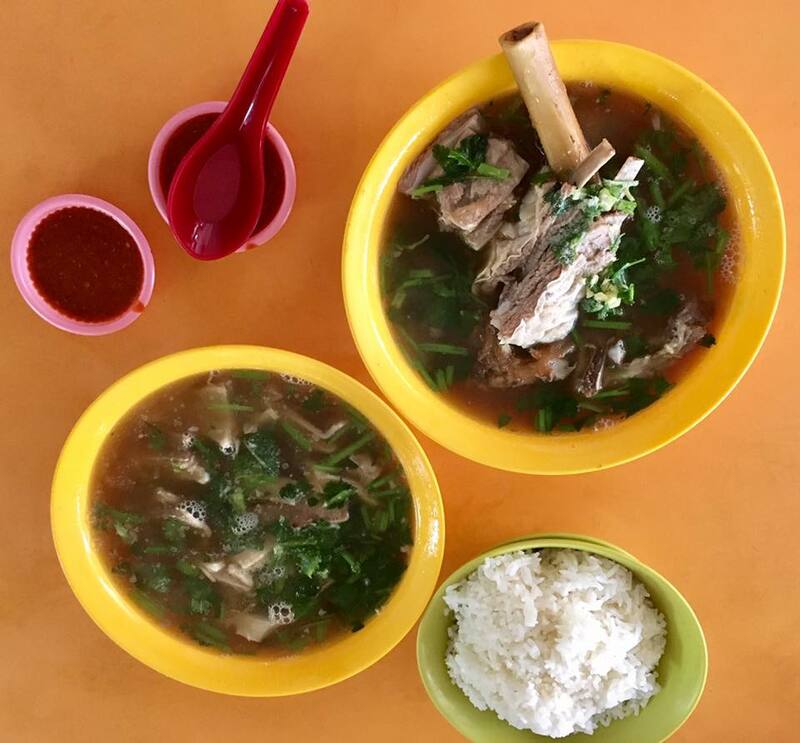 anyway we decided to go for chai chuan tou chinese mutton soup 柴船头羊肉汤 at bukit merah view though t may be long queue & carpark crowded. luckily we got a carpark immediately! there was a queue of maybe 12pax but it was ok like 10mins+ wait. 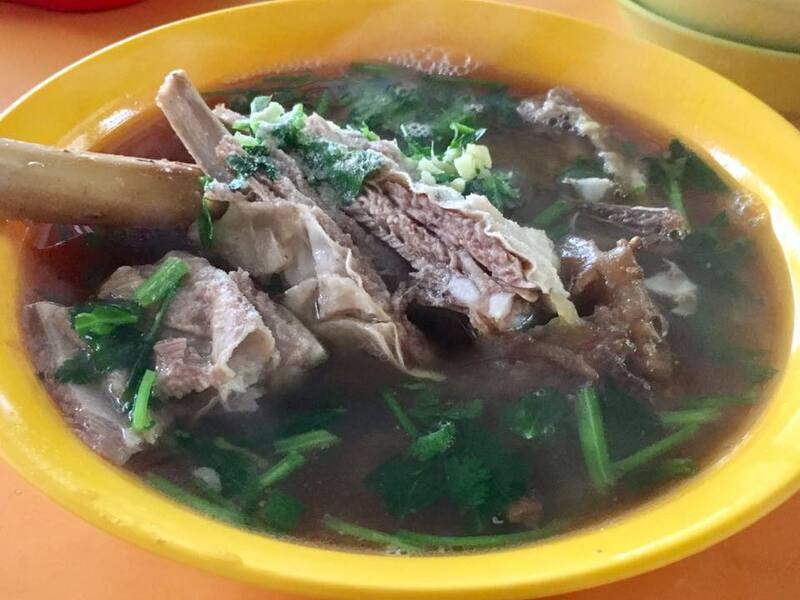 somehow the mutton soup was not as good as i expected, not having taken for long time i thought it would be very good. it was still better than the other places like i had. the soup not unnaturally sweet, but like not as intense & flavourful as previously? was it just psychological? we ordered 2x $6 bowls. one was a 羊杂 which we didn’t want the mitton balls so just had stomach & mutton. 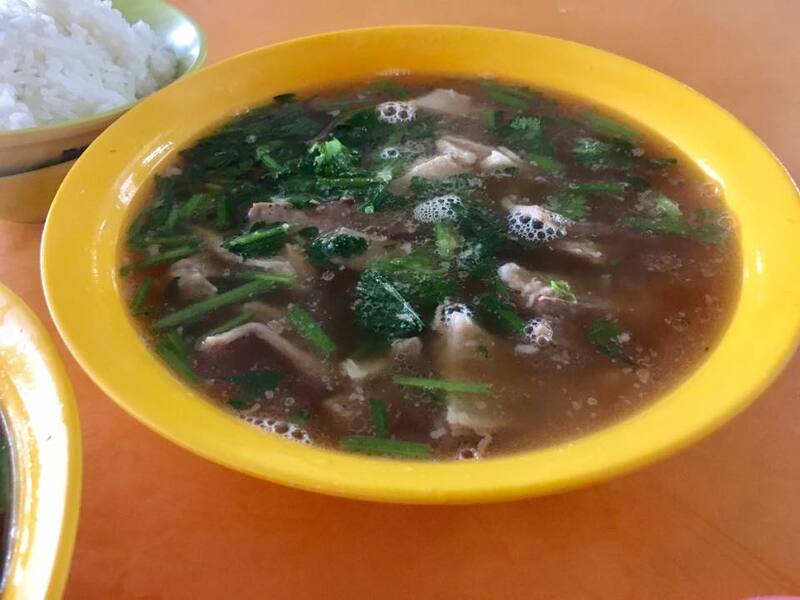 however it did not have the 金钱肚 so very prominent in the bowl i had previously on 14.8.2014. why??? the other bowl we had ribs. must say we could not tell the difference between the specified ribs order & the 羊杂 which supposed to have mutton? but looked just the same as ribs. not that i am complaining. 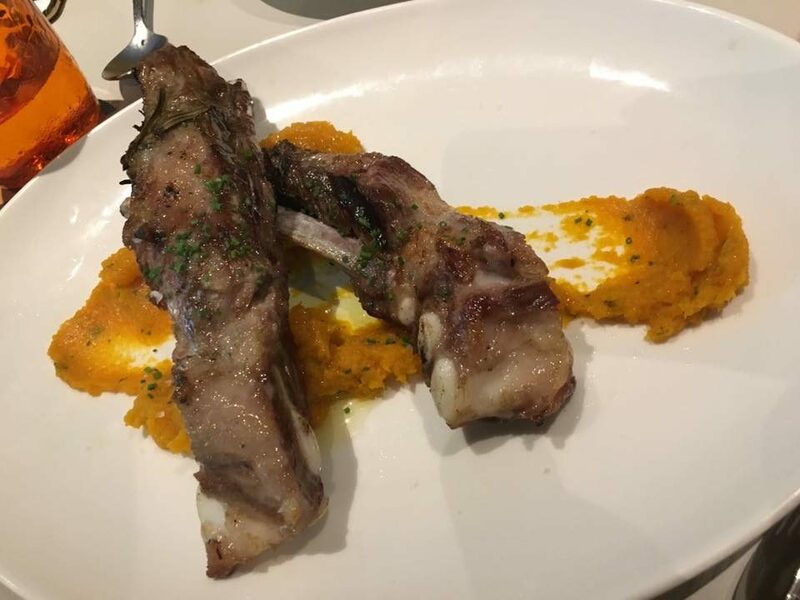 i love the mutton ribs. they were still tender & still very nice with the chilli. 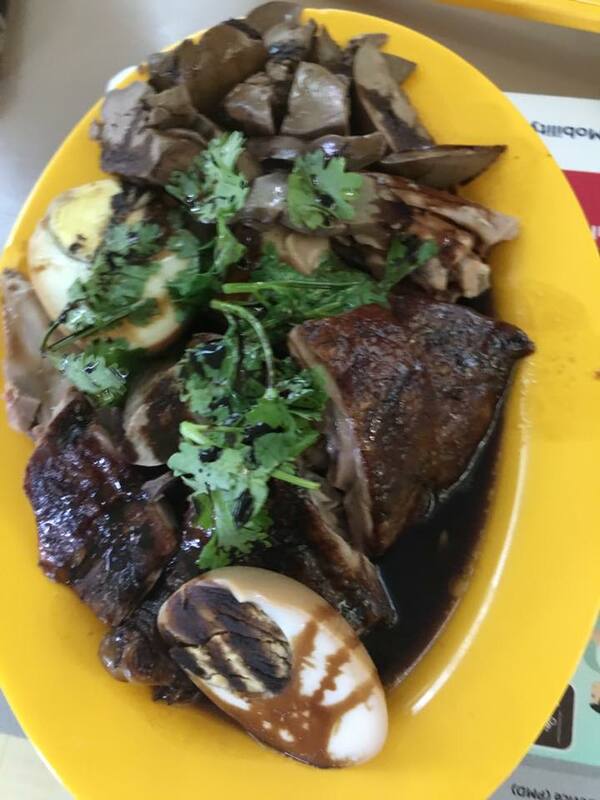 my main grouse was the not so tasty soup & the missing 金钱肚. 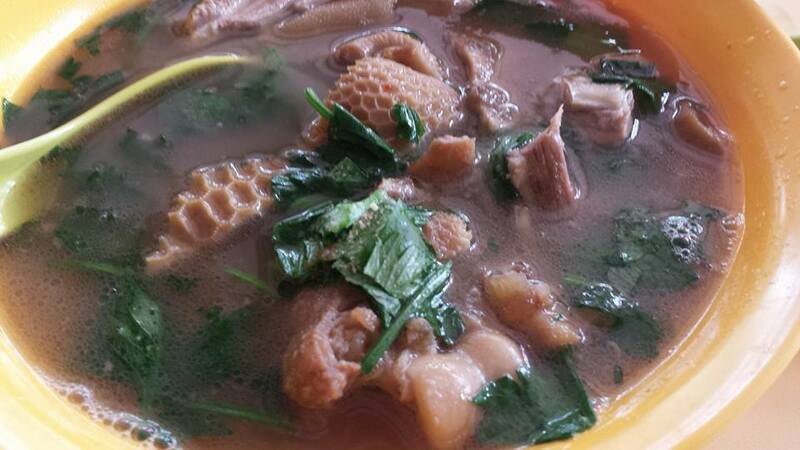 overall i still enjoy the mutton soup but not as much. maybe my palate has changed? no? 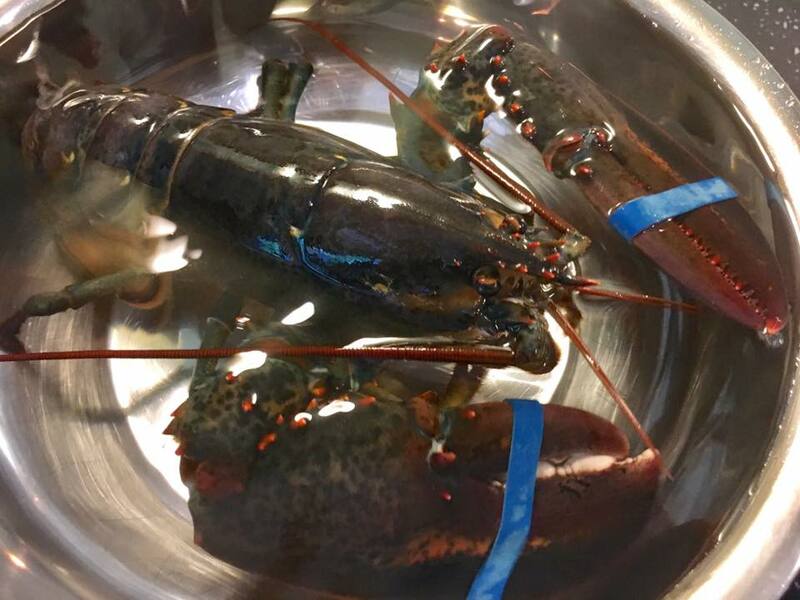 made lobster in superior broth 龙虾上汤焗 the second time. this time it was excellent! 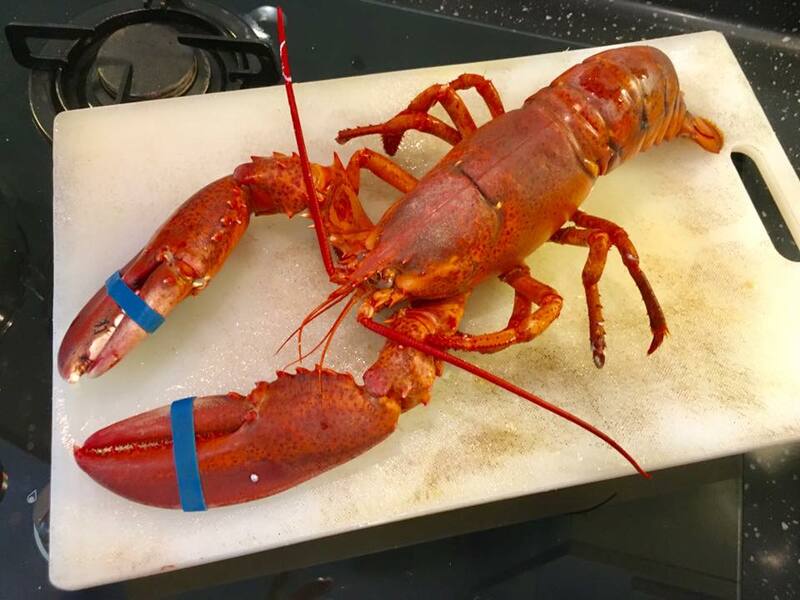 first time was when i made 2pax valentine’s day dinner on 14.2.2017. it was the same lobster, largely the same preparation, but somehow i did not get it right. even though wife said the lobster was good & tasty, basically it was the texture was somewhat overdone & not the best…not meeting my own standard la..
i decided to poach it this time round. it’s the same supposedly humane treatment. put lobster in the freezer for one hour so it is like in a “coma” or deep unconsciousness??? then either kill it by putting the knife through the head/brains or put into boiling water. so i put it in boiling water. for about 3-4mins, just looking at the colour…. this a less messy preparation than cutting through the head w/o poaching (which results in more liquids flowing out. anyway after removing lobster, it was the same putting the knife through the head & halving the lobster. then i cracked/removed the pincer shells & cut the lobster tail into 2 pieces. 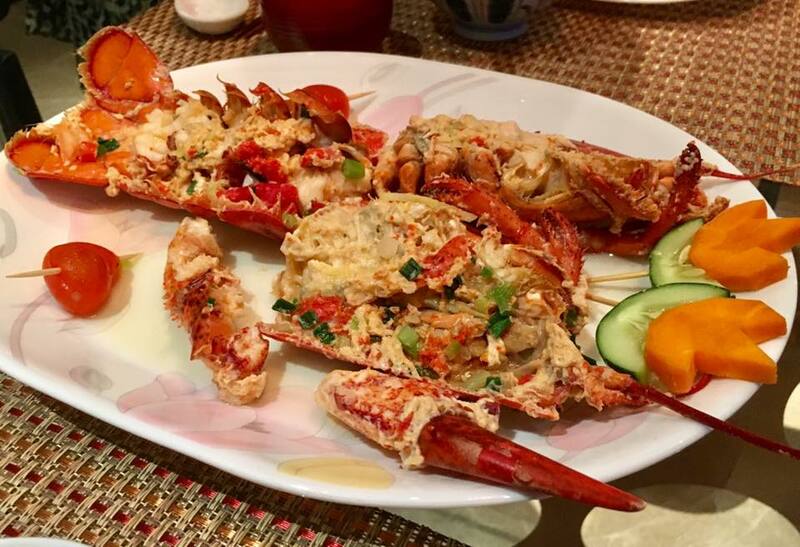 680g not really a lot of lobster – body 4 pieces + 2 pincer + head…. 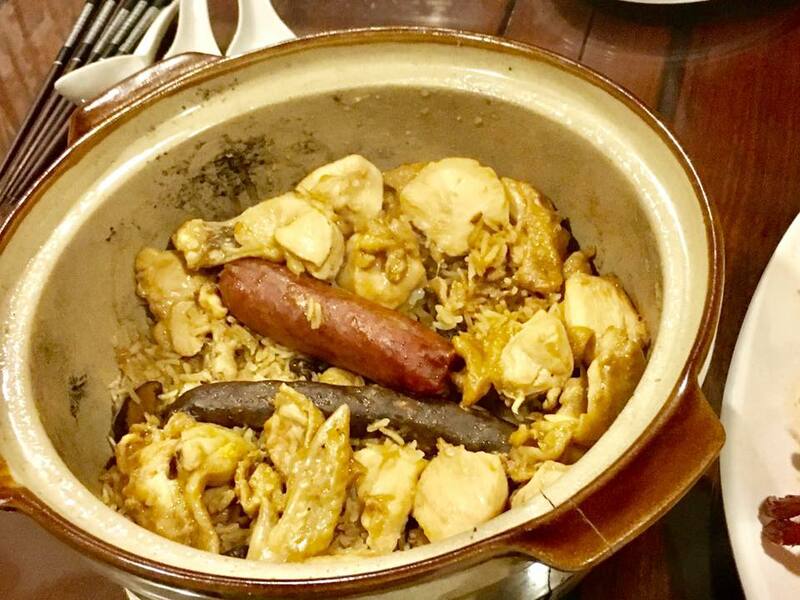 i was doing claypot chicken rice so had 1/2 chicken bones. i added 1 cut large carrots & boiled for about 3hrs. i added the lobster shell & boiled another 2 hrs, basically reduced & made a very intense stock/broth. the carrots were very nice after infusing the broth. 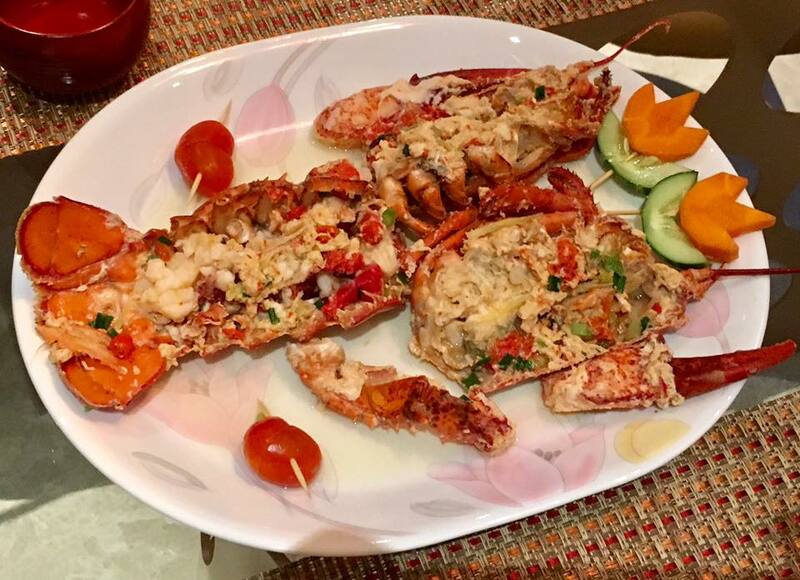 when cooking, i just fried ginger, cut chilli padi in butter, then added garlic, last added chopped spring onions with the broth, brought to boil, added in the lobster pieces & covered to braise + steam the lobster. another another 5mins. i turned the head, lobster tail pieces, pincers to make sure they are cooked & NOT overcooked. 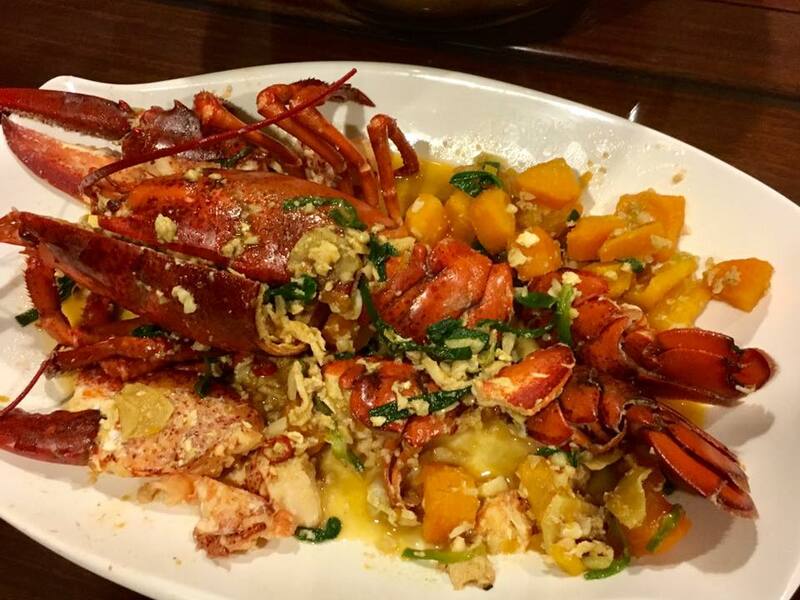 and i was able to produce a very sweet, tasty lobster in superior broth 龙虾上汤焗. so good! 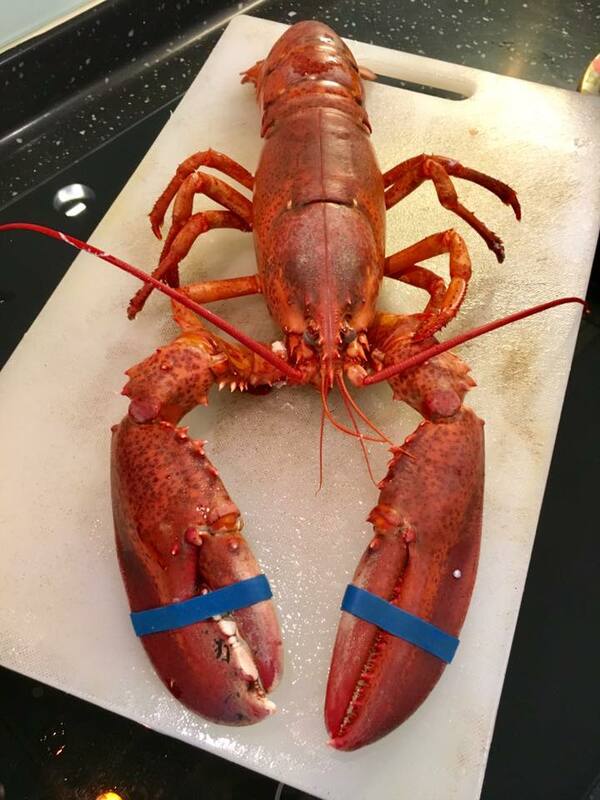 put lobster in freezer for 1 hr. then put it in boiling water. for about 3-4mins, just looking at the colour. put the knife through the head & half the lobster. then crack/remove the pincer shells & cut the lobster tail into 2 pieces per half = 4 large pieces. meanwhile prepare stock – boil chicken bone & carrot 3hrs. add lobster shell, bol another 2 hrs. 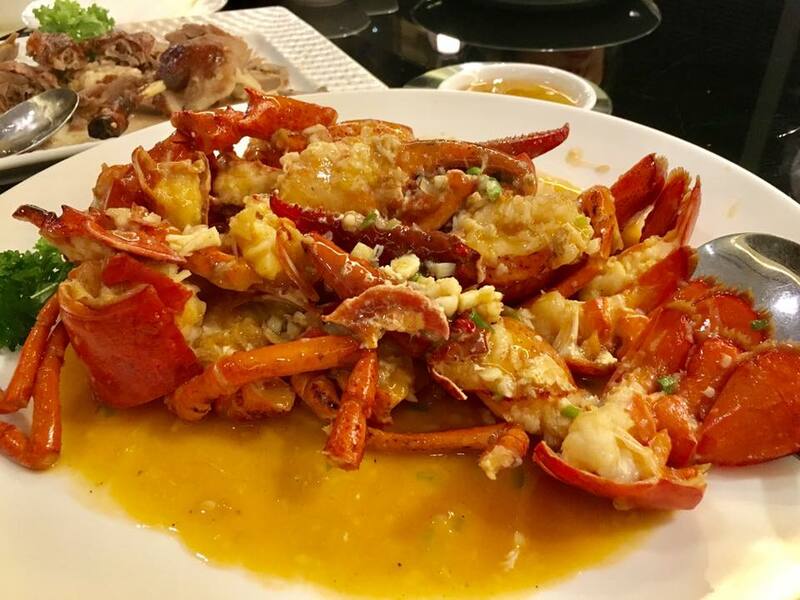 when cooking, fry ginger, cut chilli padi in butter, then add garlic, last add chopped spring onions with the broth, bringt to boil, add in lobster pieces & cover to braise + steam the lobster. another another 5mins. 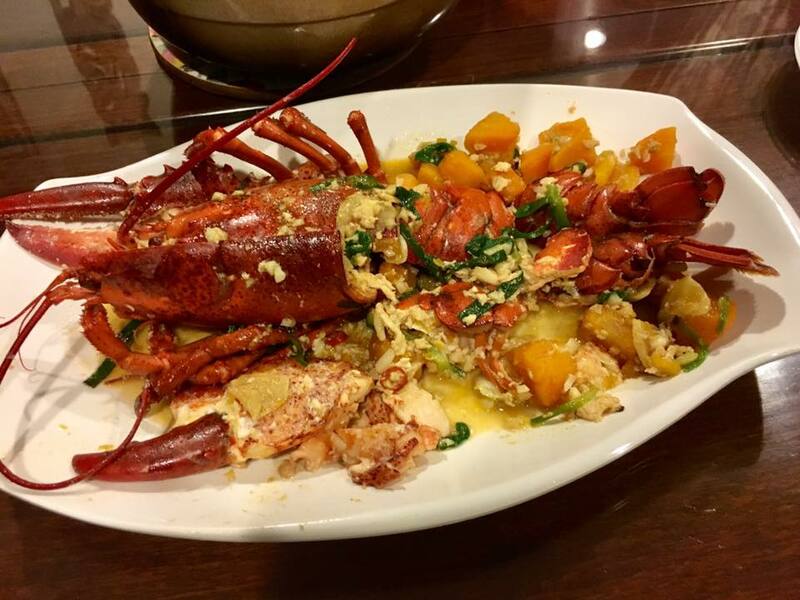 turn the head, lobstail pieces, pincers to make sure they are cooked & NOT overcooked. VOILA! originally i proposed to cook a mother’s day family dinner at home on 14.5.2017.
while i was away in london & wales, wife decided to have brunch at pimpam by foc on mother’s day. the 2 daughters now not available for dinner, so we decided to do homecooked family dinner another day. 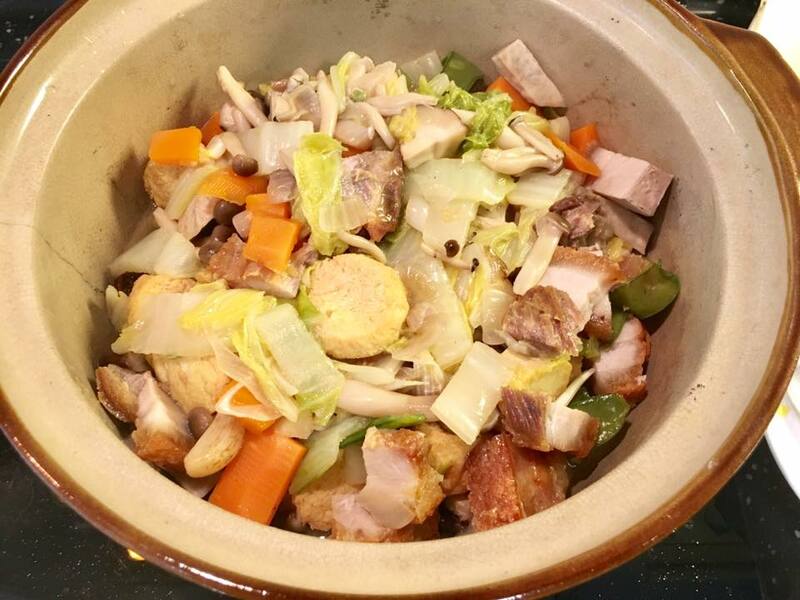 son had earlier joined my homecooked dinner 8pax for my friends on 24apr before i left for london & wales trip on 27.4.2017.
he liked the claypot rice & wanted to take claypot rice again this evening.. So did wife! so i cooked a 3pax dinner instead. i decided that though last minute, i should do something more than just claypot rice since it was mother’s day. 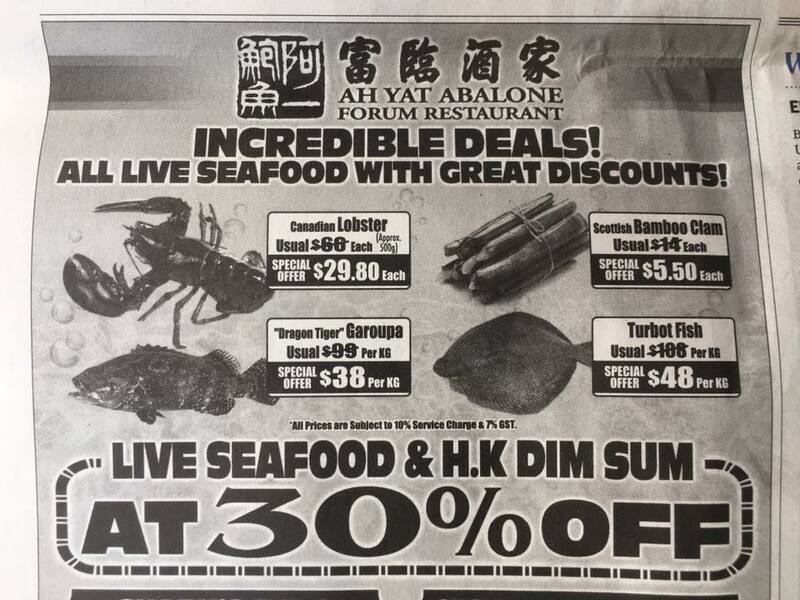 so i went to sheng shiong & got a 680g live lobster for S$41+. 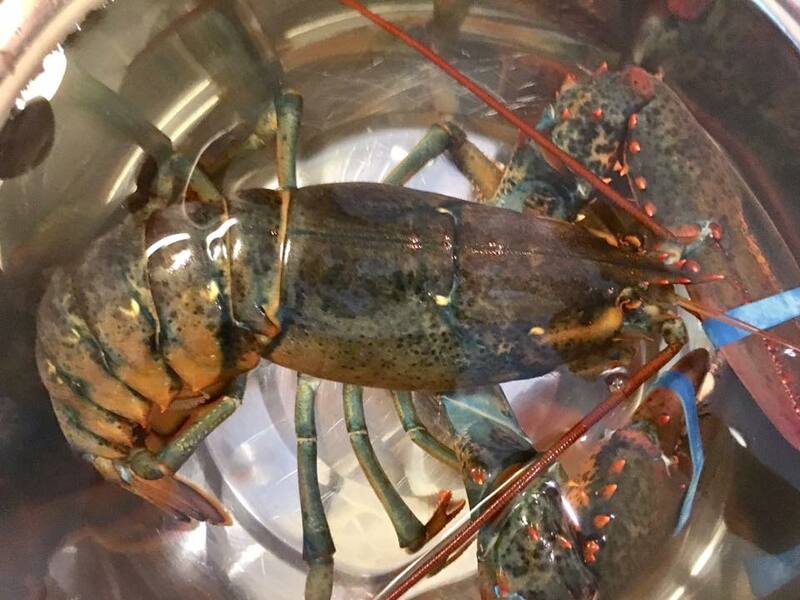 i made lobster in superior broth 龙虾上汤焗 this evening. this the second time i made this dish & this time it was excellent. perhaps not comparable with kai gardens (above photo). 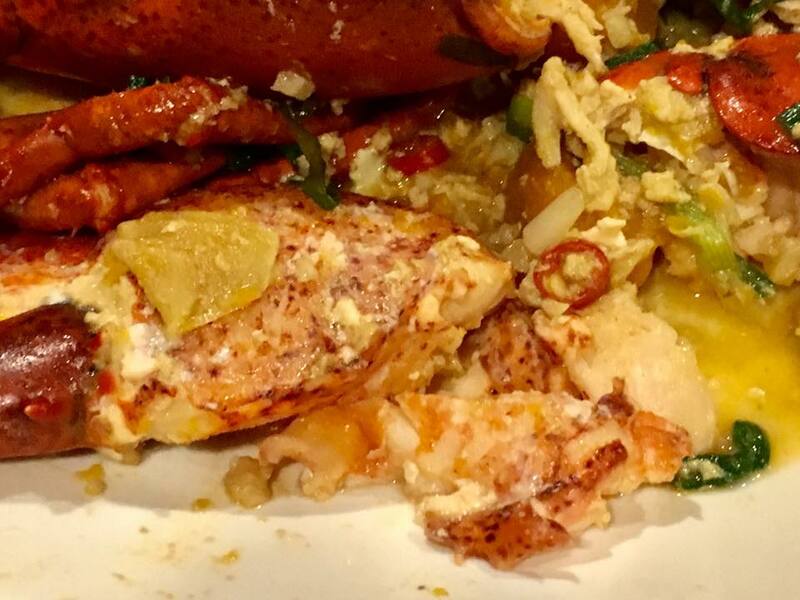 of course live lobster & done correctly & right texture not old or overcooked always very sweet, bouncy & tasty. but also the superior broth 上汤 is the key! i had chicken stock (chicken bones boiled with carrots), then added the lobster shells & reduced to very intense broth, very tasty & flavourful. 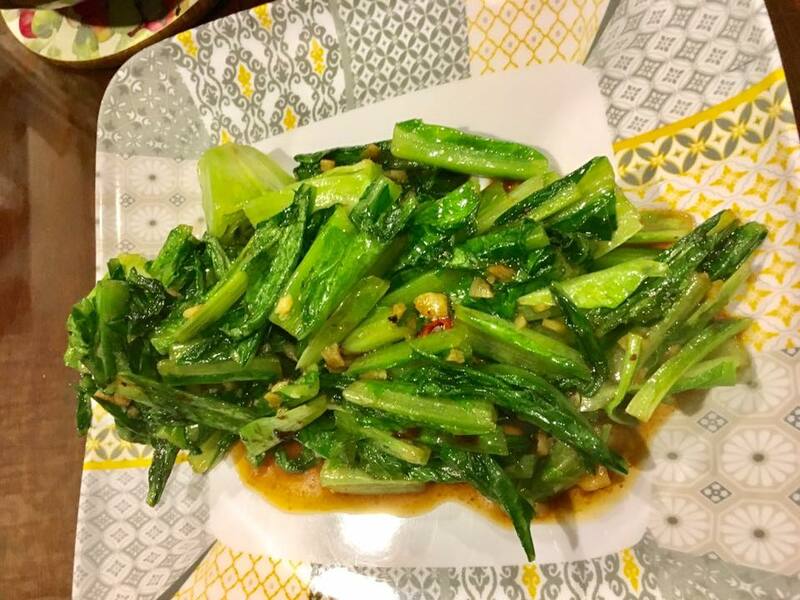 & my usual stir-fried vegetable dish. this evening, i made romaine lettuce, my wife’s favourite! after dinner we had some cheese. 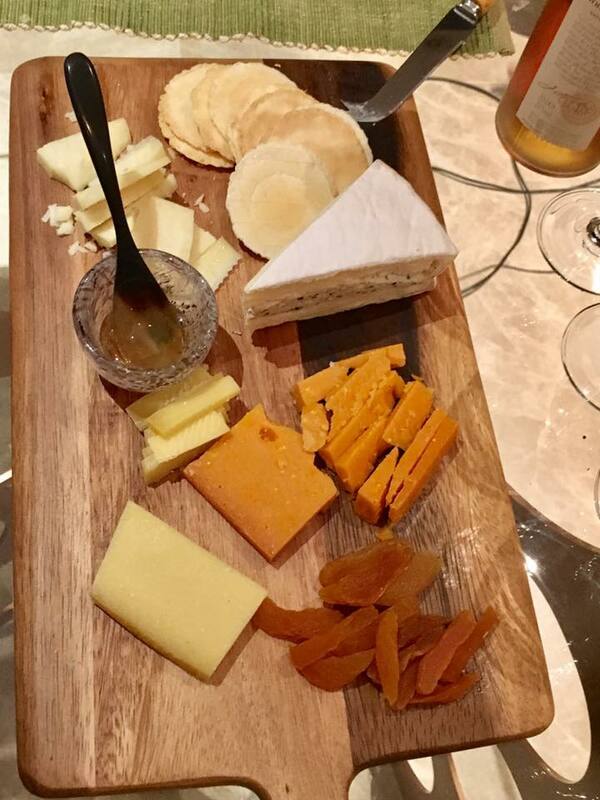 very nice cheese especially with the truffle honey dip. excellent! 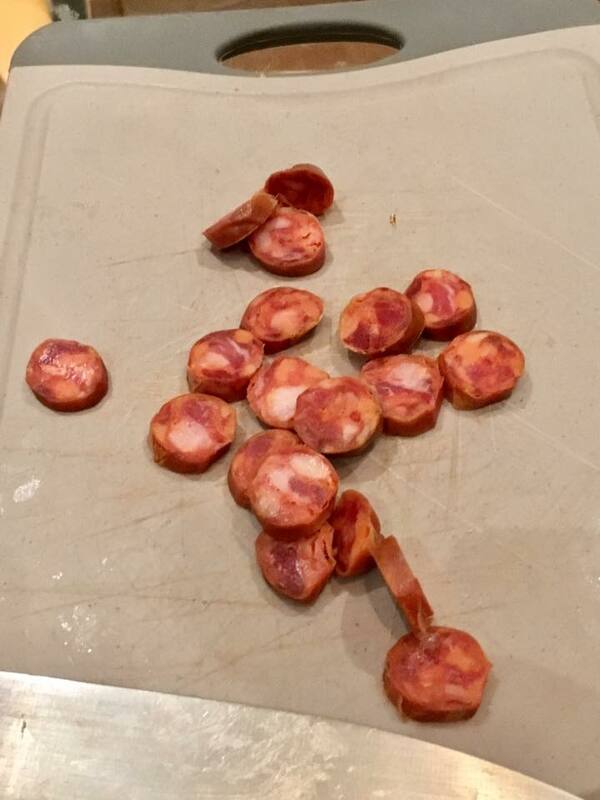 son brought back a few type of chorizo from porto. we started with the cheaper lot. but this lot really not too good. will open the better ones when when have more pax. 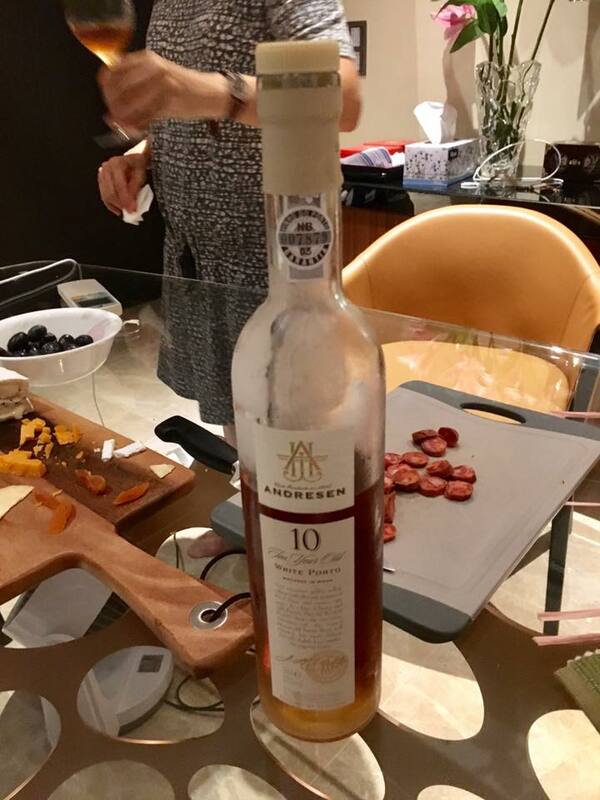 and the cheese & chorizo were perfect with the white port (which has the whiskey fermentation stopper added). 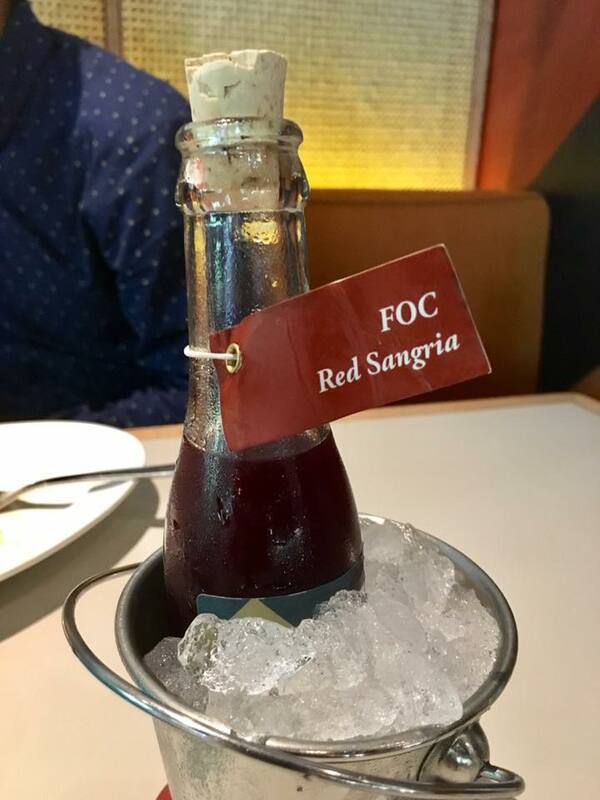 this really excellent port! 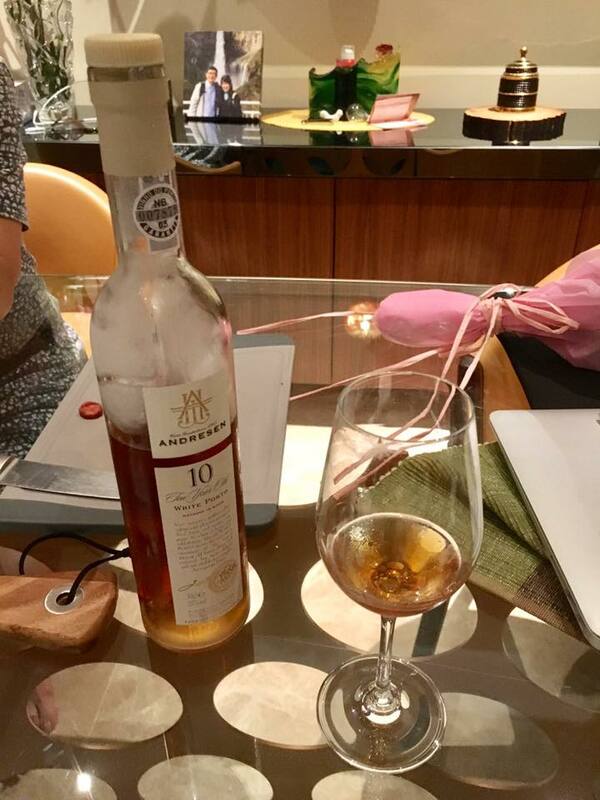 we had that during our holiday in porto, and we all love it, so son brought back a bottle from porto for my wife. a simple 3pax dinner put together for mother’s day, and a very good & enjoyable one! 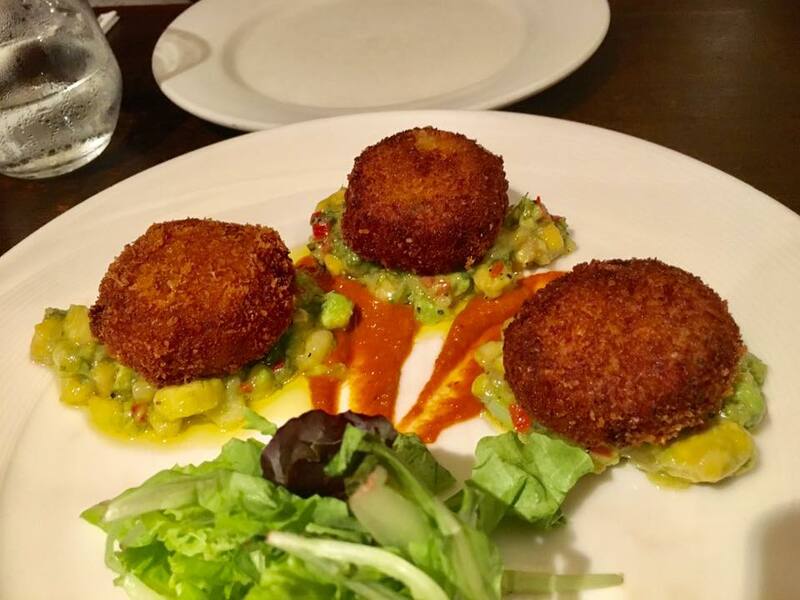 restaurant is by foc, which the family quite like, & we have been to foc several times, the last on 18.8.2016. & the tables in the quite spacious restuarant was well taken up. ordered a few drinks. son had sangria. i don’t drink. 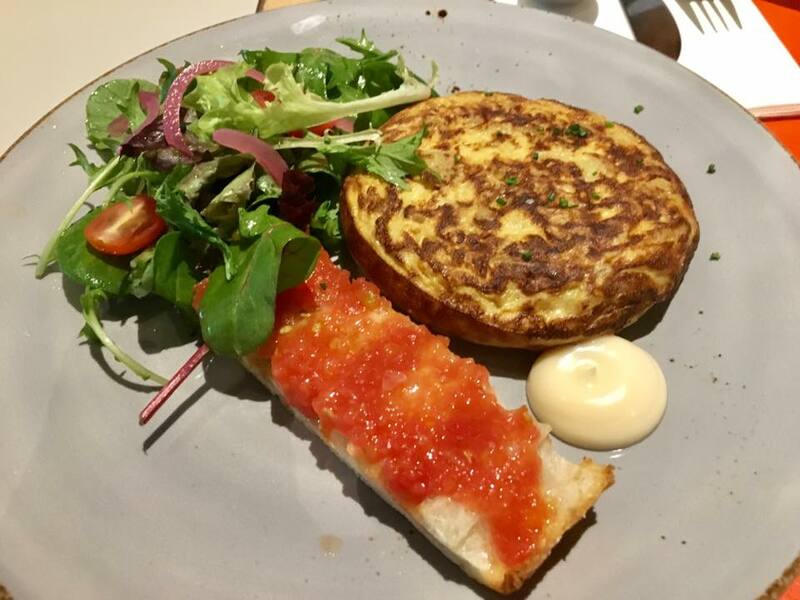 spanish torttilla or spanish omelette? 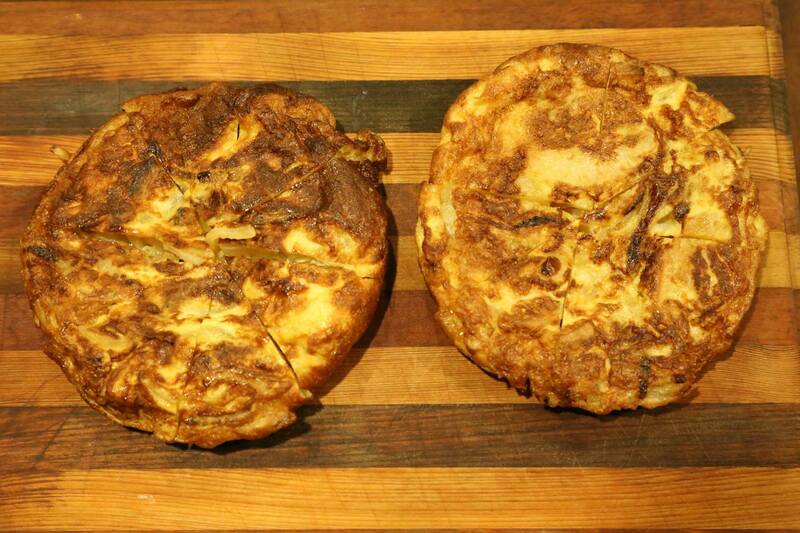 this “tortilla” is NOT the mexican flat bread, but a spanish omelette with onions & potatoes. it was competently done but really no better than my very own spanish omelette. 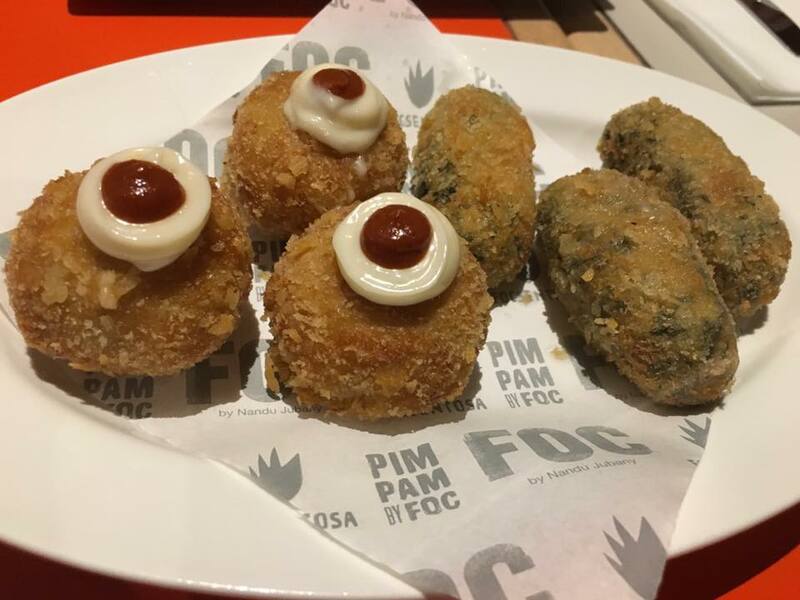 we ordered the ham, crab croquetas (S$2.50 each, minimum order of 2) & spinach & pine nuts (S$2 each, minimum order of 2). all were nice. the spinach pine nuts were the best. 🙂 the other 2 not as good as foc. 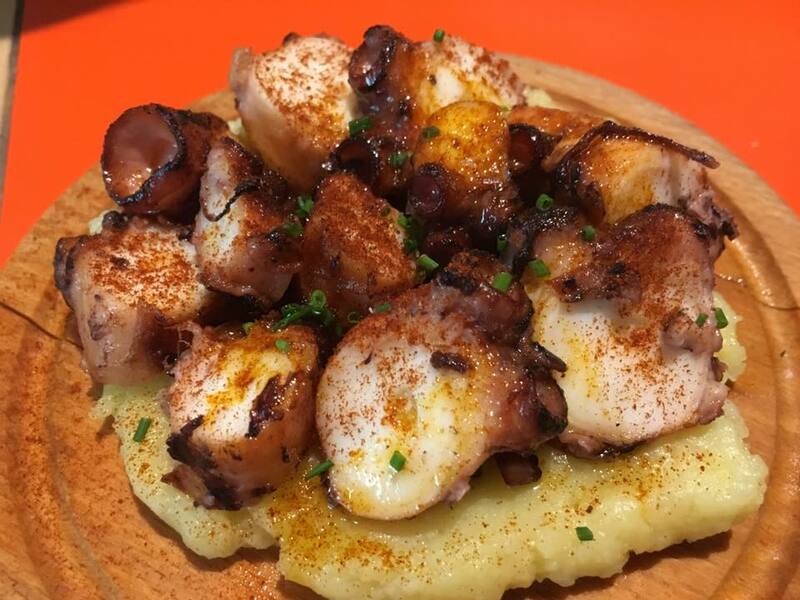 we ordered the grilled octopus. 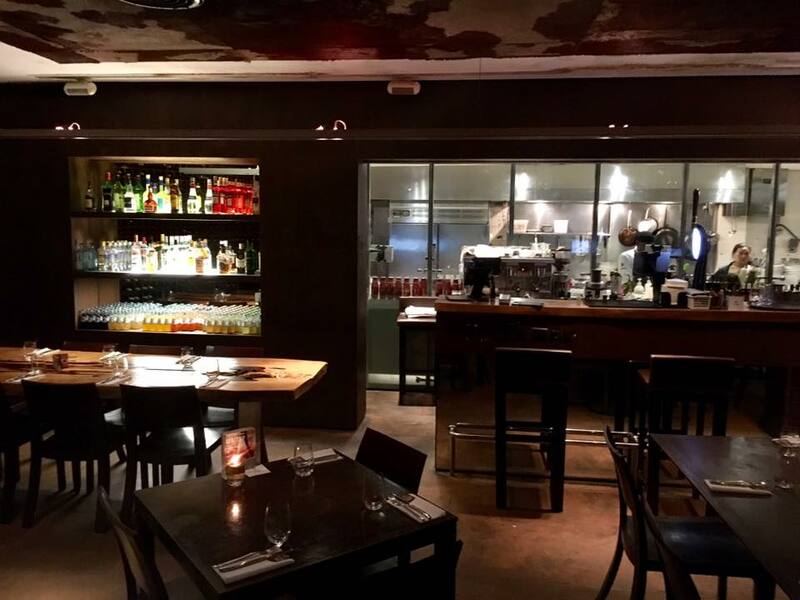 it was pretty good, just not the standard of what we had in italy, and more recently what i had at Maze by gordon ramsay in mayfair london. 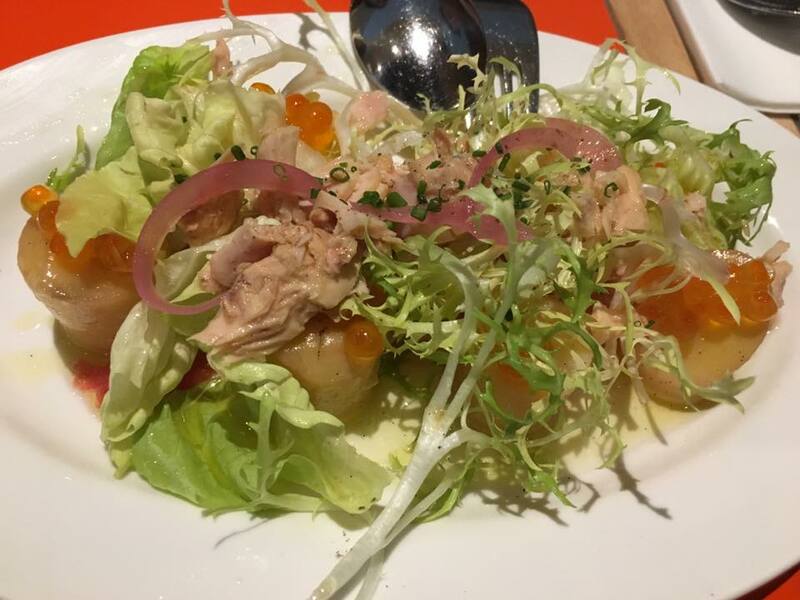 tuna confit salad was pretty ok too but a rather insubstantial dish. 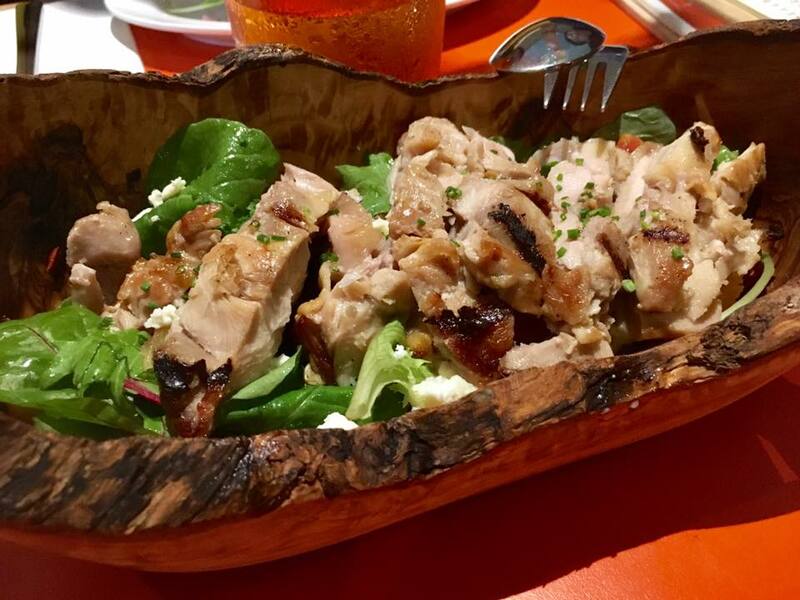 the pumpkin with added grilled chicken was good. the pumpkin mash was good too. my youngest daughter liked it very much. for me it was no better than the grilled chicken my helper or I made. 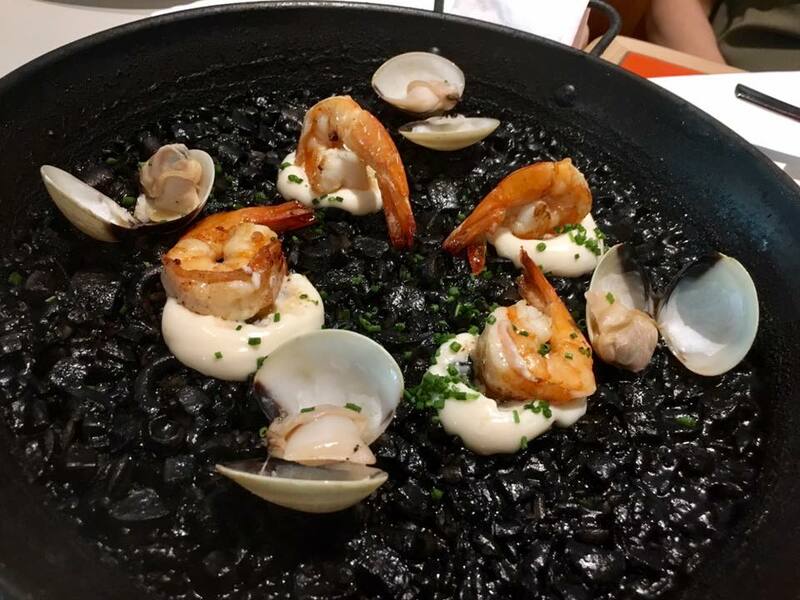 the squidink paella was quite excellent! 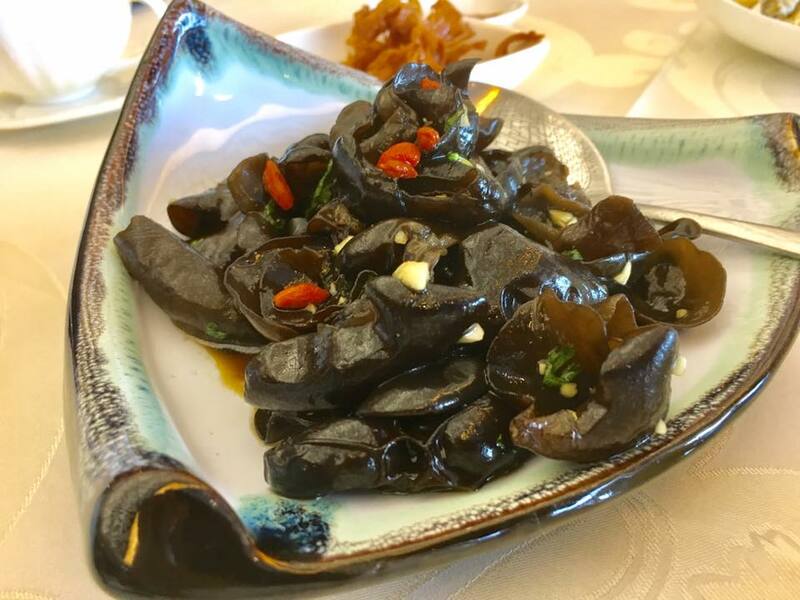 very flavourful, intense squidink flavours, creamy. a very nice dish..
i had wanted the scampi fiduea we had at foc, but they only chicken fiduea here, and the others were not keen. overall the paella here not quite foc standard. 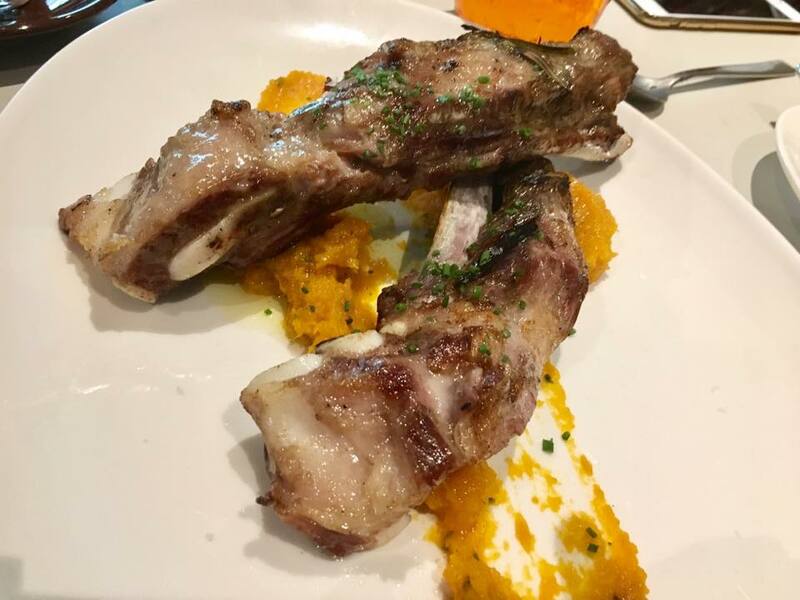 another must-have at foc was the iberico pork ribs. just as good as foc i think. 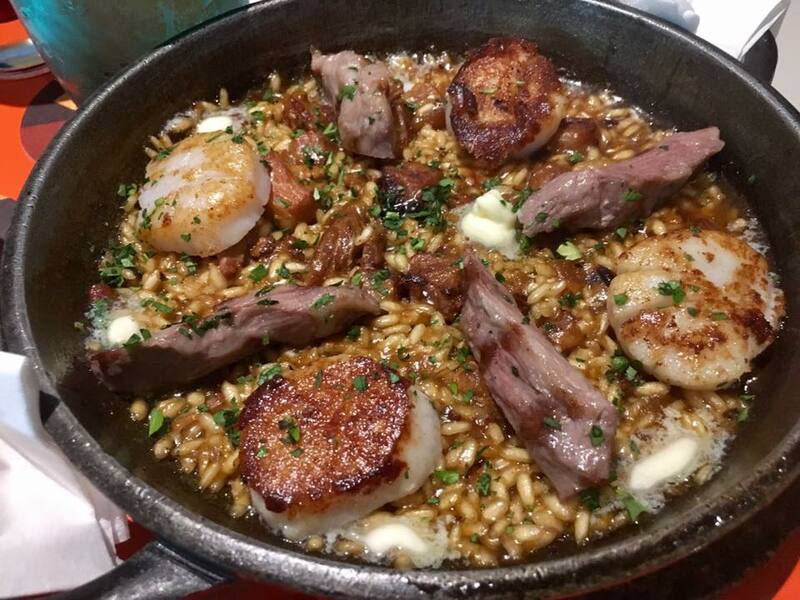 very tender, great flavours, not the very porky taste in the paella dish. somehow less wow c/w foc, maybe just psychological. 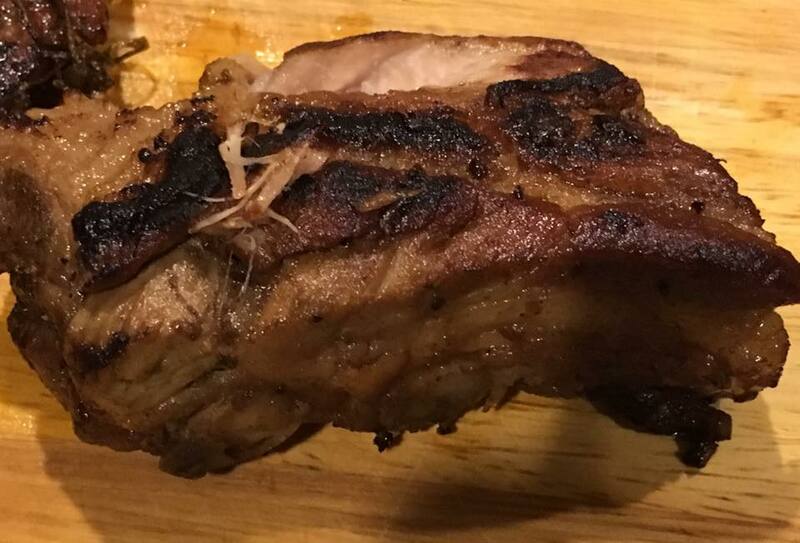 i made a very good mock kurobuta using frozen pork prime ribs after being inspired by this iberico pork rib dish in foc. 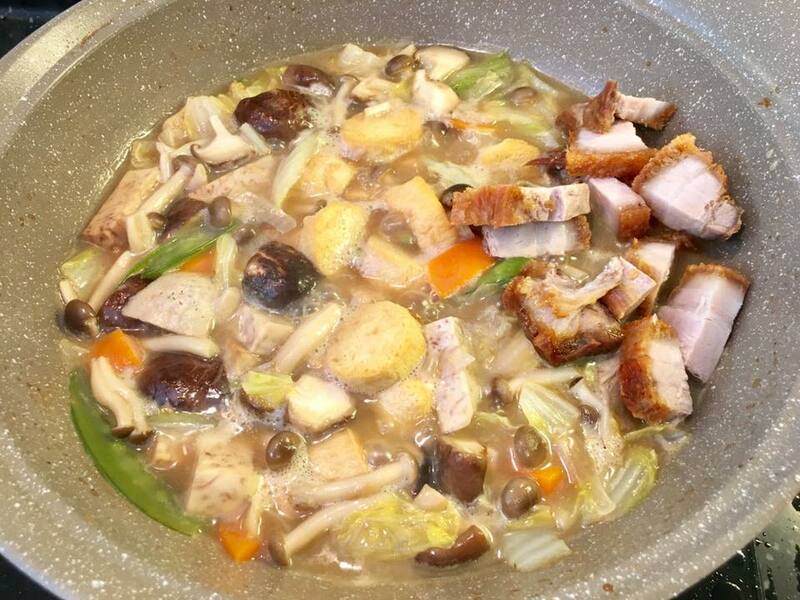 & my mock kurobuta was very good really for a frozen non black pig. maybe will try this again with pork soft bones. we ordered the tallata. 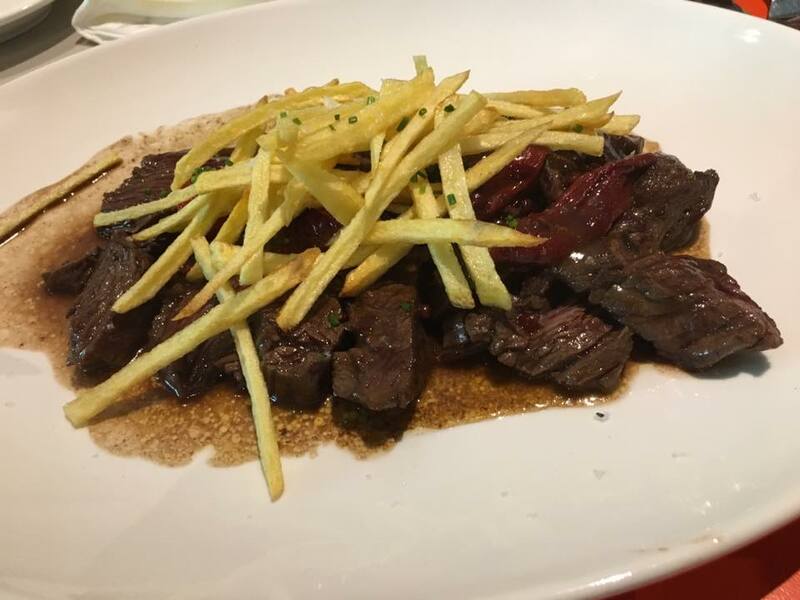 i guess this is the spanish take of the italian tagliatta (cut or sliced). & they did NOT have the excellent rack of lamb they had at foc. 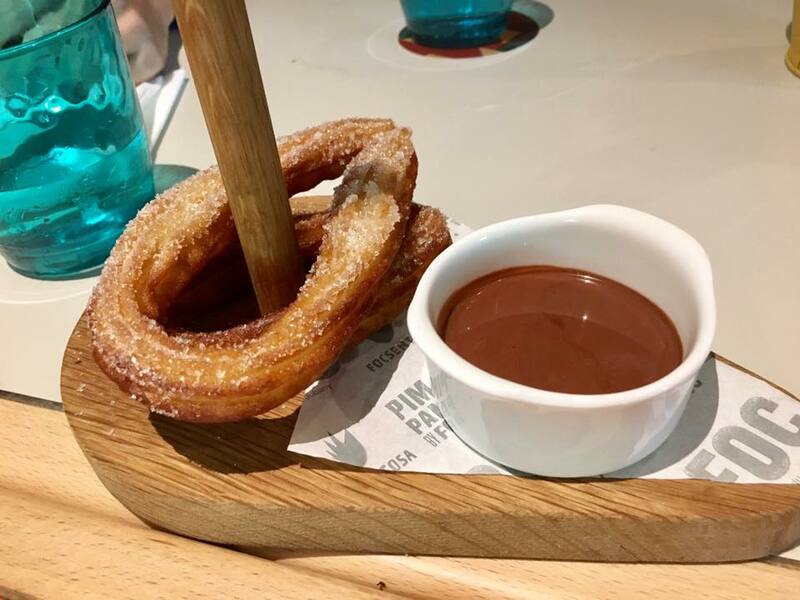 supposed to have good churros here. anyway chrros NOT my kind of food. the “magic” (daughter said it was between latte & cappuccino) was very good. 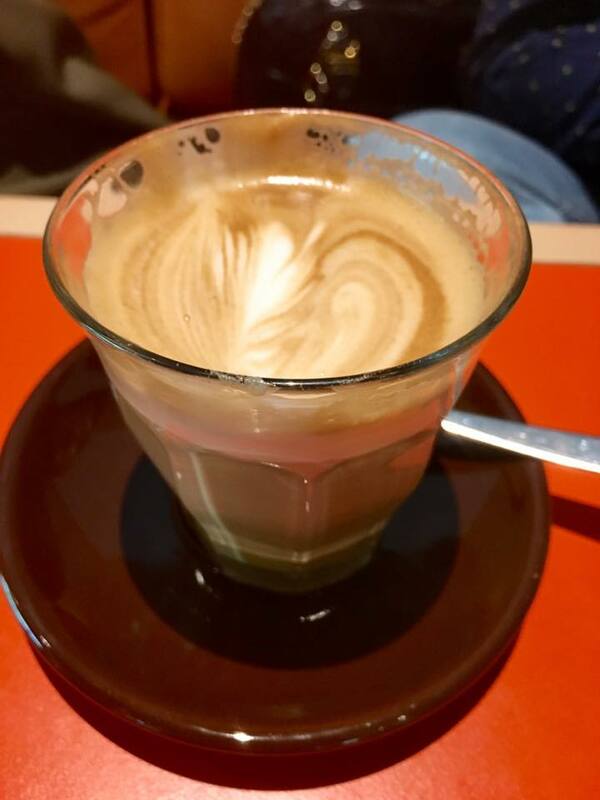 for me it’s a very good flat white, nice coffee aroma & very silky smooth, what a good flat white should be. not sure it was any better than say dutch colony. about same i think. dinner was like S$299 for 7pax, not too ex. we ordered few drinks. 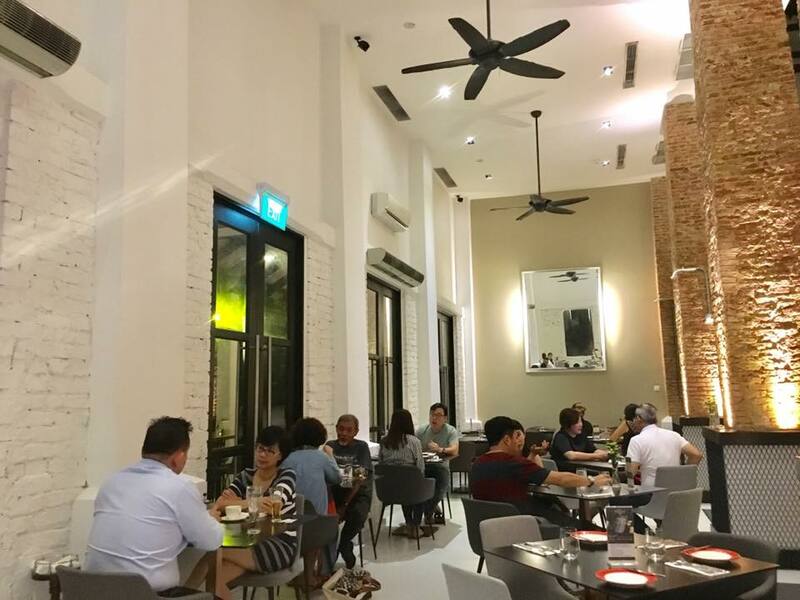 overall ok especially this was mother’s day dining out, and this is one of the places we will go for such dining out which does not charge extras for occasions. for me, given a choice i would go foc & NOT pimpam. 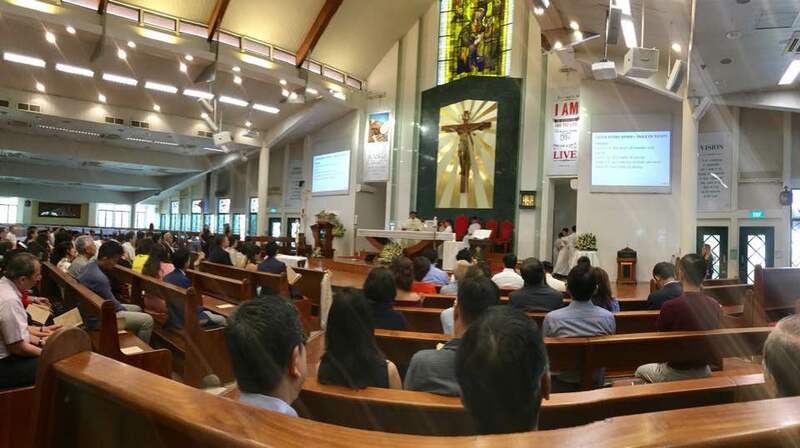 one of the first “event” after returning from our immensely fun & memorable holiday in london & wales (for me 27apr to 12may2017 arriving evening of 12may) was a good friend’s son’s wedding on 13.5.2017.
it was held at the Church of Our Lady of Perpetual Succour. 12 of us RI friends attended. we had a reception after the church ceremony & took many photos with the happy & proud parents & also with the wedding couple. afterwards 8 of us went to killiney kopitiam siglap to have a cuppa. another friend staying nearby who was unable to go for the wedding during to prior commitments joined us for coffee. this my close RI friend. we have been meeting quite regularly for the last few years, after a small group of us started to meet up with the 2010 world cup viewing. old friends are always fast to get together even after many years of not being in contact. still, spending more time together, sharing & doing things together do make a difference. and among this group of close RI friends, we have been doing that more regularly the last few years. this friend in particular has been to many of my home dinners. usually/always, he makes an effort to come earlier & chit chat a bit. we also helped out at newgate learning hub bread of life (BOL) saturday community breakfast last year in 2016 with 2 other RI friends. i cooked total of 14times for BOL breakfast dish, the last on 8.10.2016.^^ the program ceased last year, for time being. we now also do an almost monthly birthday get-together among this group of friends. it’s always a good feeling to see the young ones starting out in life, seeking & finding what they want, and the union & happiness that are theirs for a lifetime.